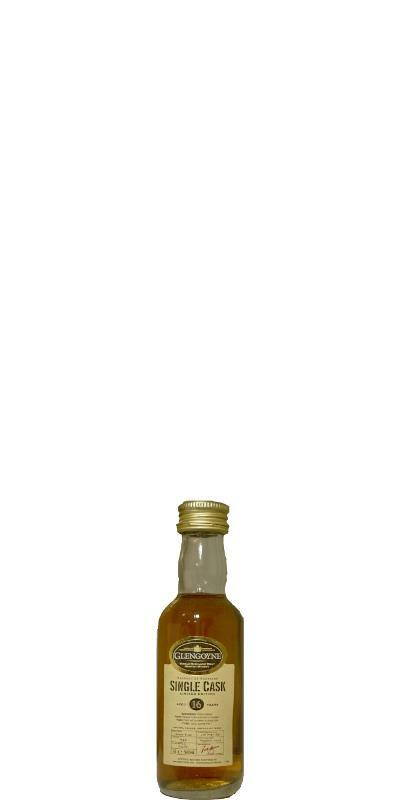 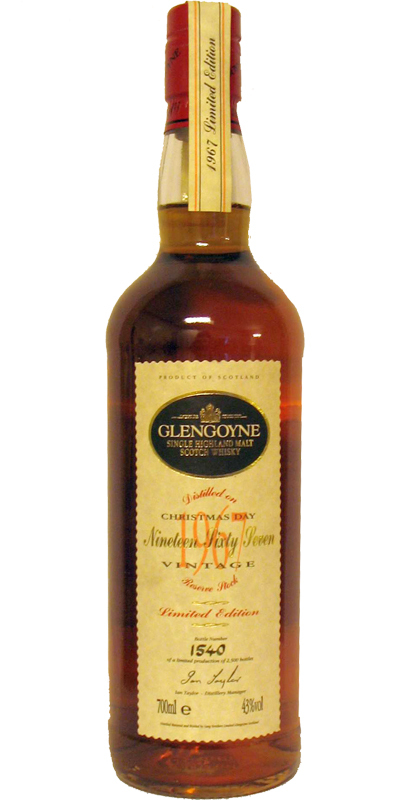 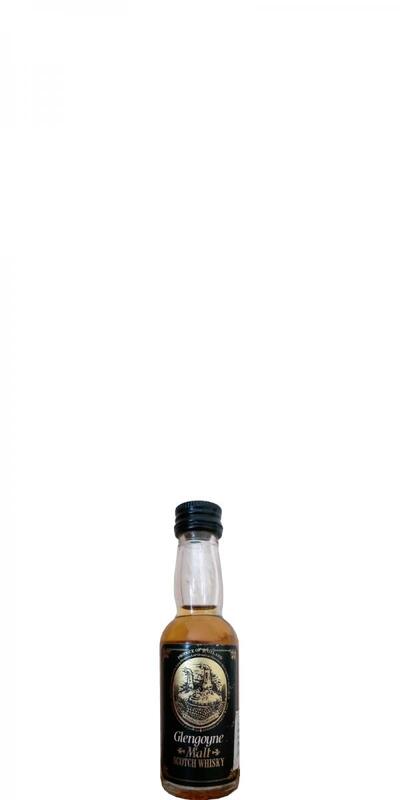 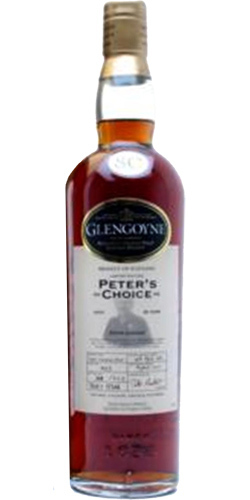 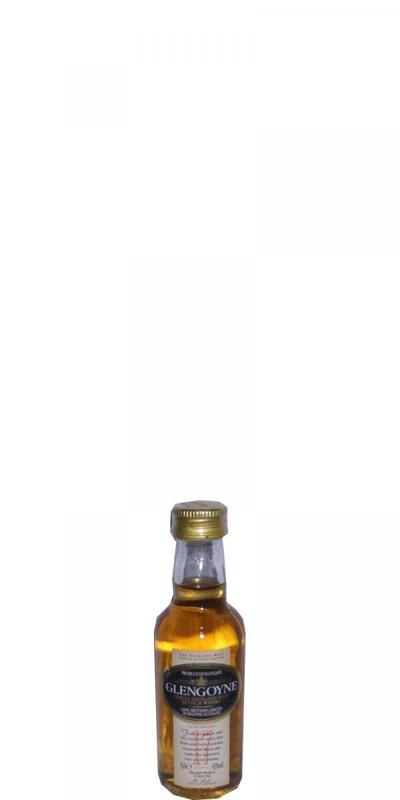 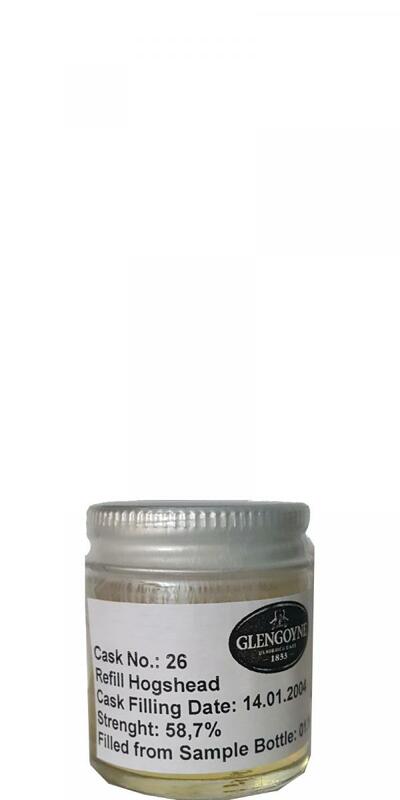 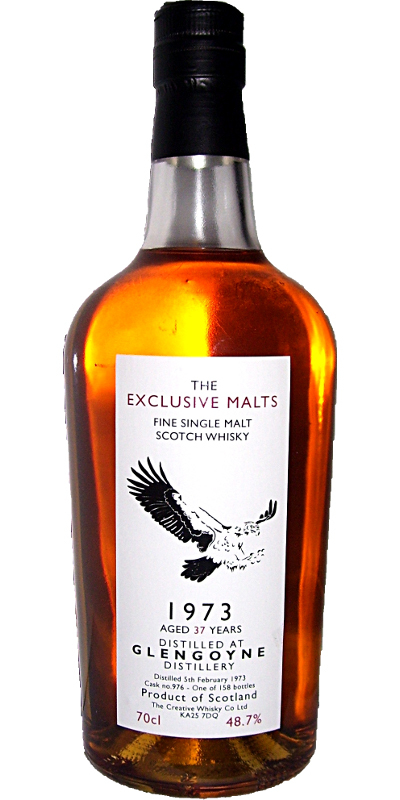 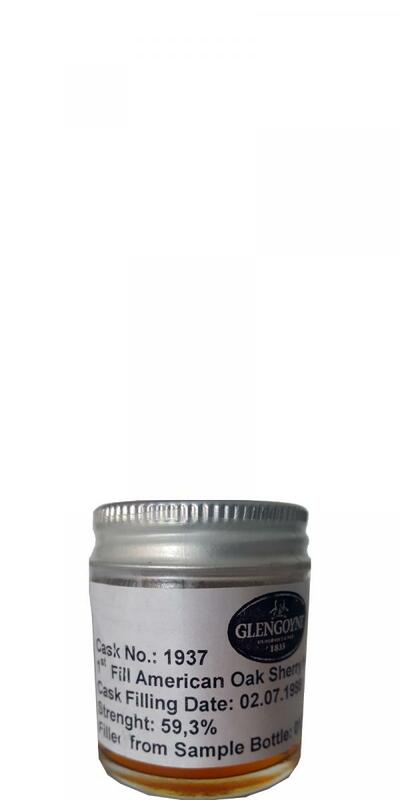 Glengoyne 08-year-old Pure Malt - Screw Cap 08 40.0 % Vol. 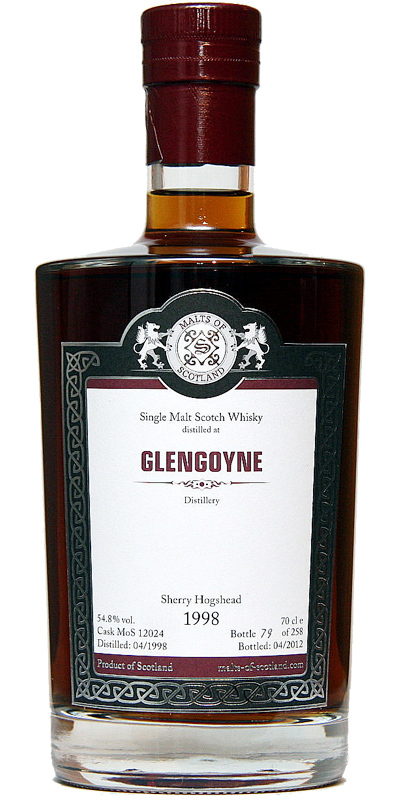 Glengoyne 08-year-old Malt - Black Label 08 43.0 % Vol. 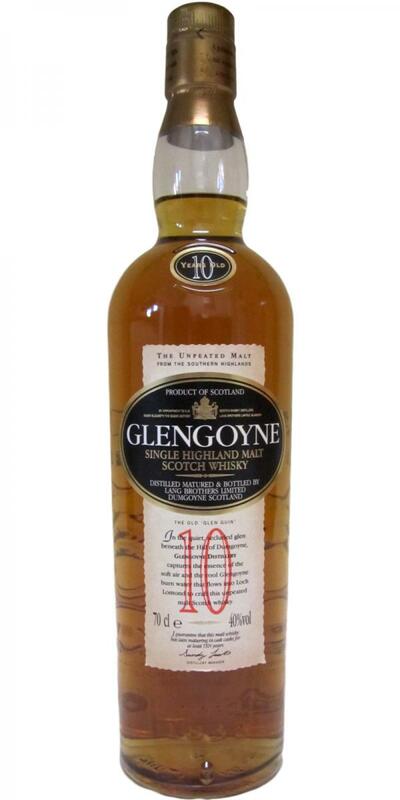 Glengoyne 10-year-old 10 43.0 % Vol. 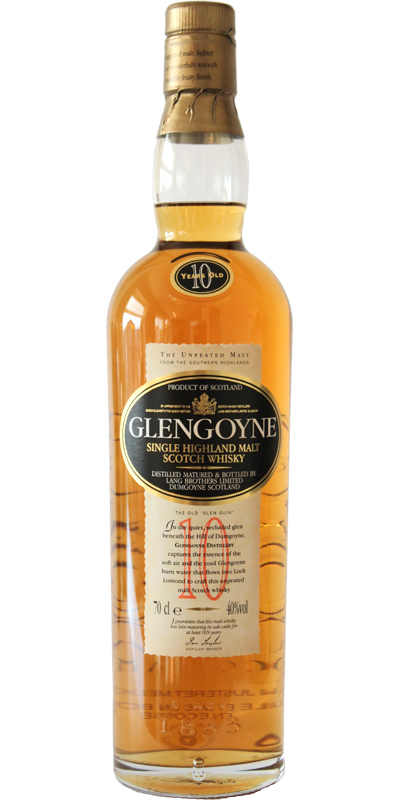 Glengoyne 10-year-old Red Ten 10 40.0 % Vol. 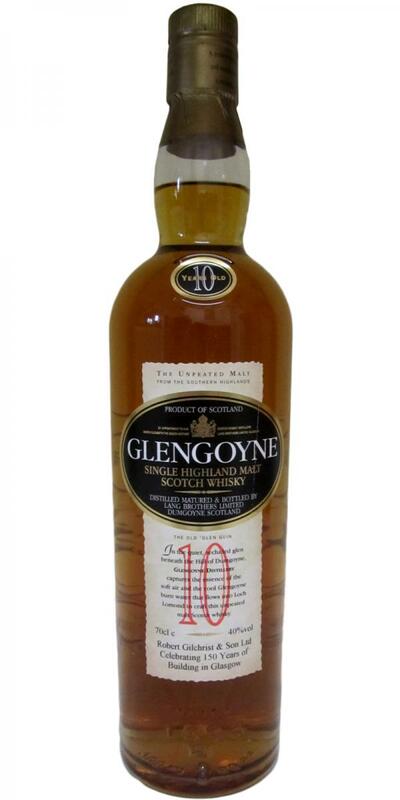 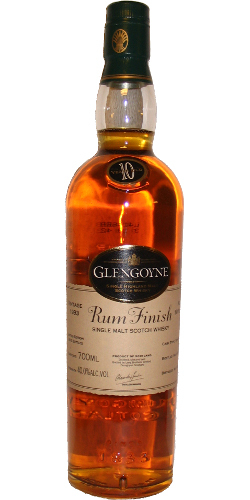 Glengoyne 10-year-old Red Ten 10 43.0 % Vol. 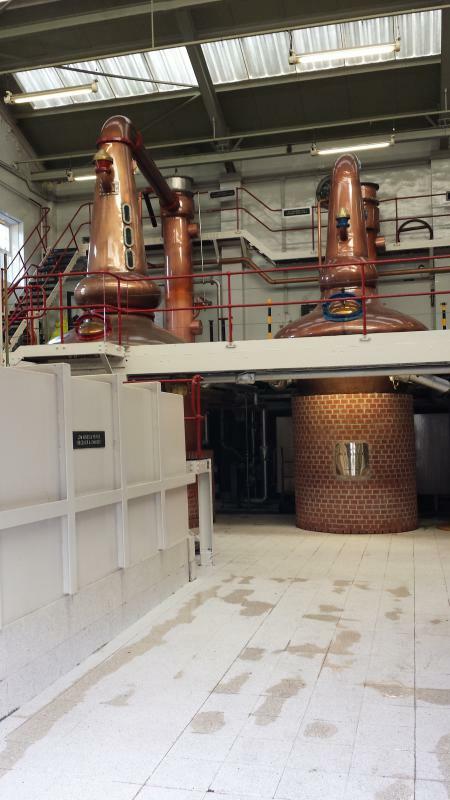 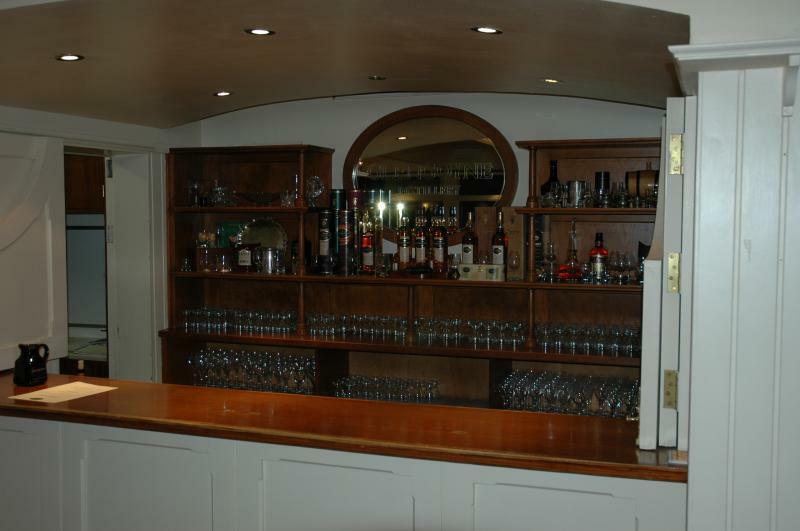 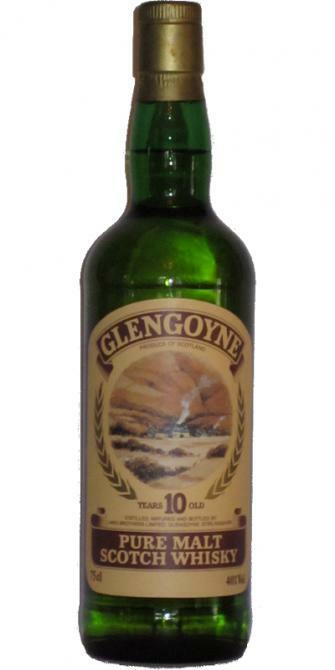 Glengoyne 10-year-old for the Wedding of Yvette Morris to Alan Goldberg 10 40.0 % Vol. 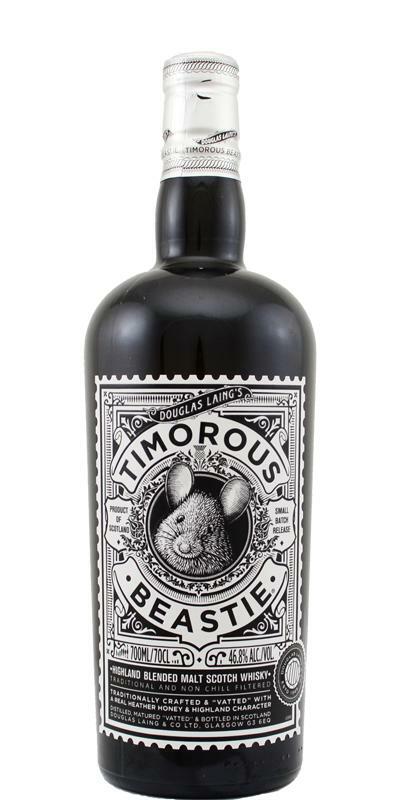 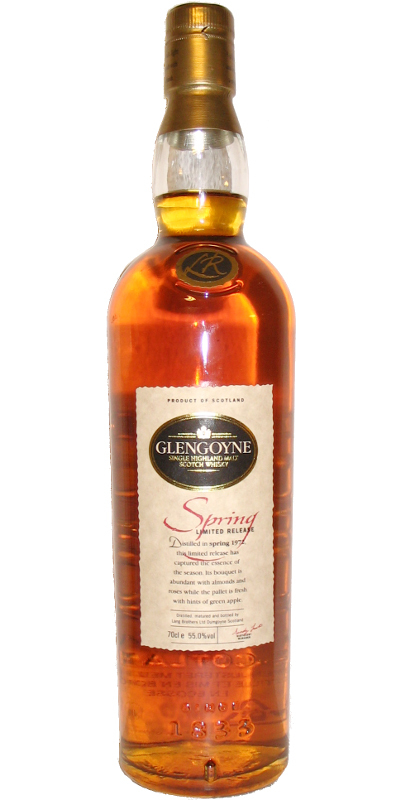 Glengoyne 10-year-old Jolomo Spring Limited Edition 10 40.0 % Vol. 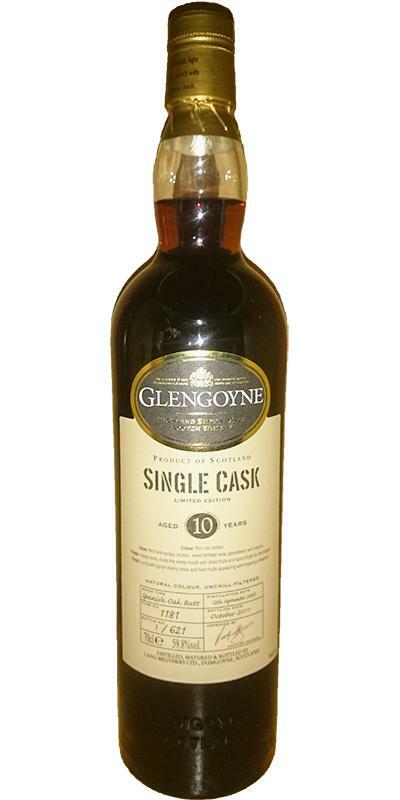 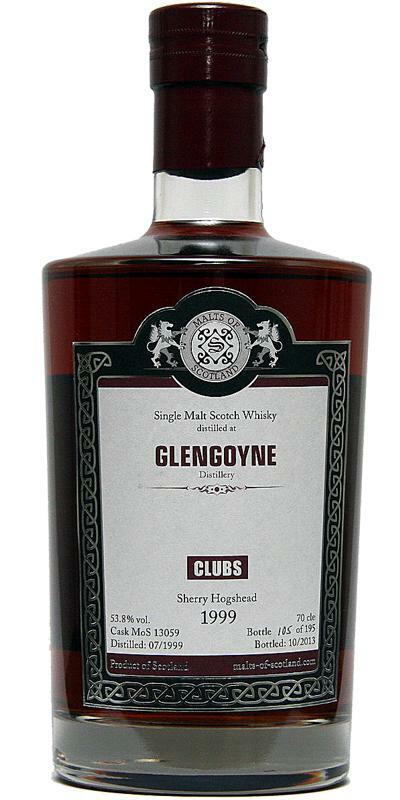 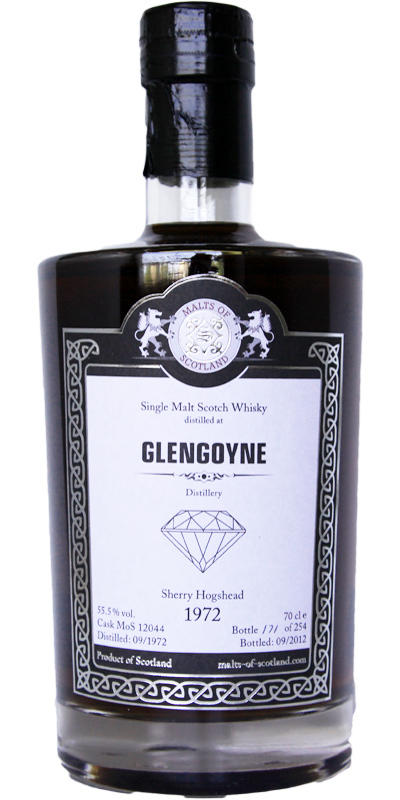 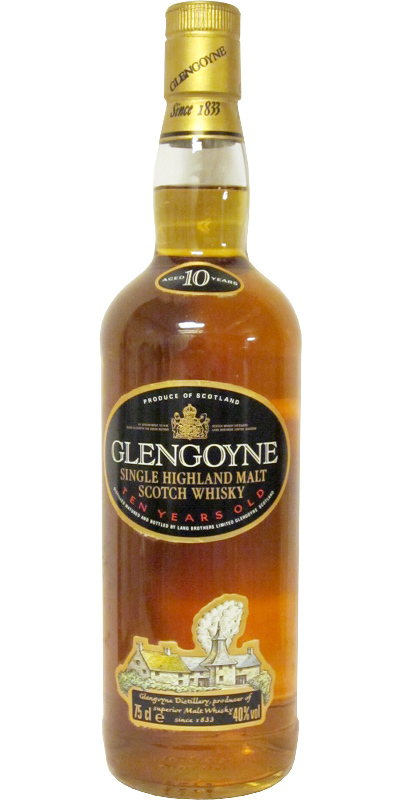 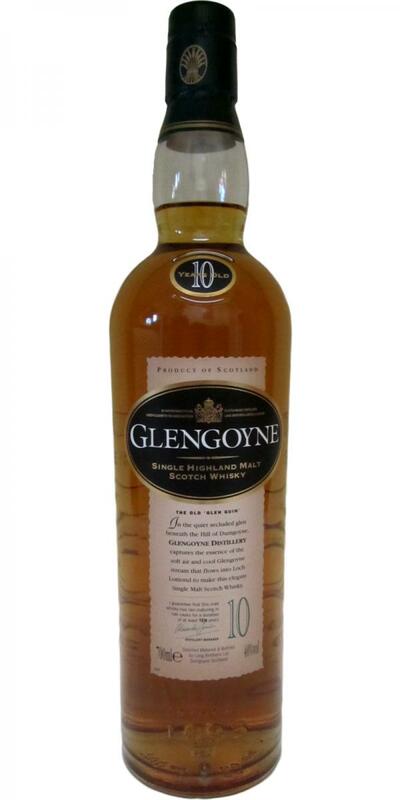 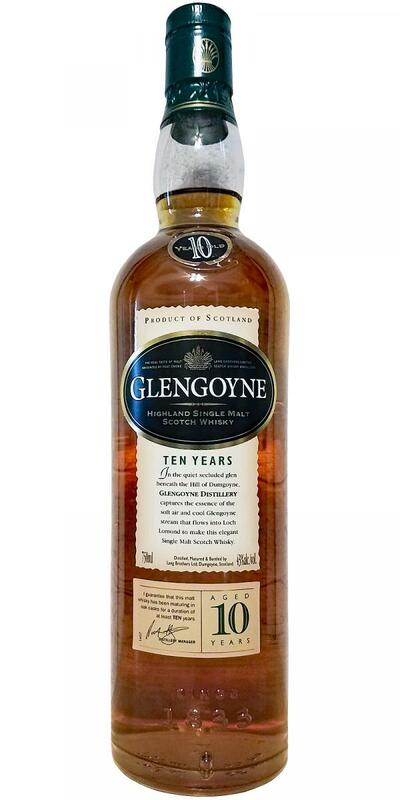 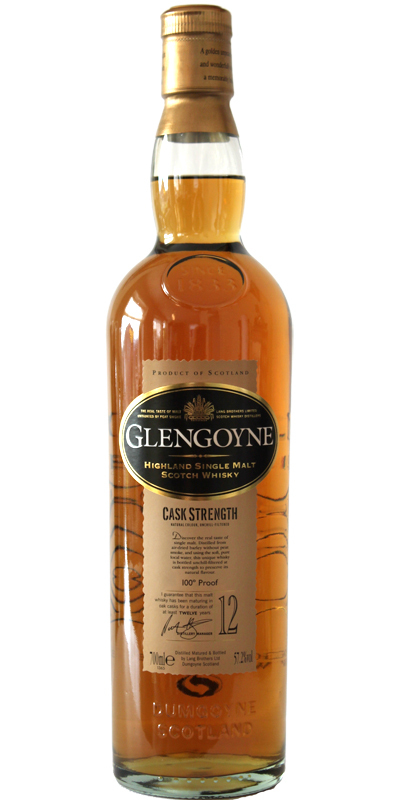 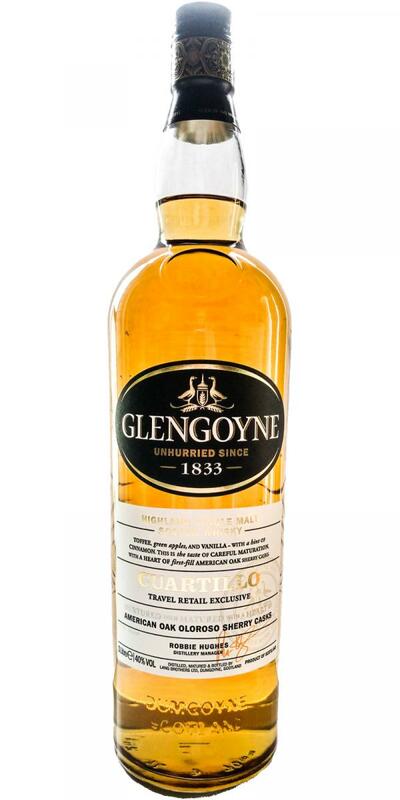 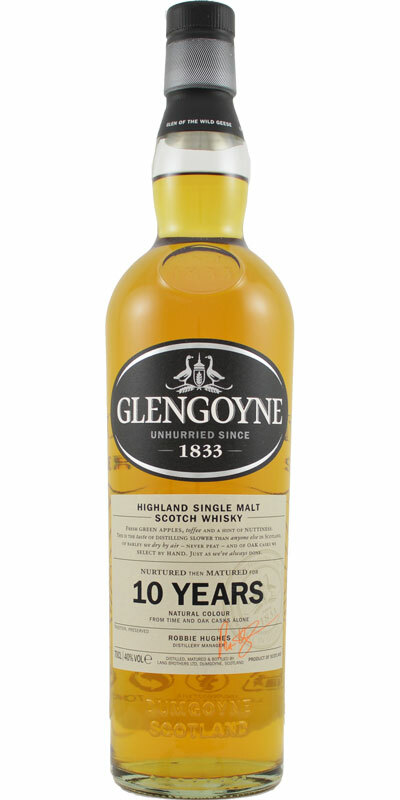 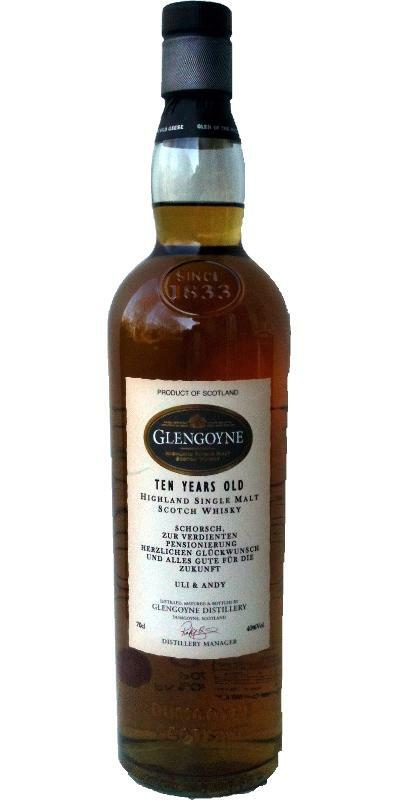 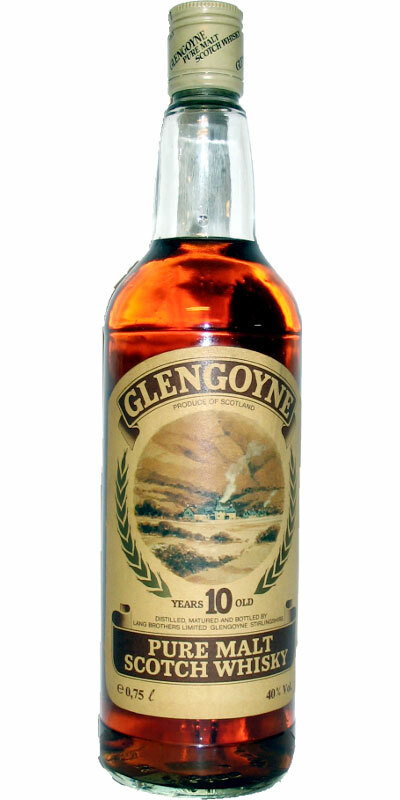 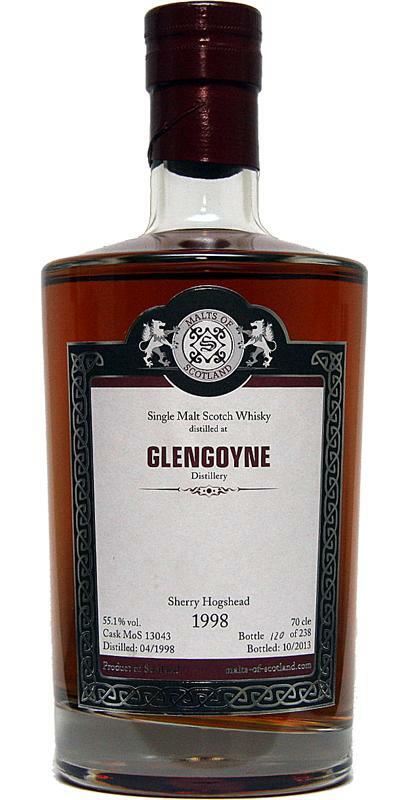 Glengoyne 10-year-old Ceramic Decanter Round 10 40.0 % Vol. 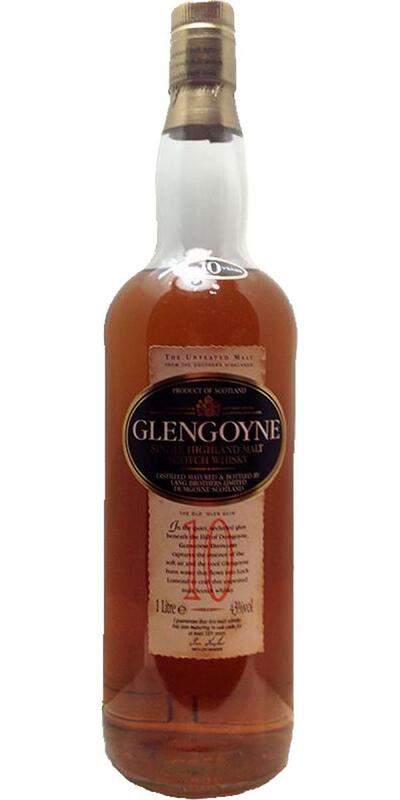 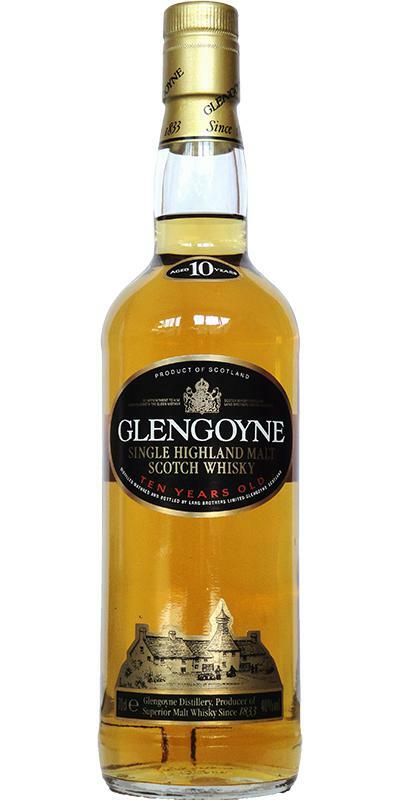 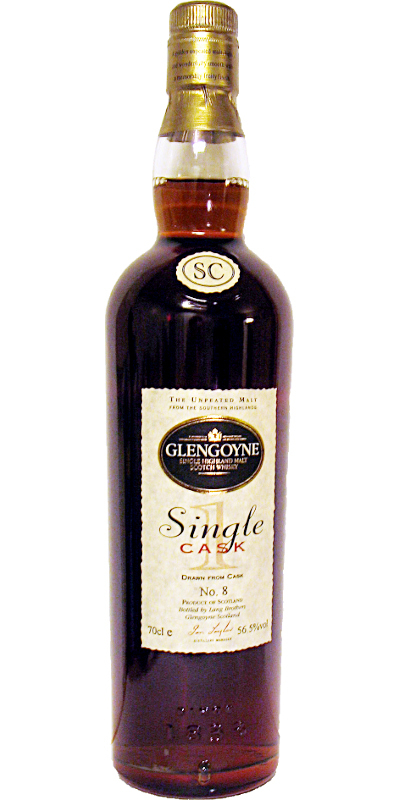 Glengoyne 10-year-old Single Malt - Screw Cap 10 43.0 % Vol. 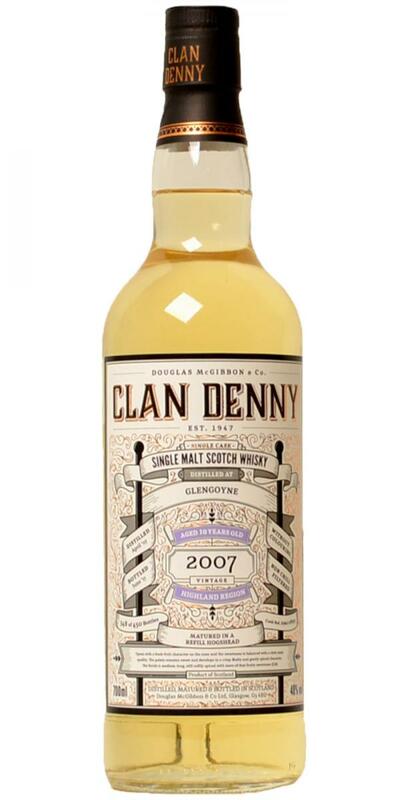 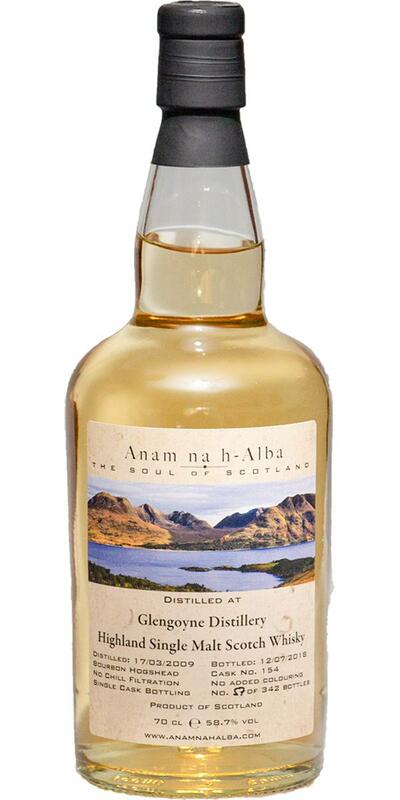 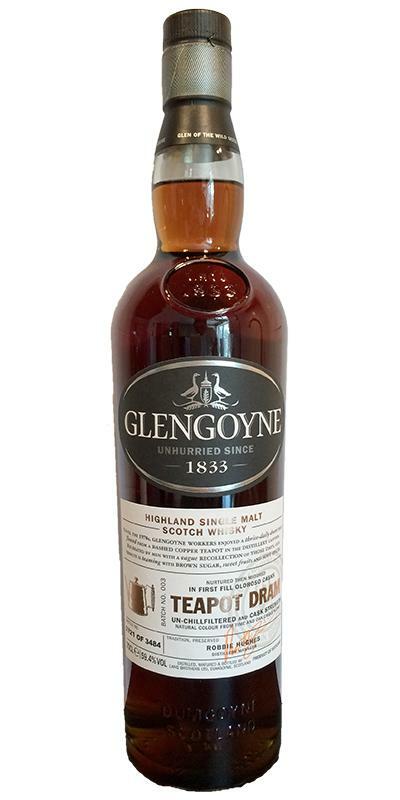 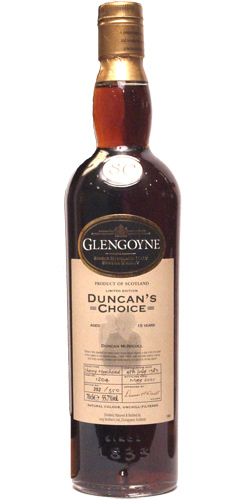 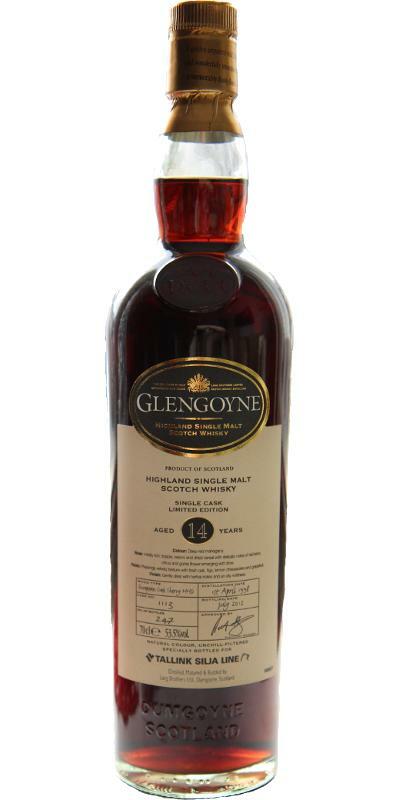 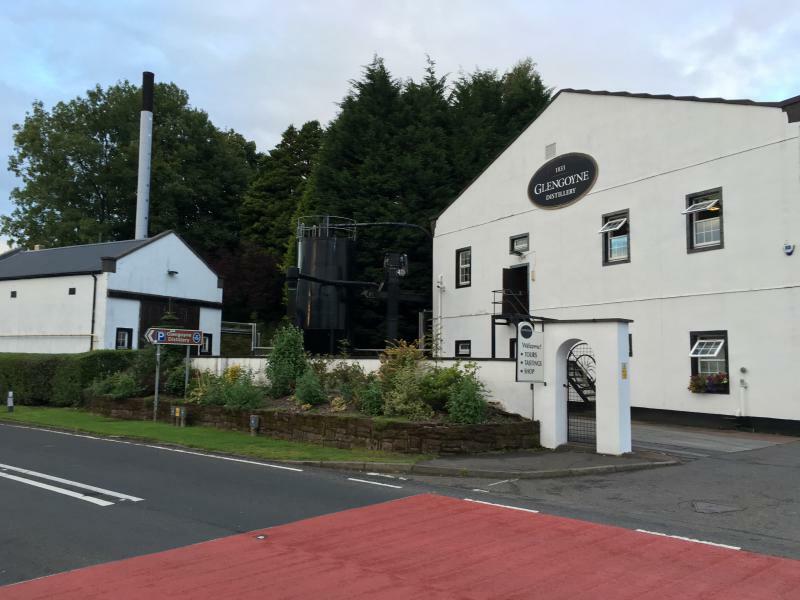 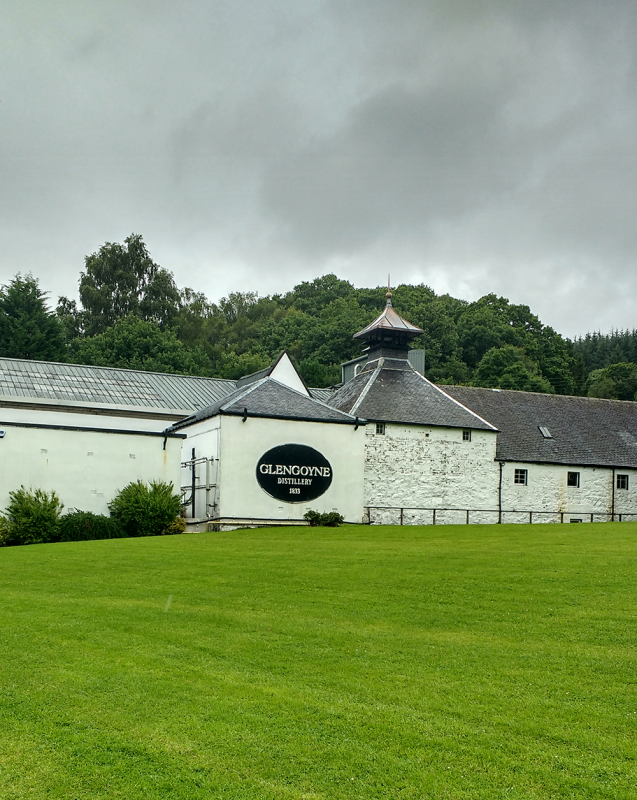 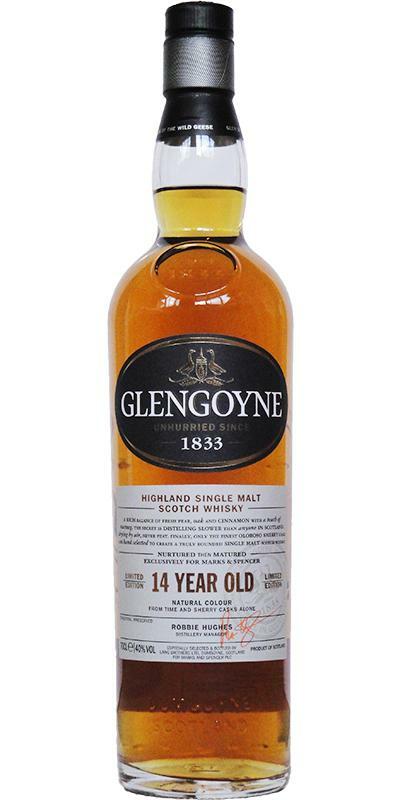 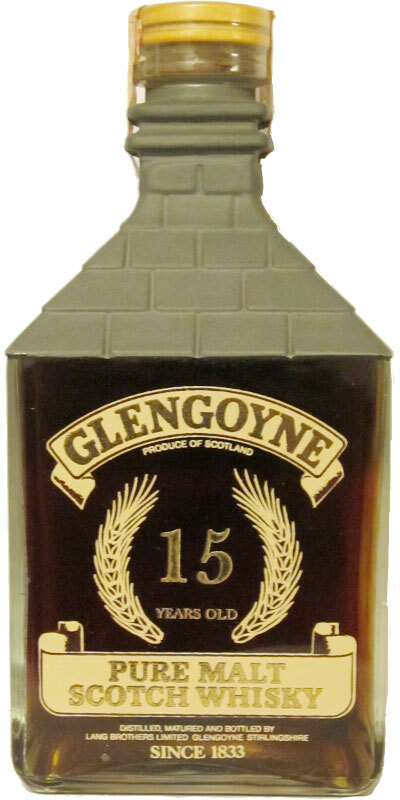 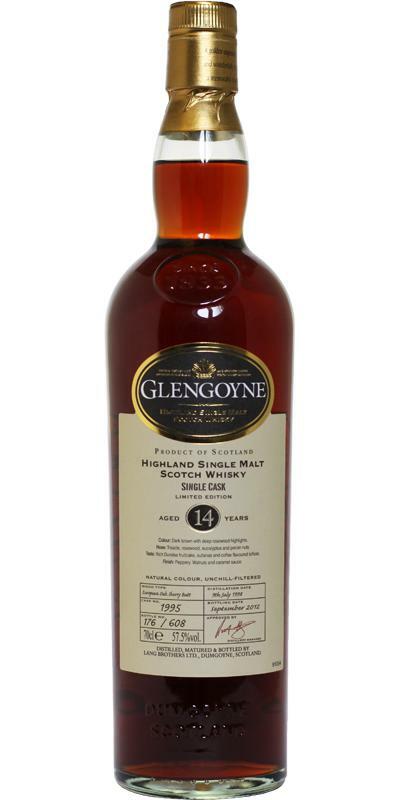 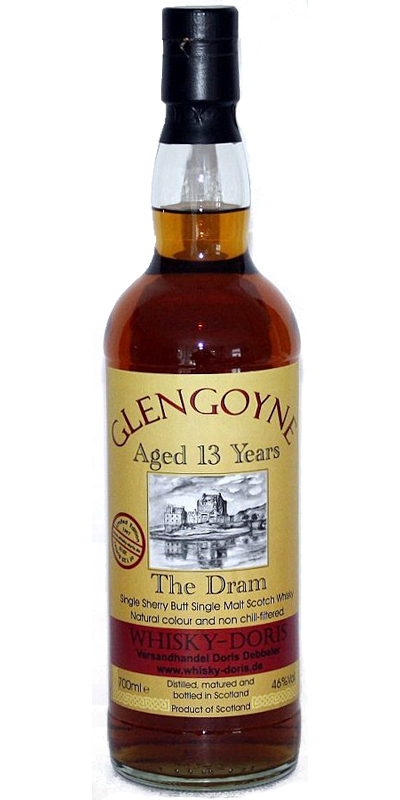 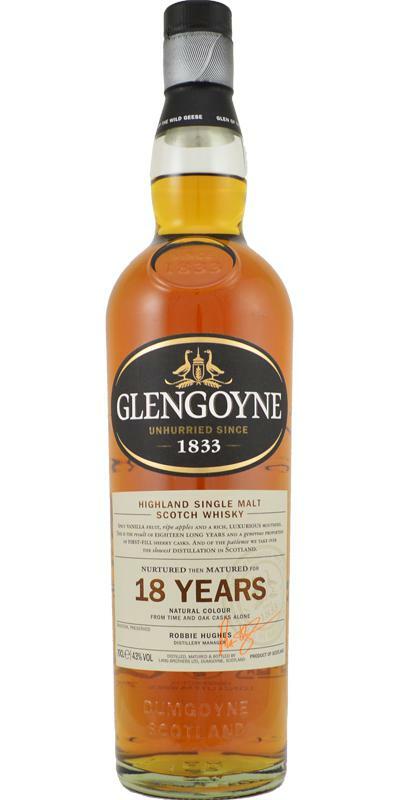 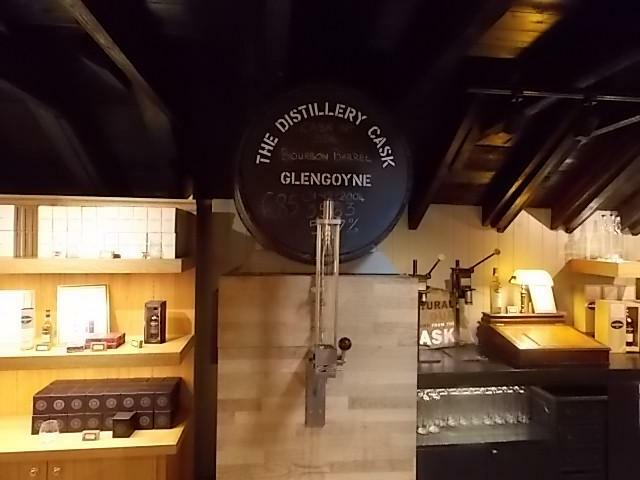 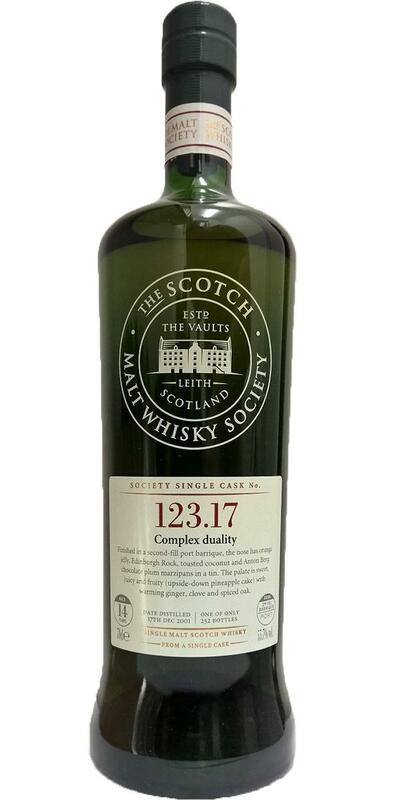 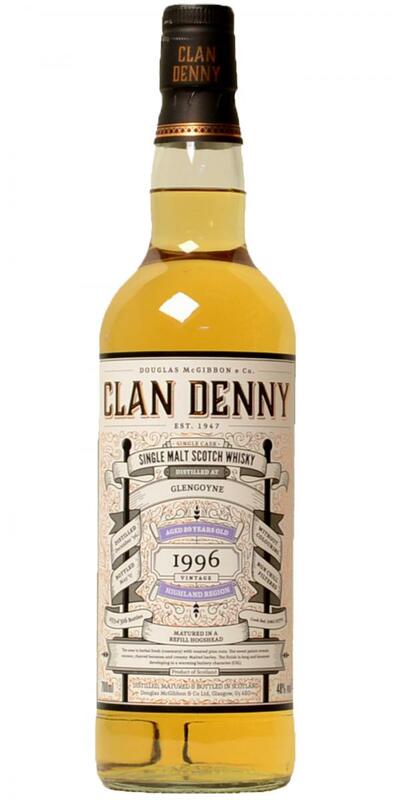 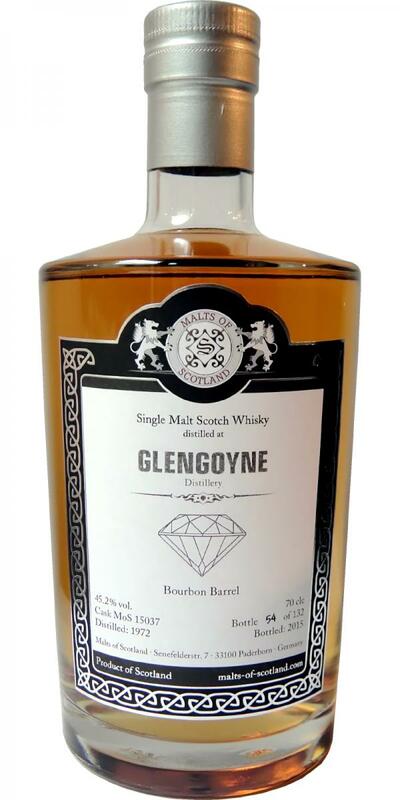 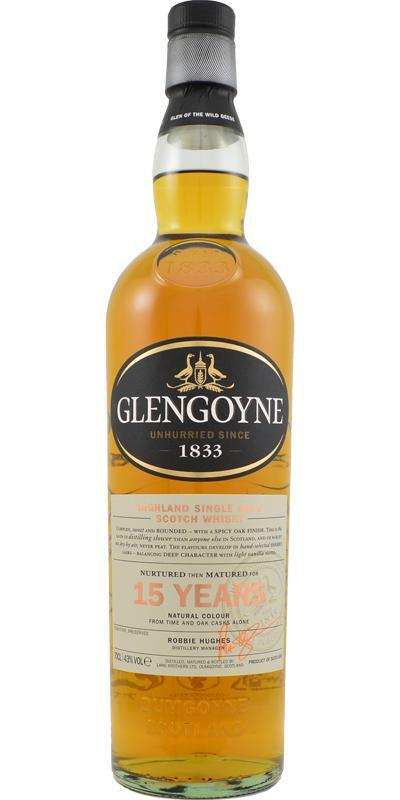 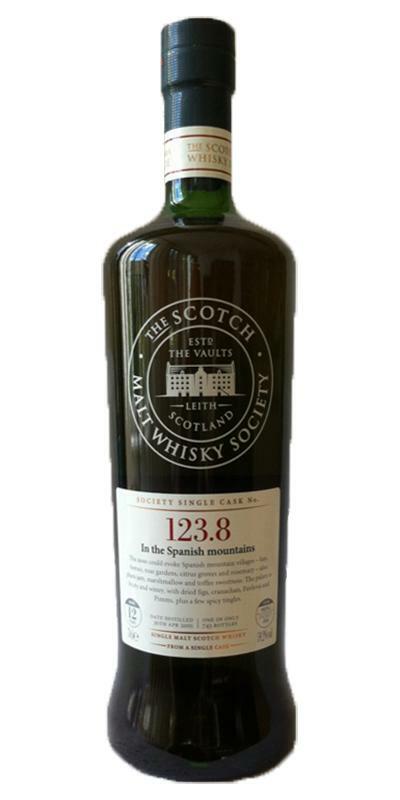 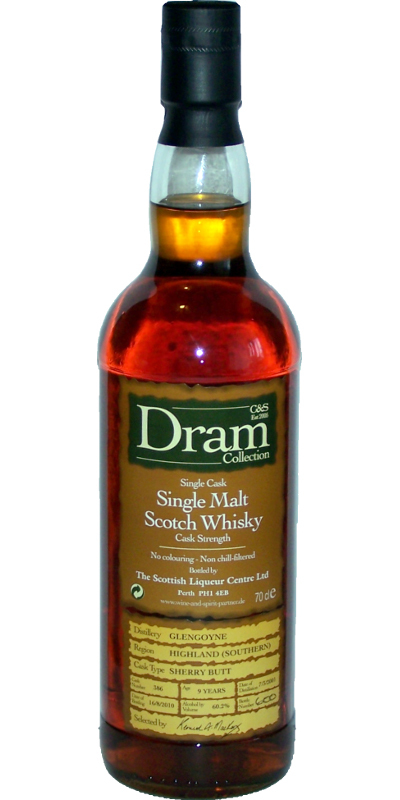 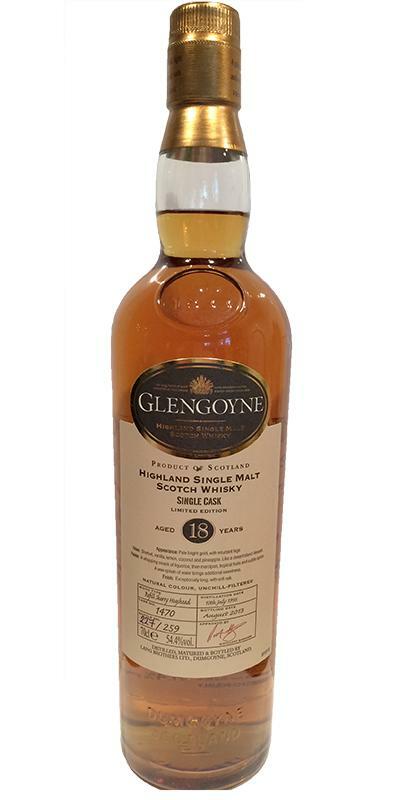 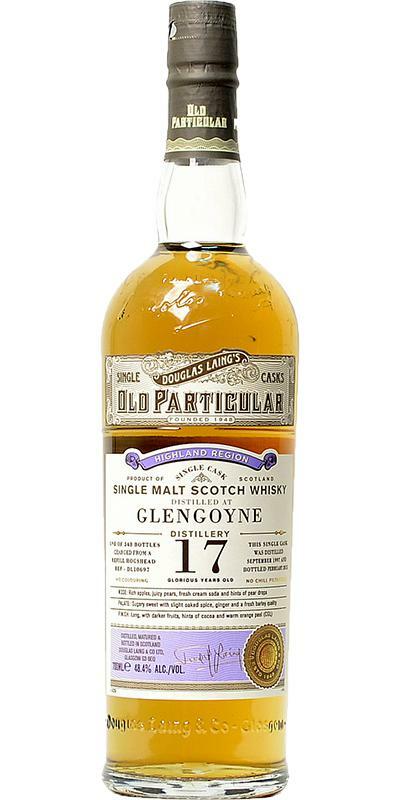 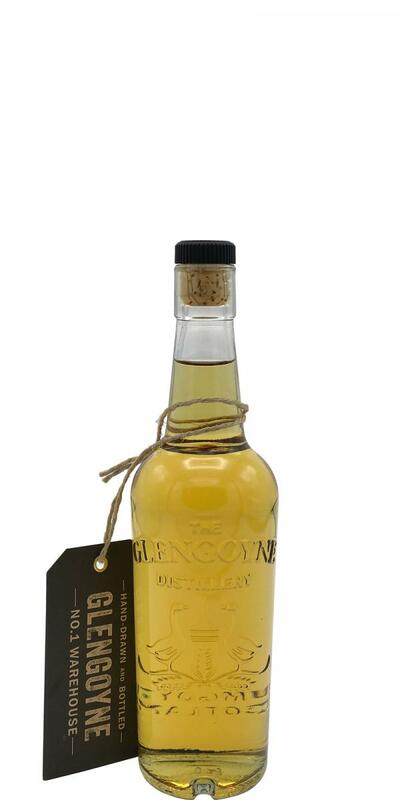 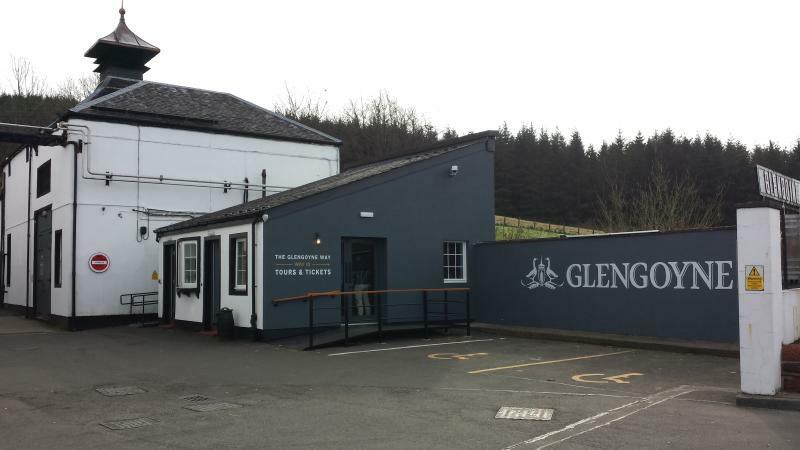 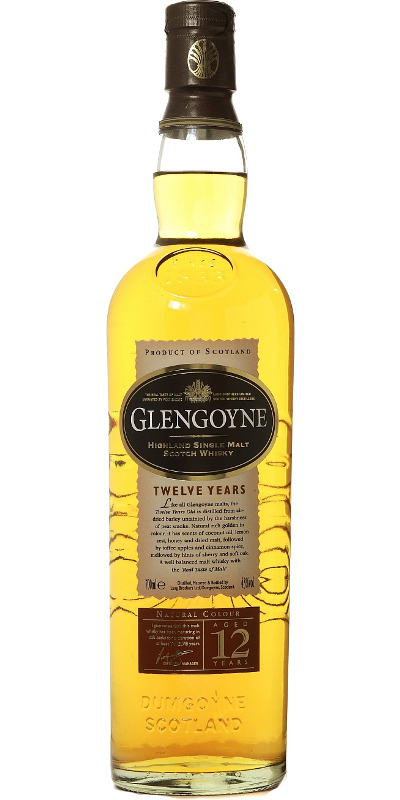 Glengoyne 15-year-old The Kiln Decanter 15 43.0 % Vol. 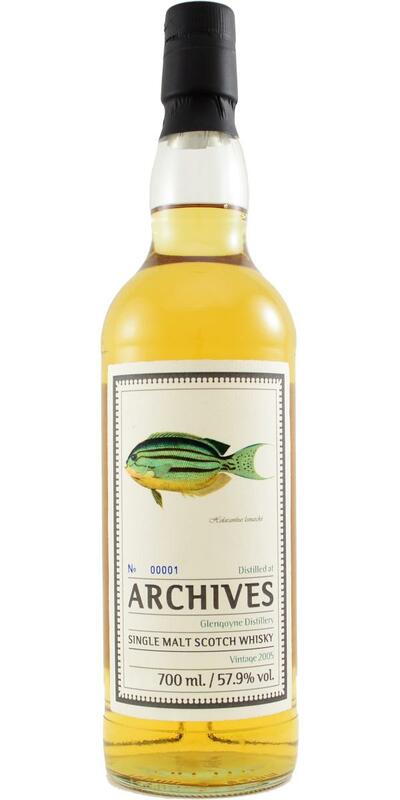 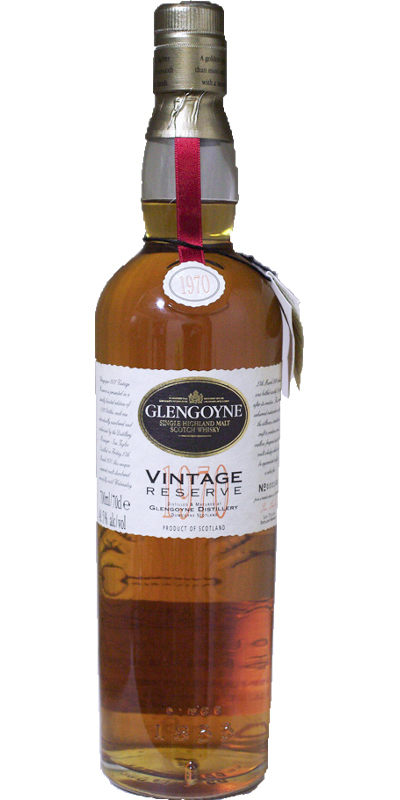 Glengoyne 15-year-old - HMS Vigilant 20th Anniversary 15 43.0 % Vol. 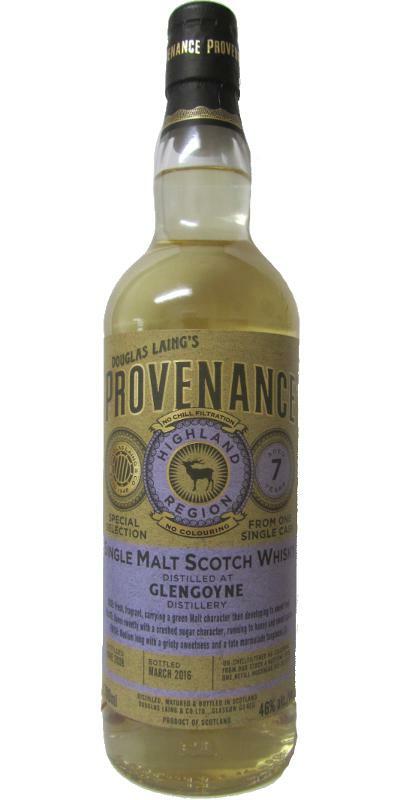 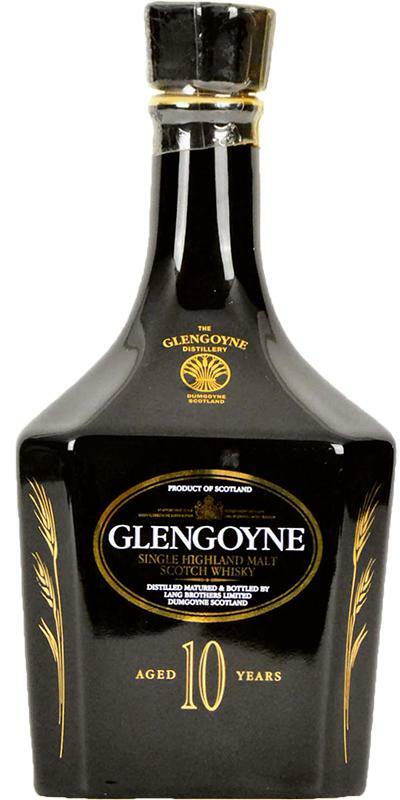 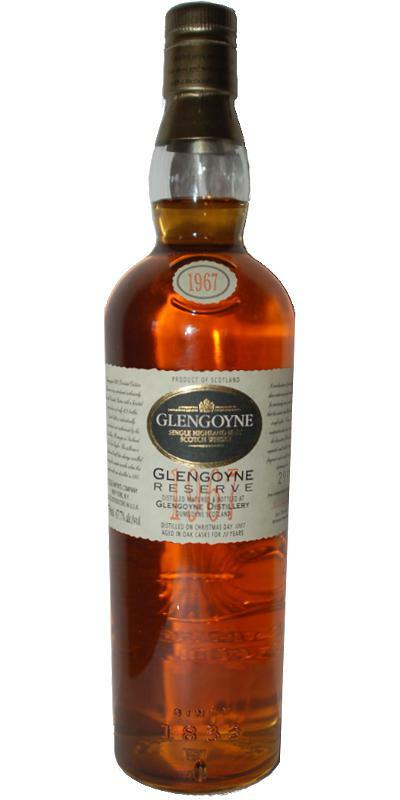 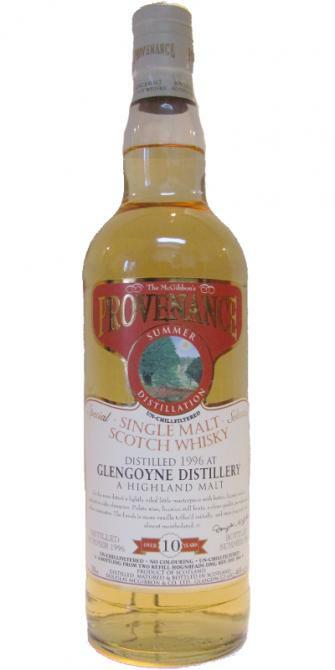 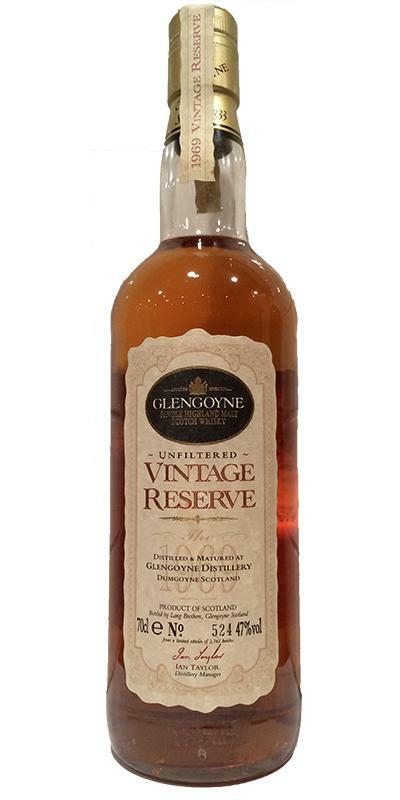 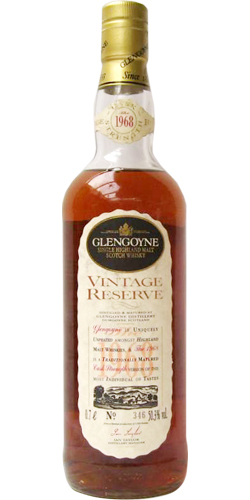 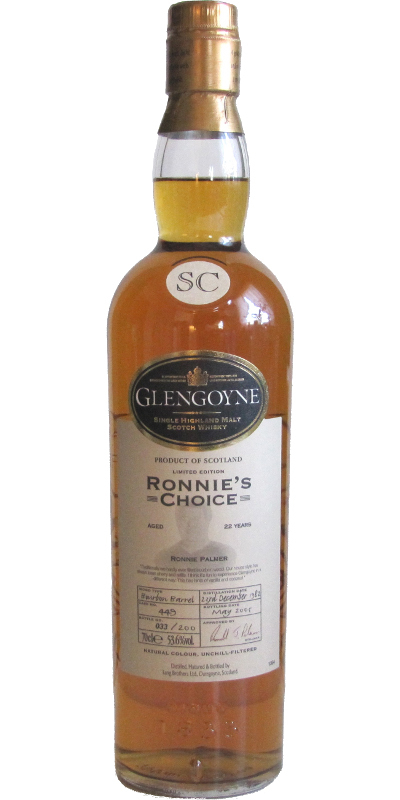 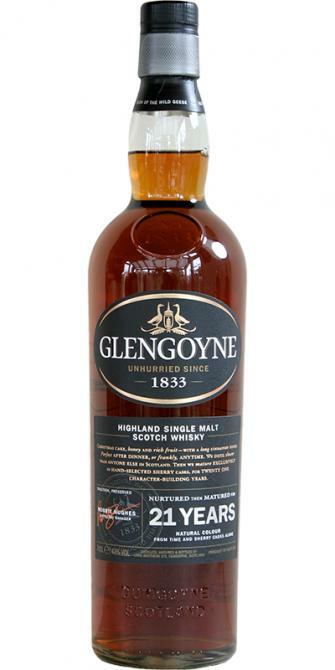 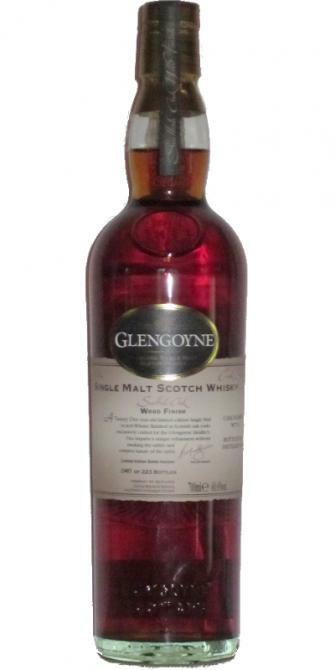 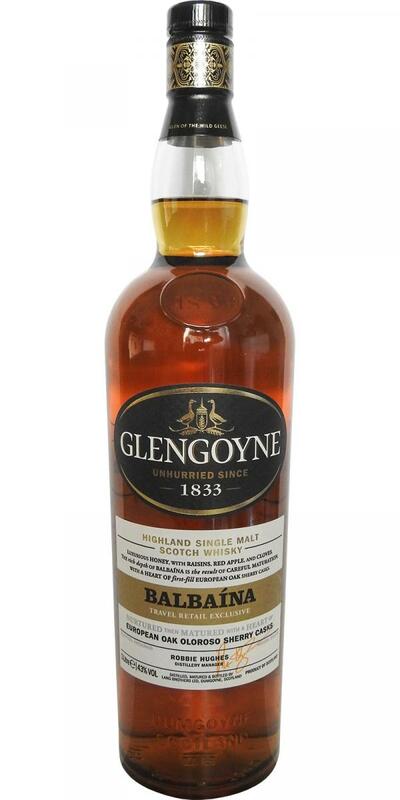 Glengoyne 1967 Reserve 29 52.5 % Vol. 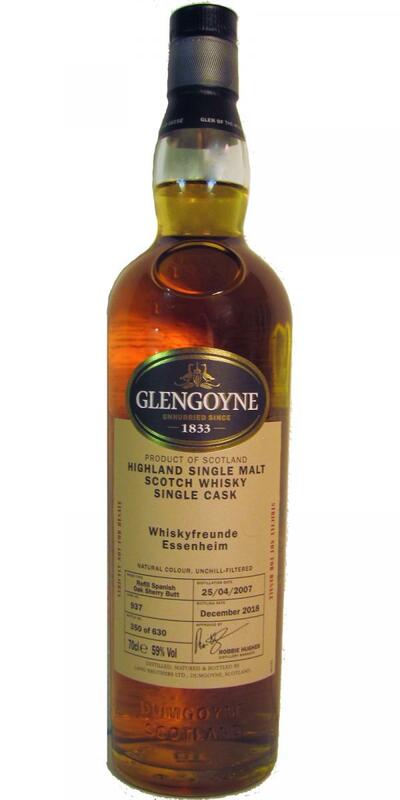 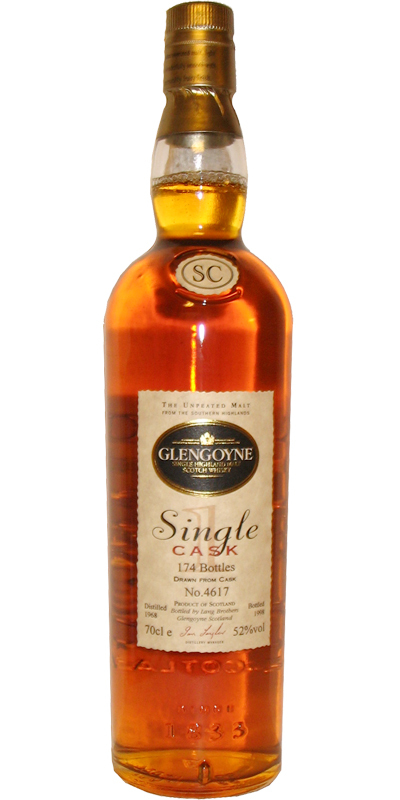 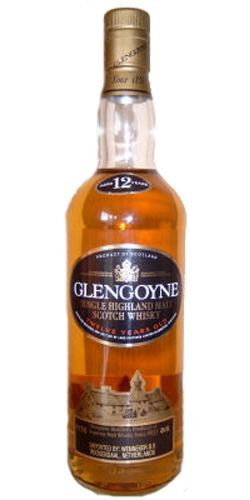 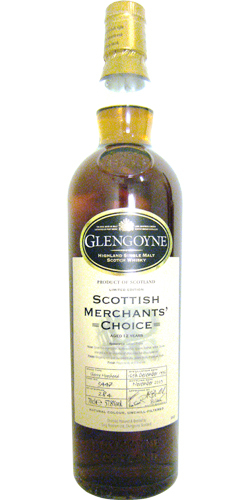 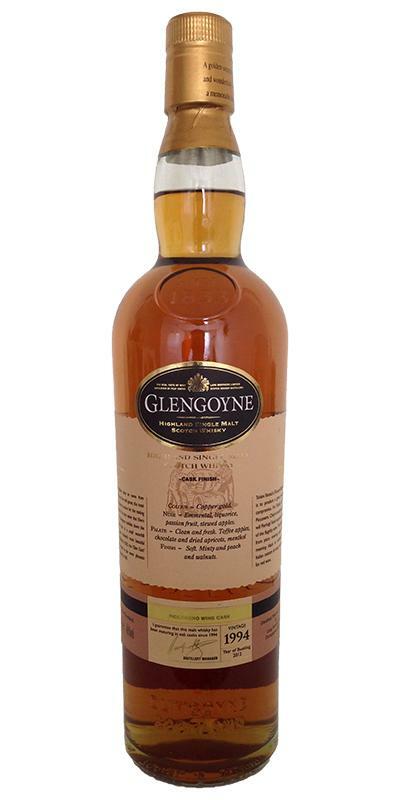 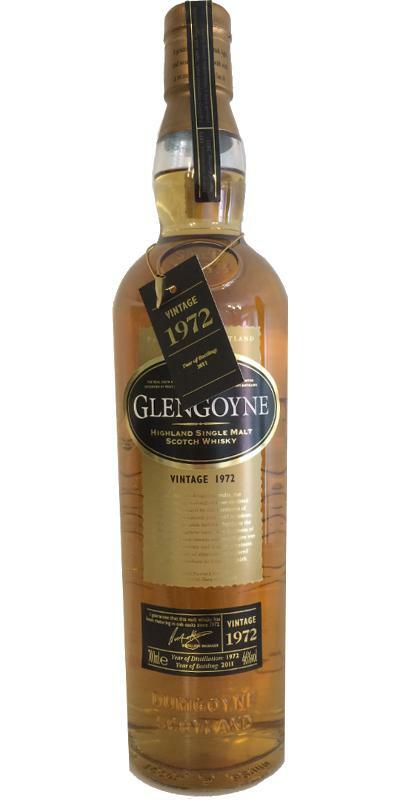 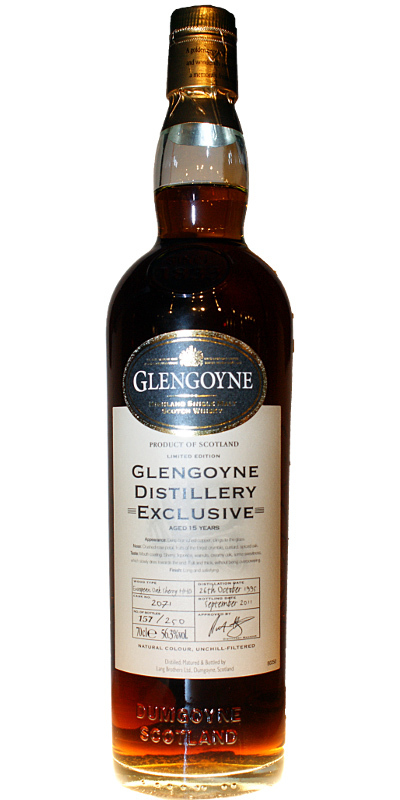 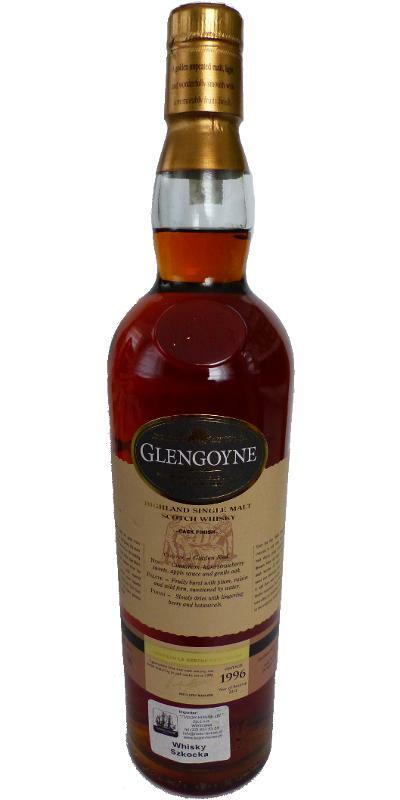 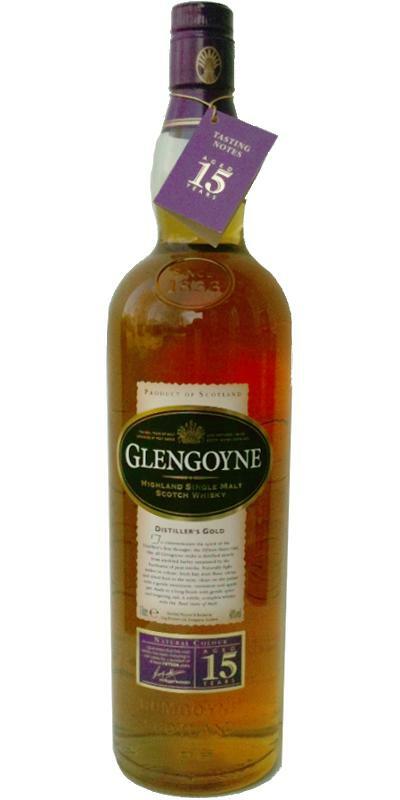 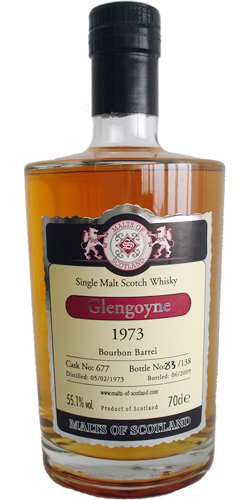 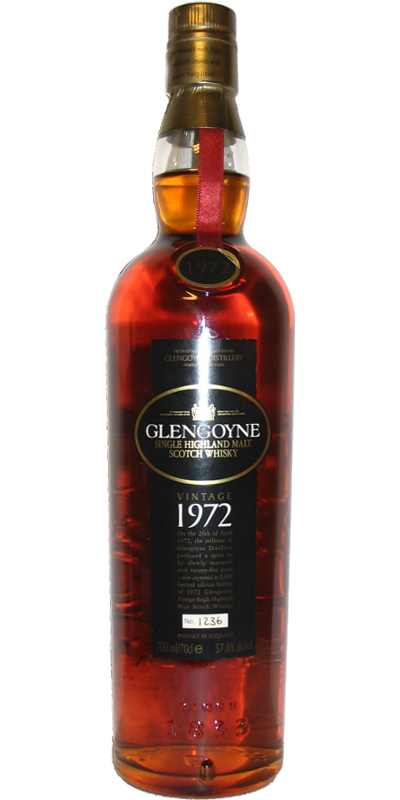 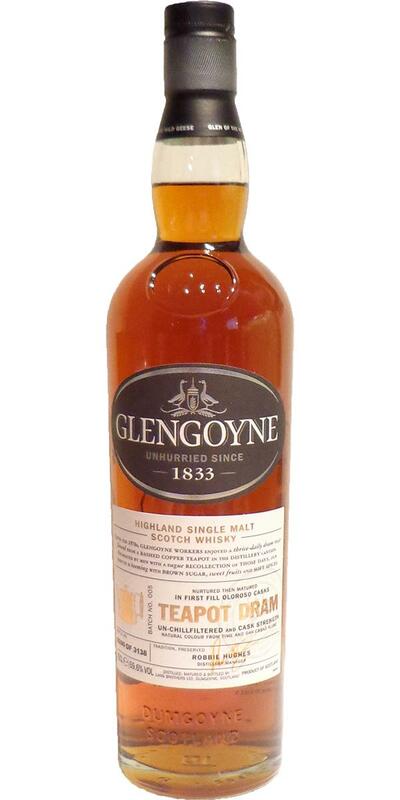 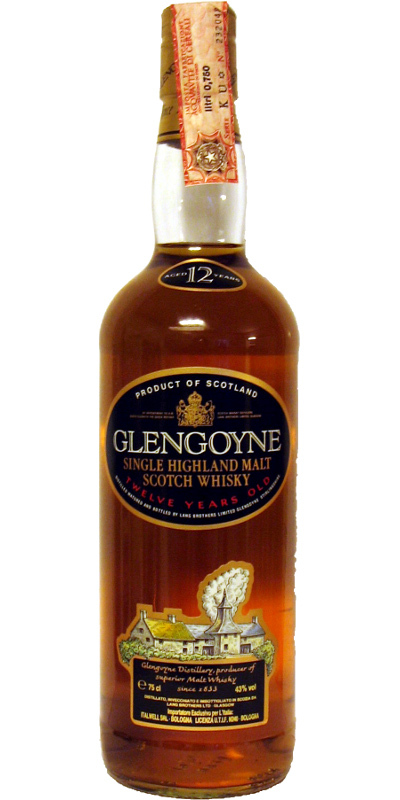 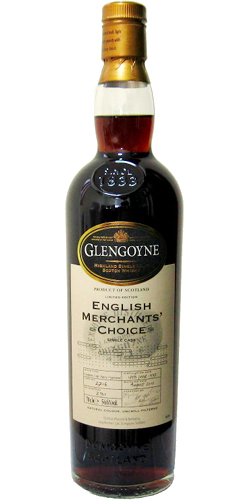 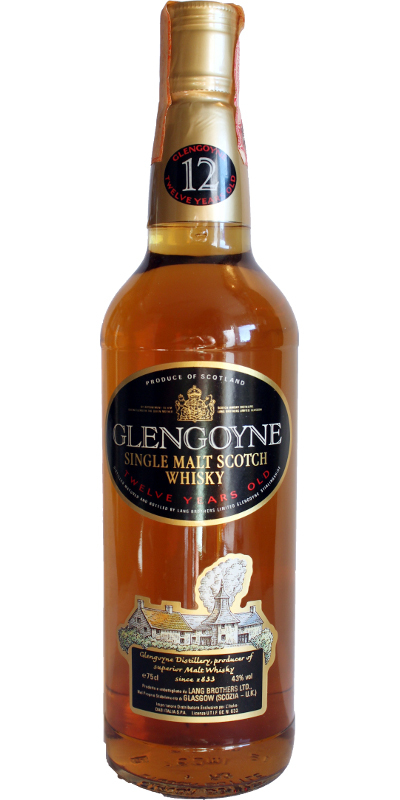 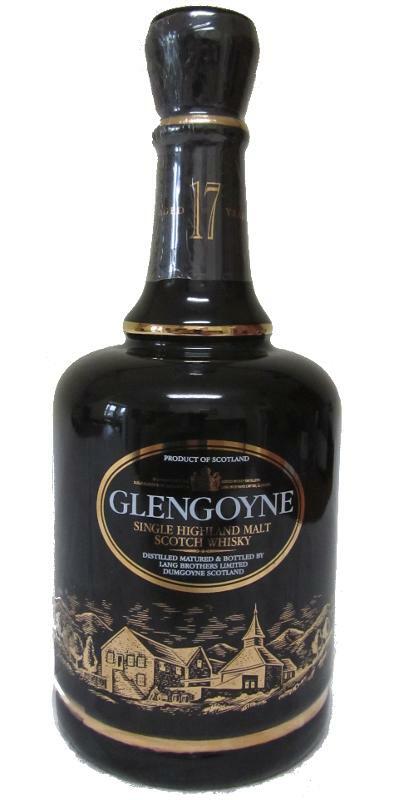 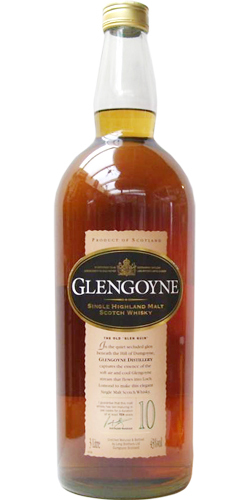 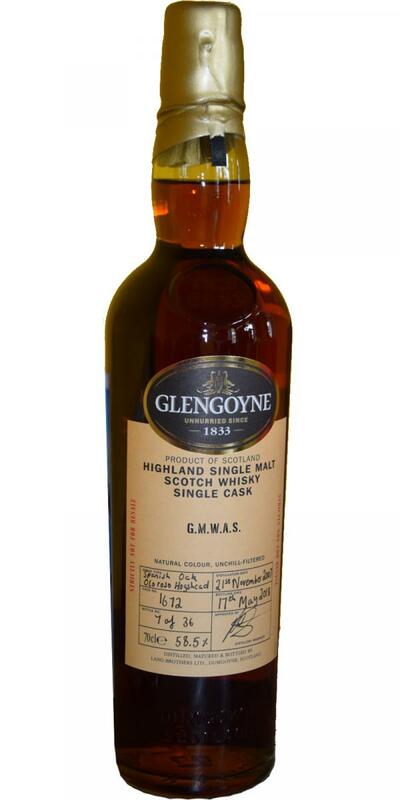 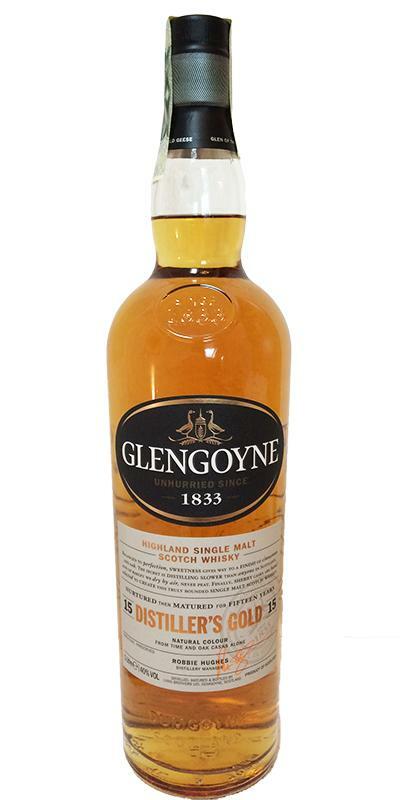 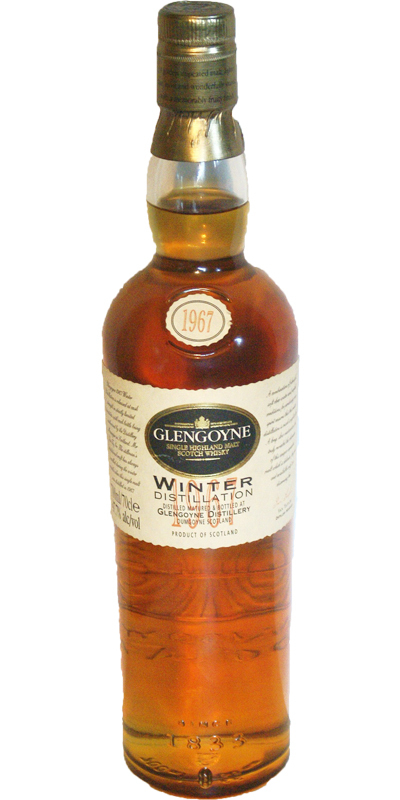 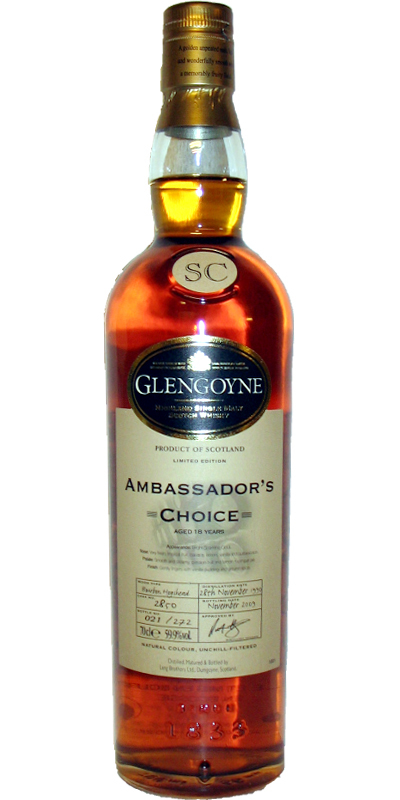 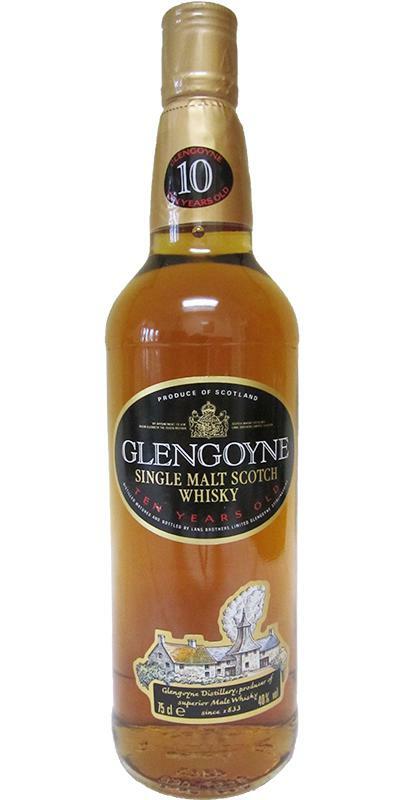 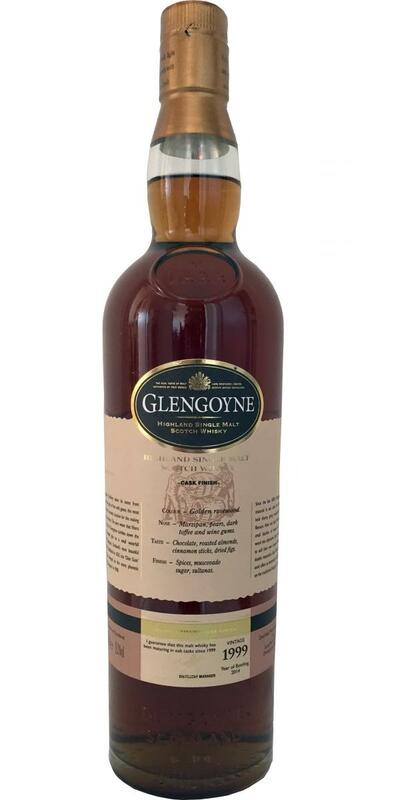 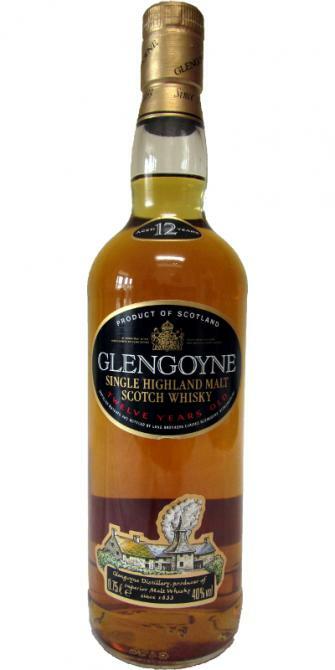 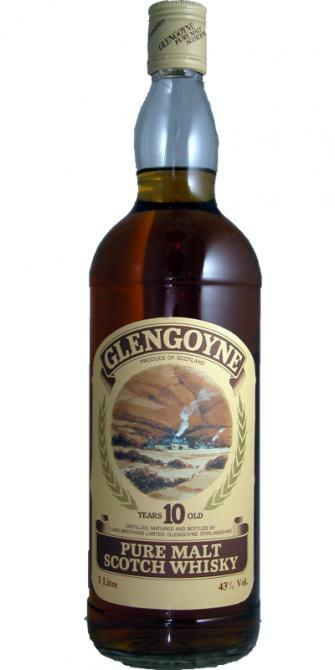 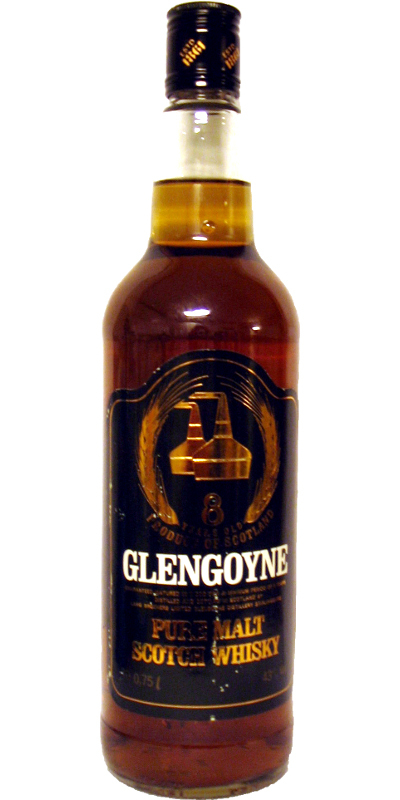 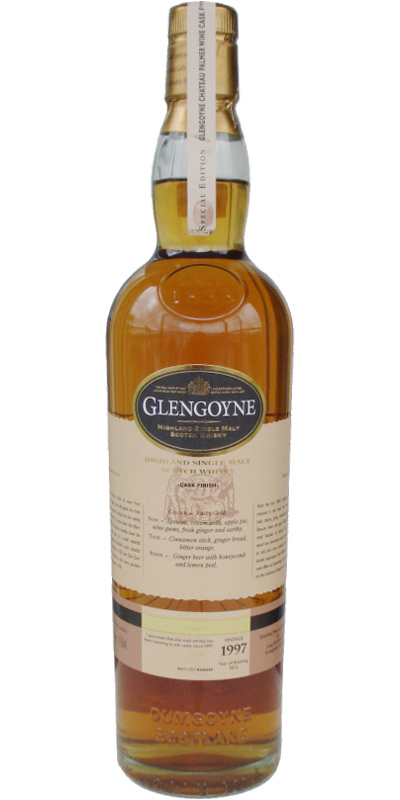 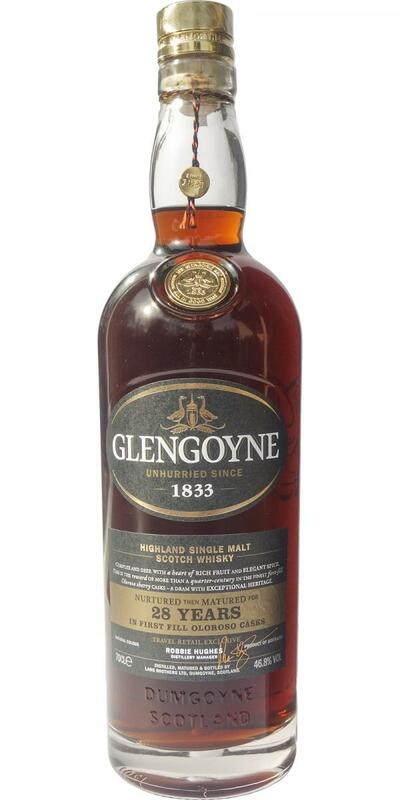 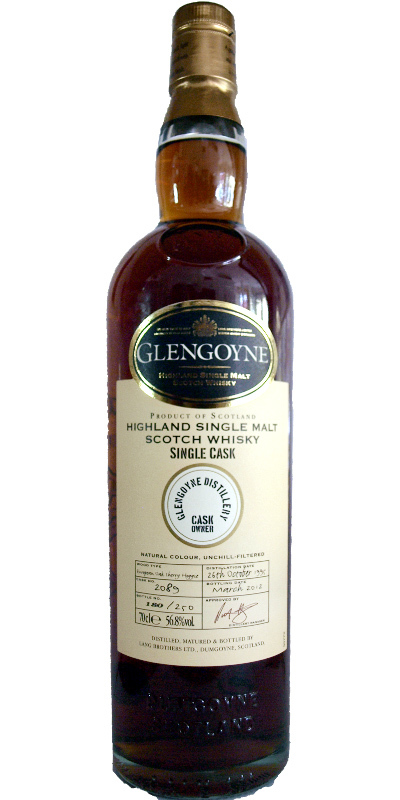 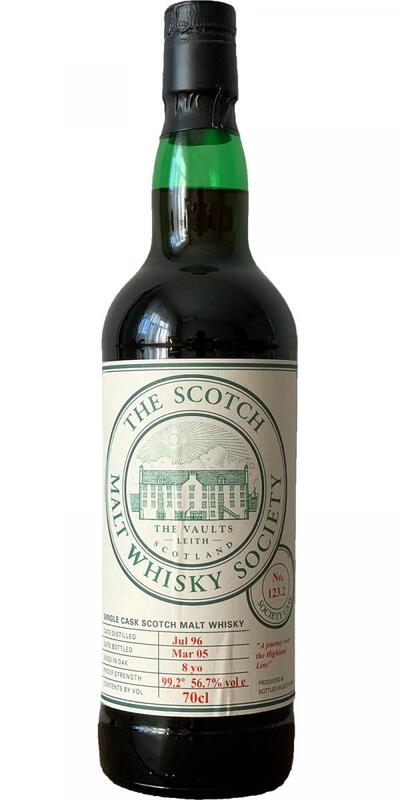 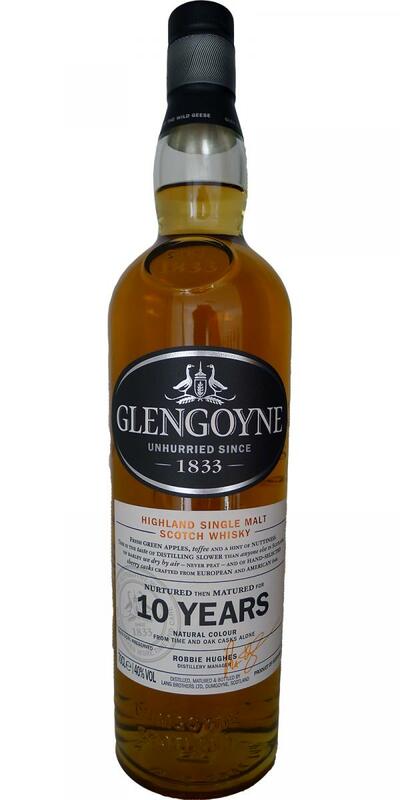 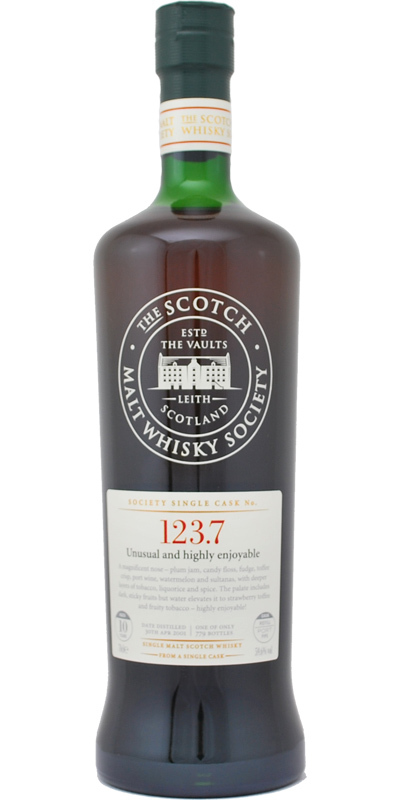 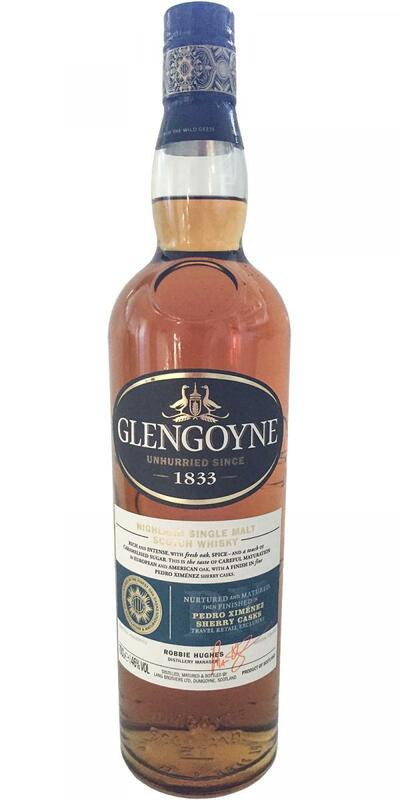 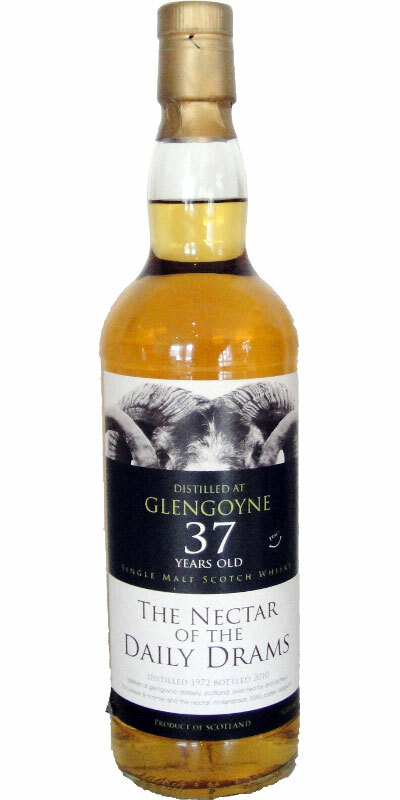 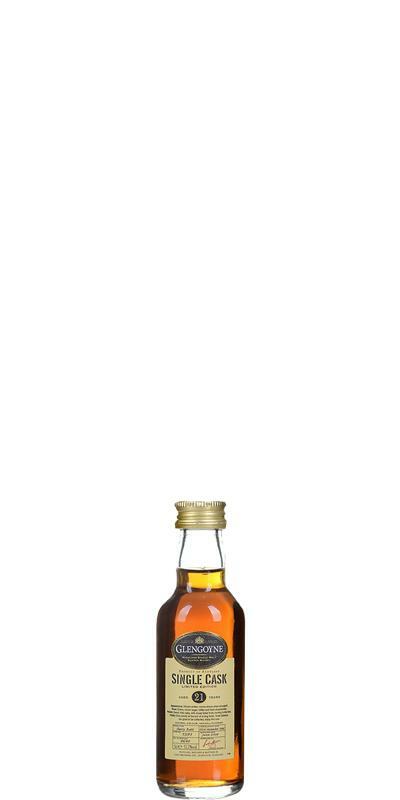 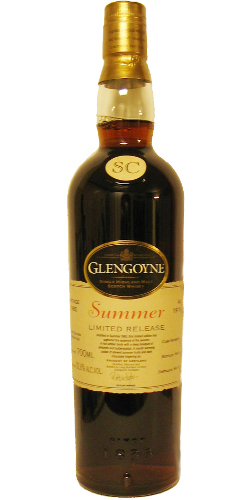 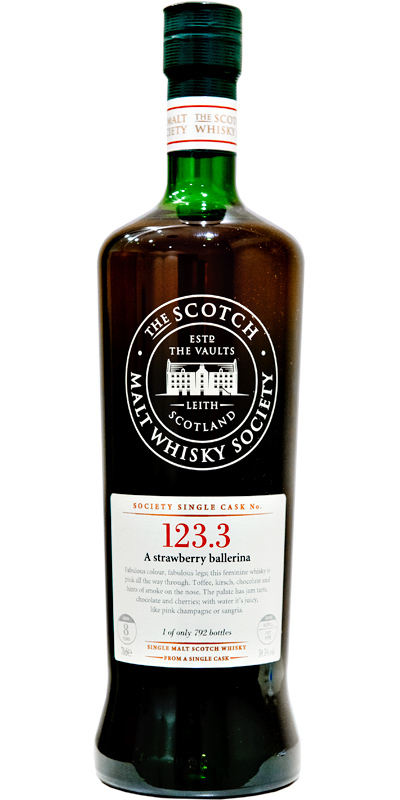 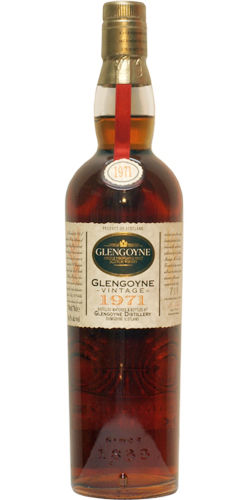 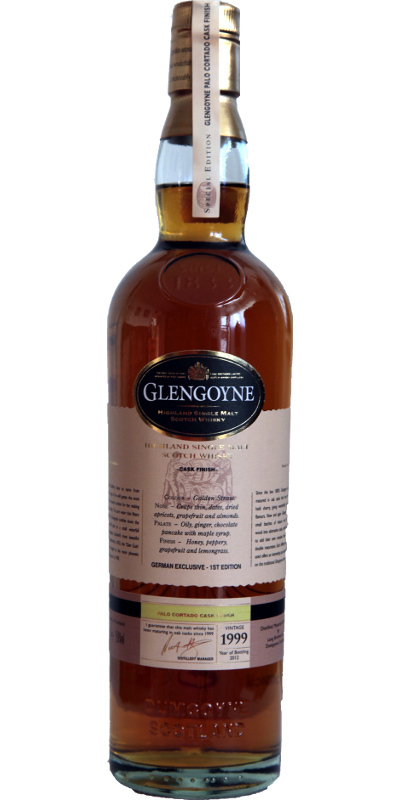 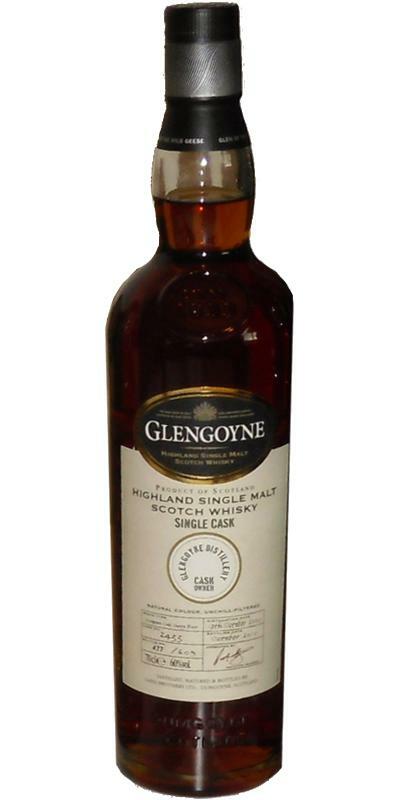 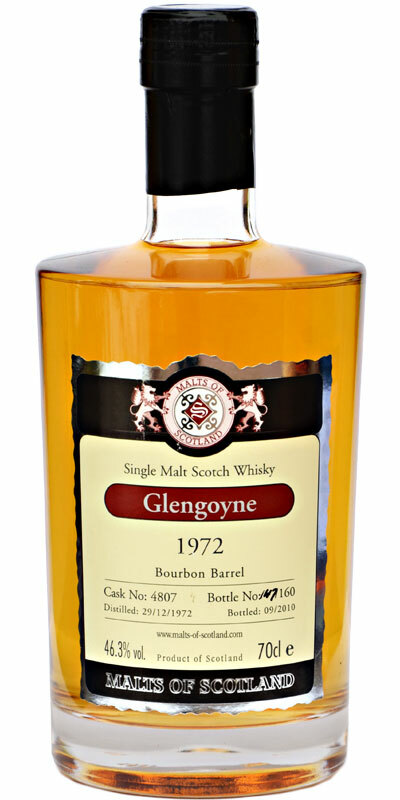 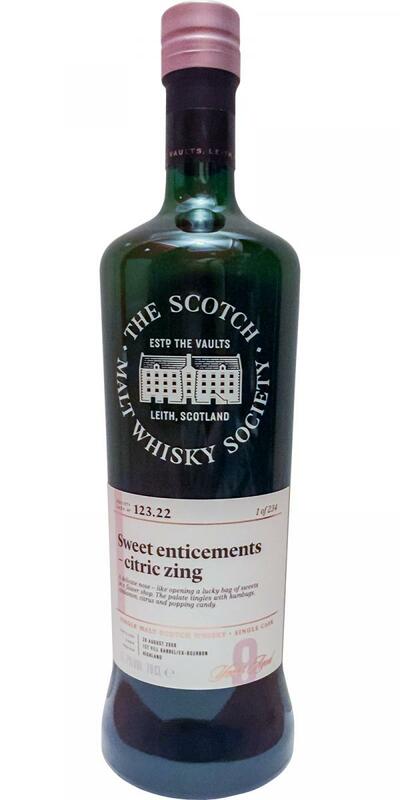 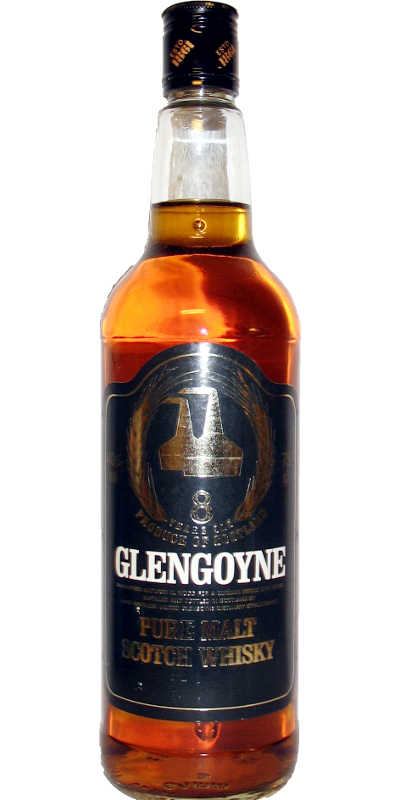 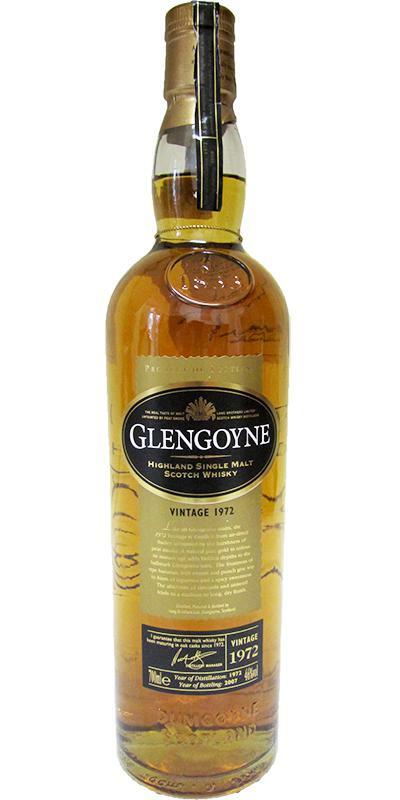 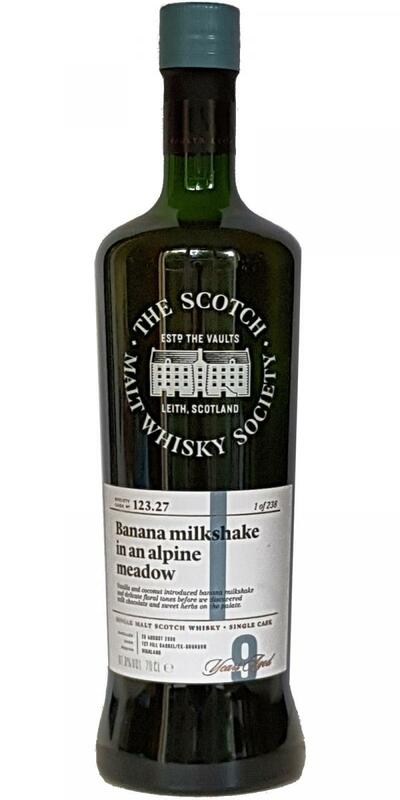 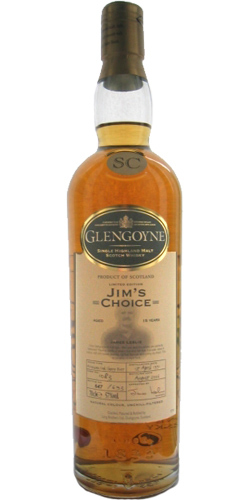 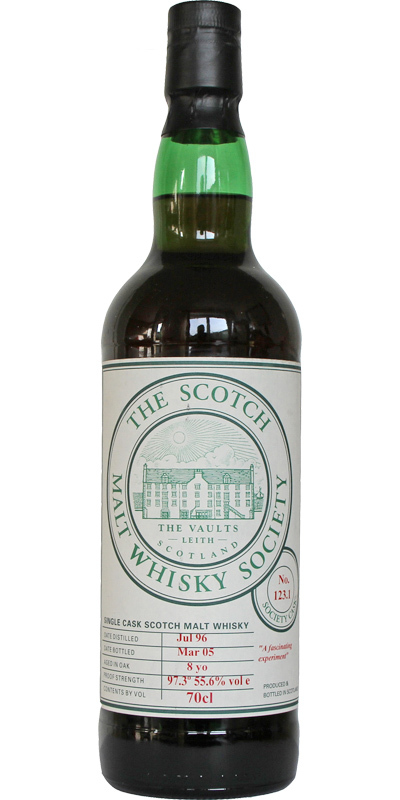 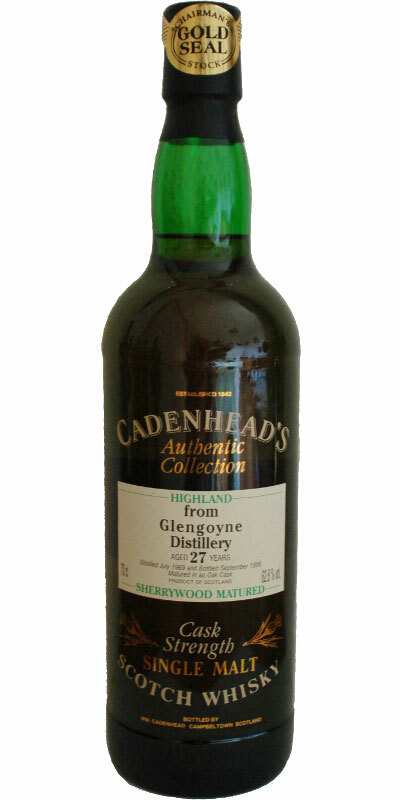 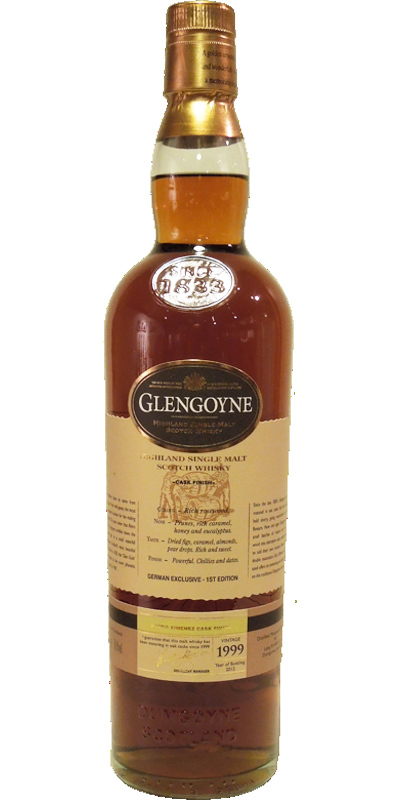 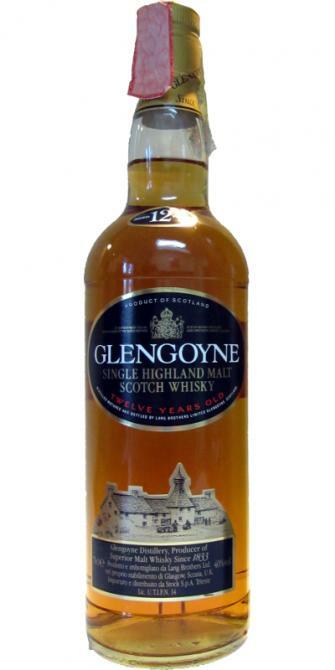 Glengoyne 1969 JE 27 52.5 % Vol. 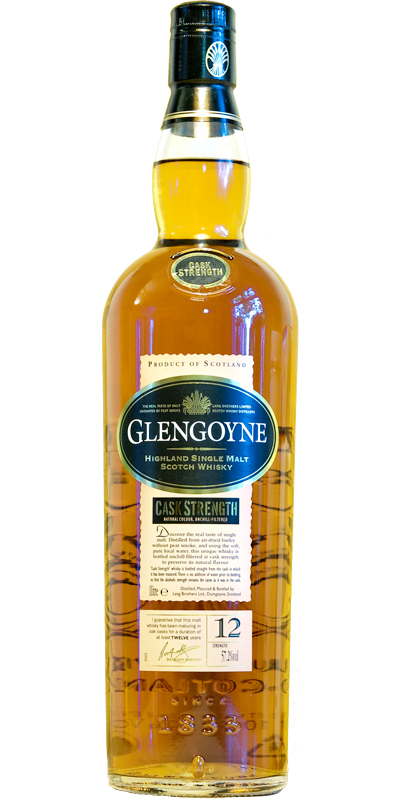 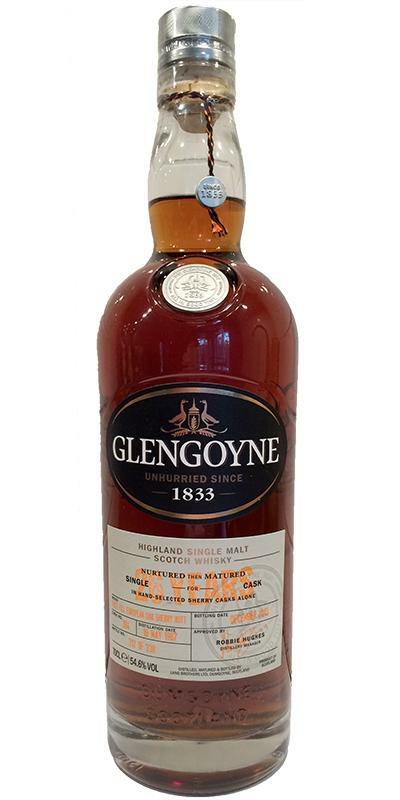 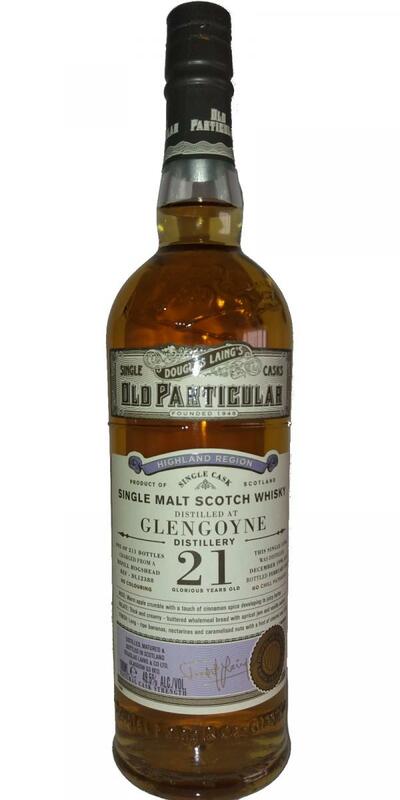 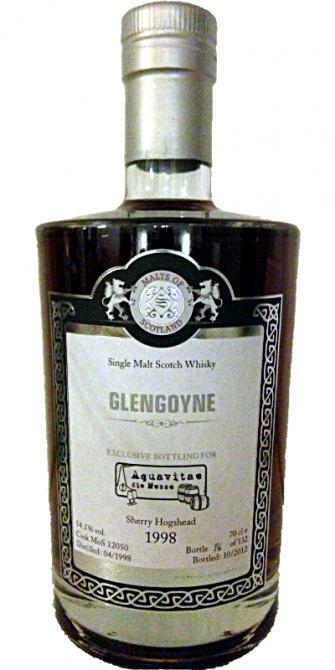 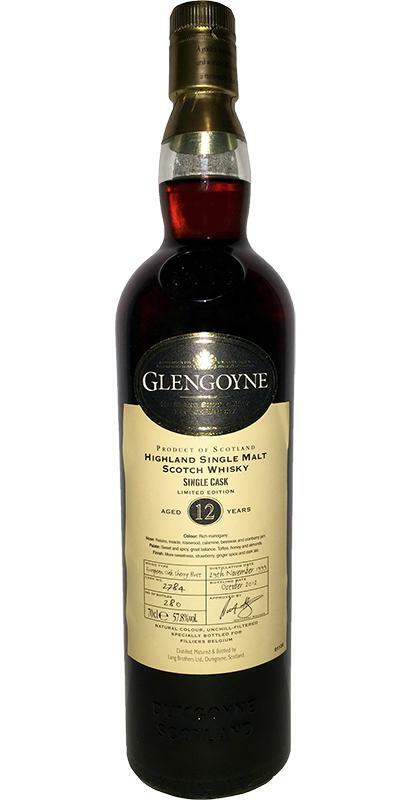 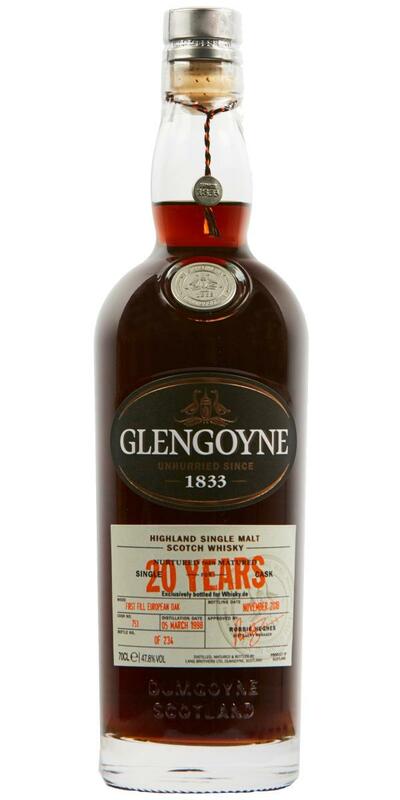 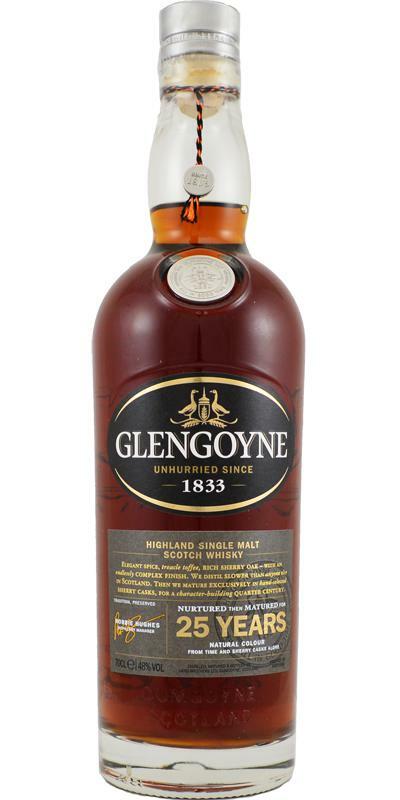 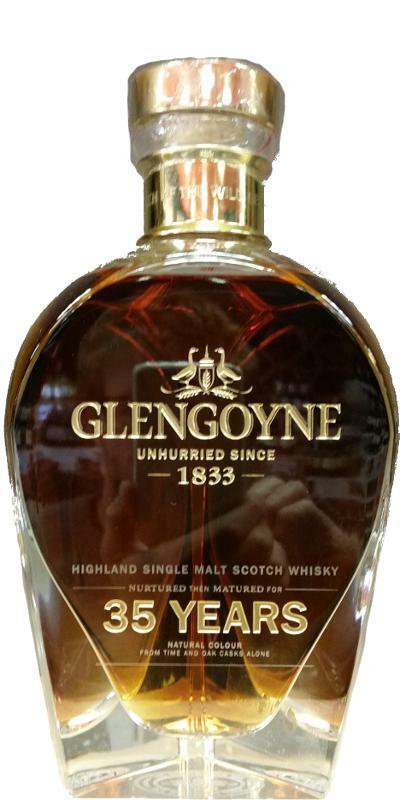 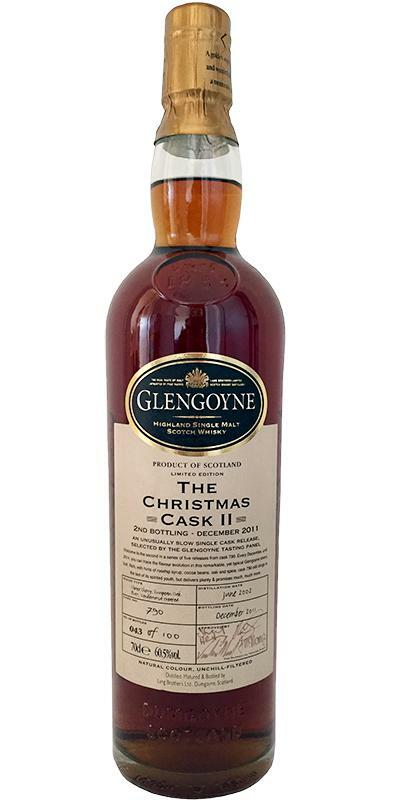 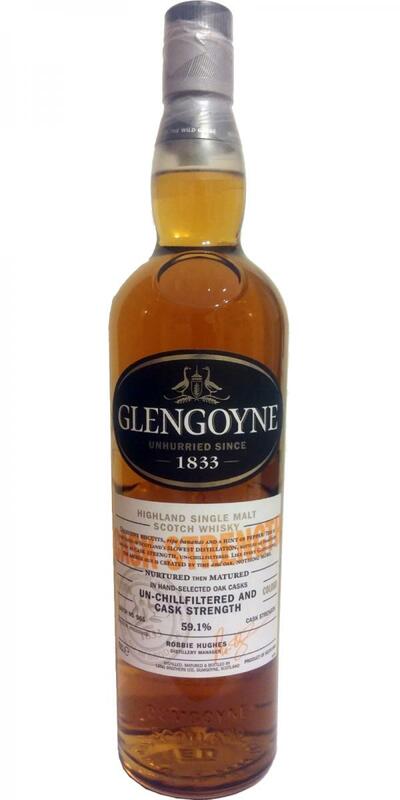 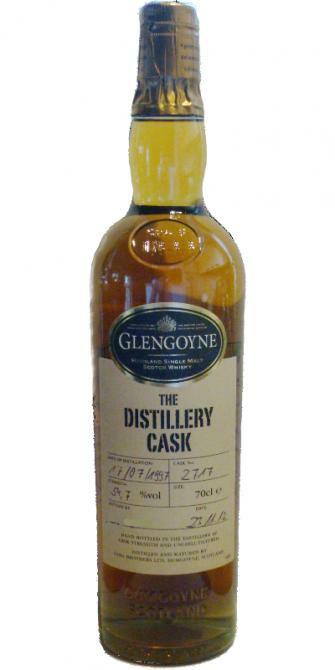 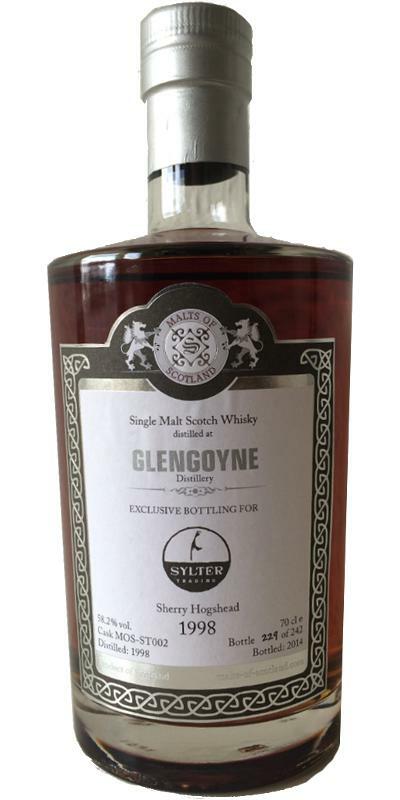 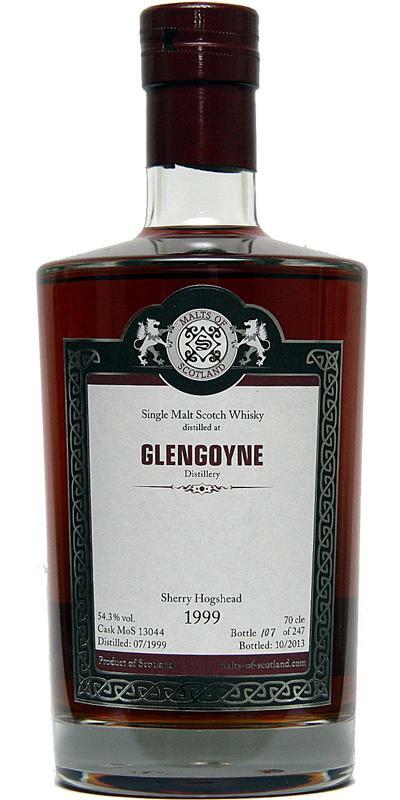 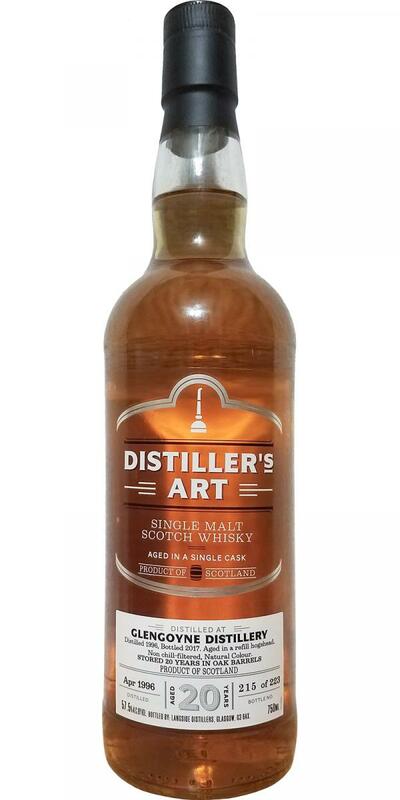 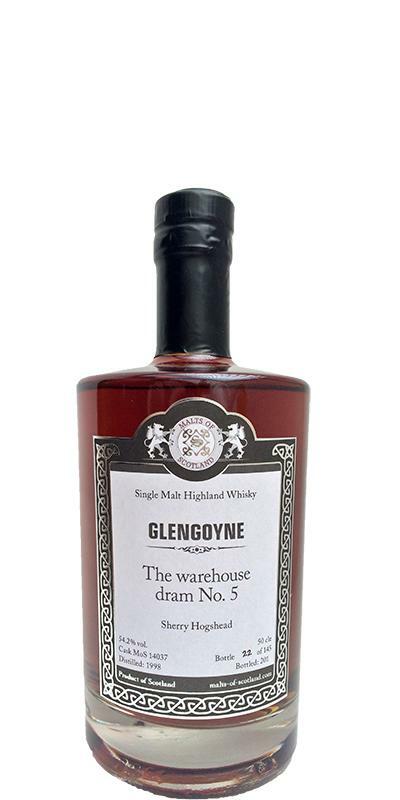 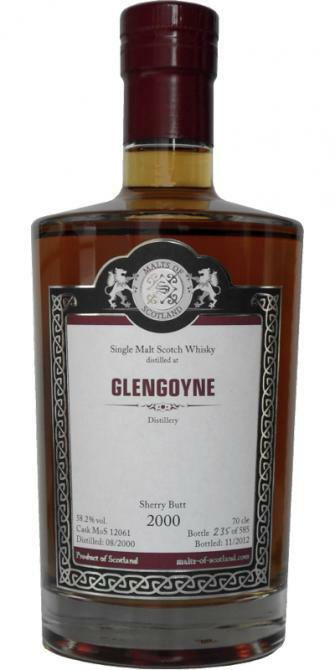 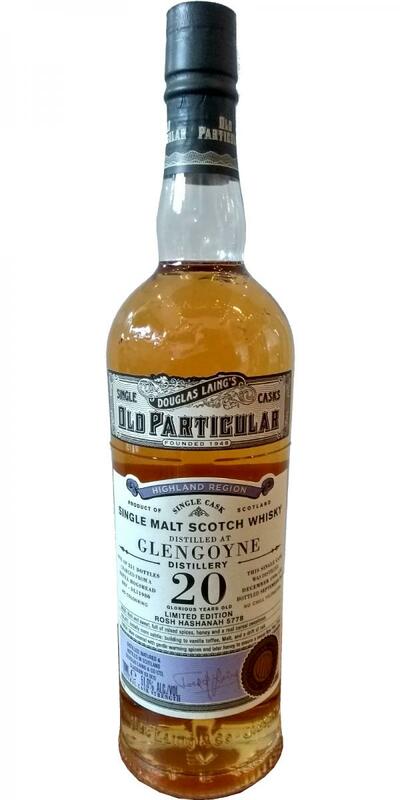 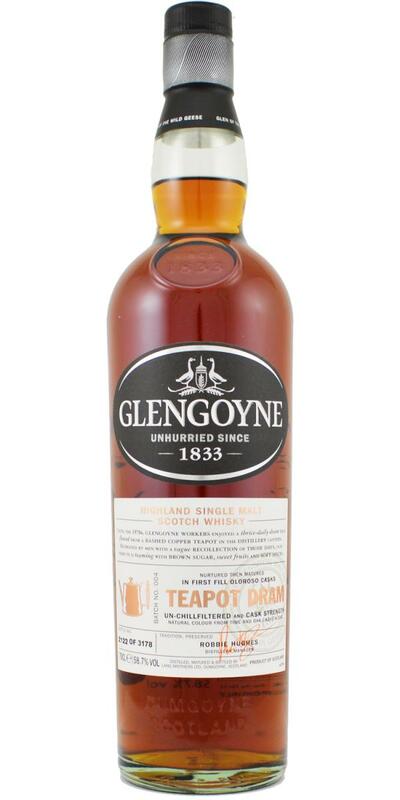 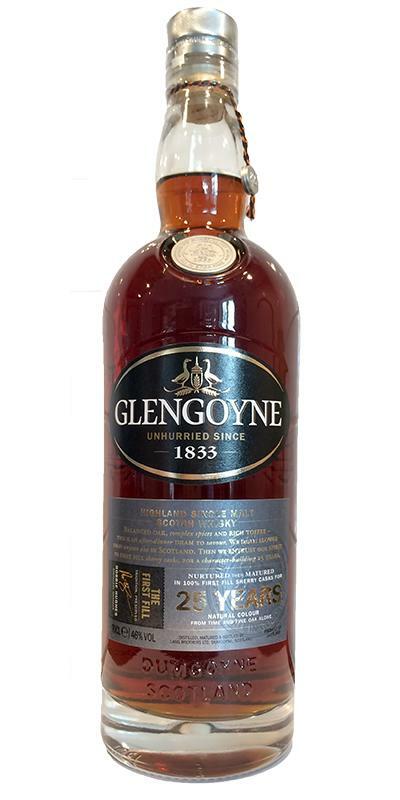 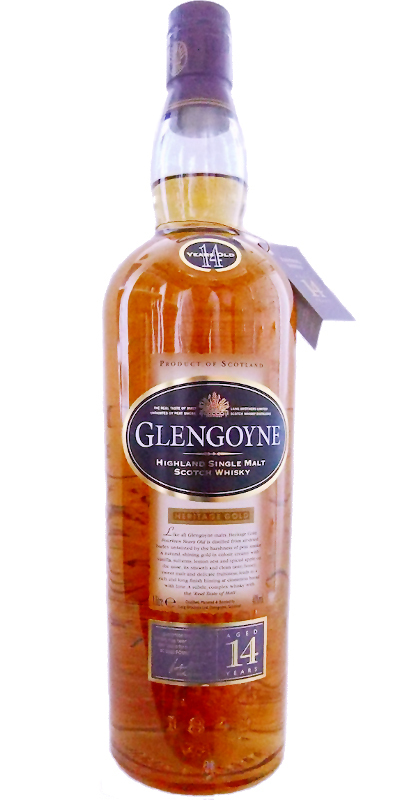 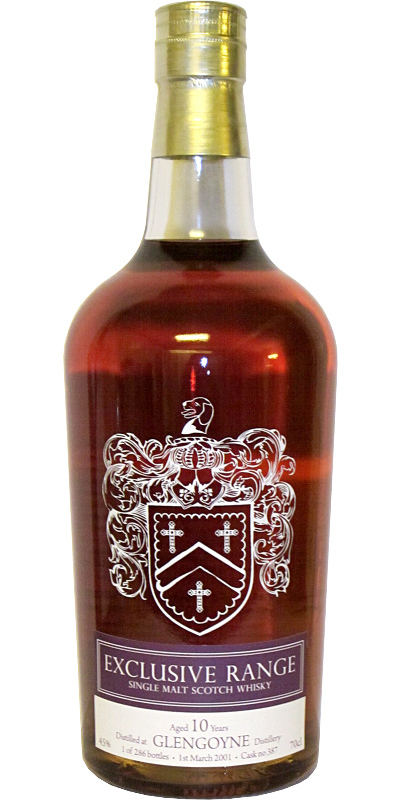 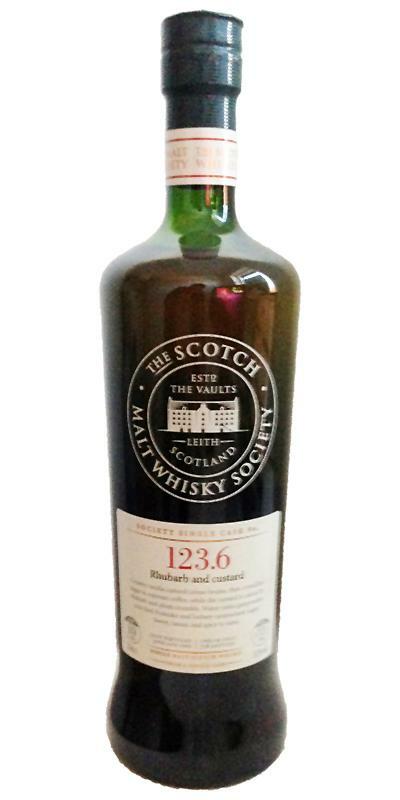 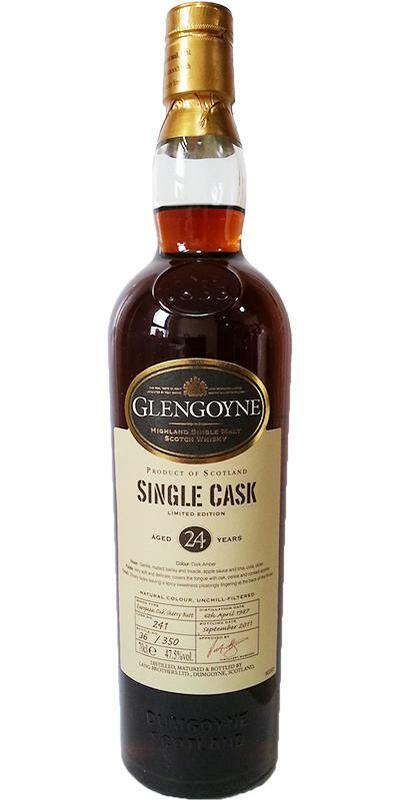 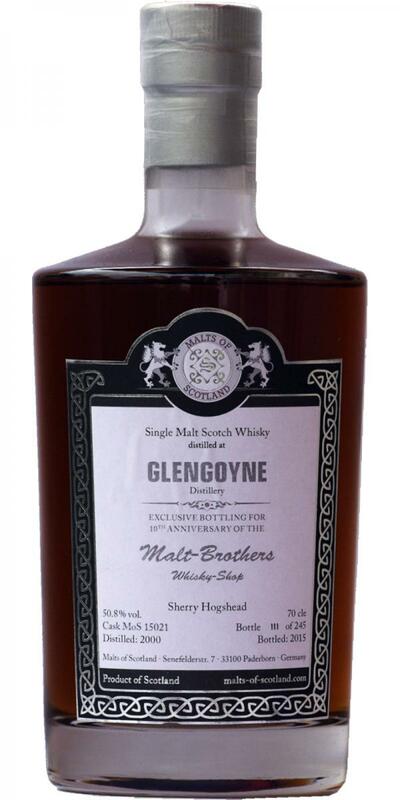 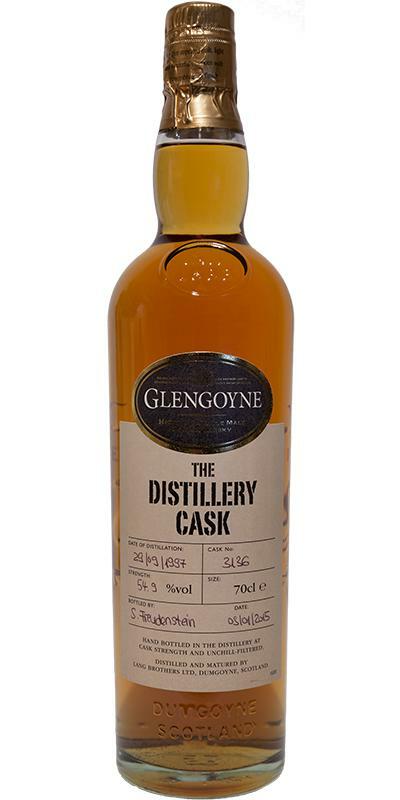 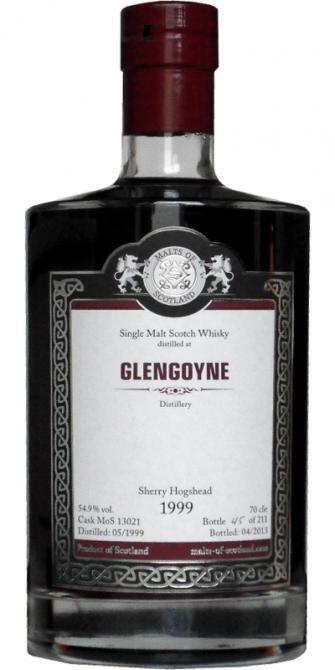 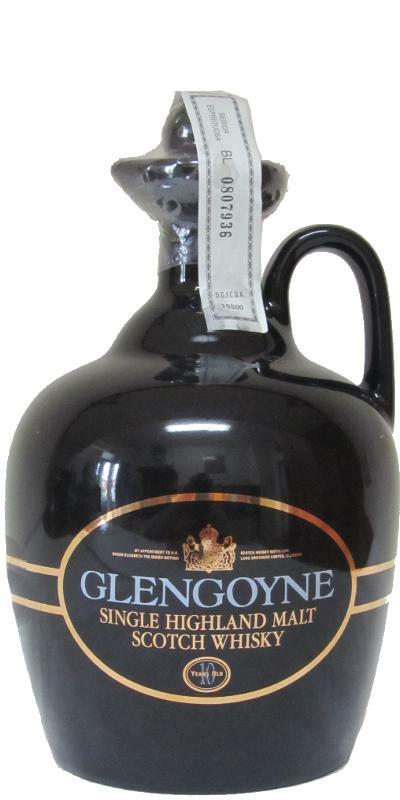 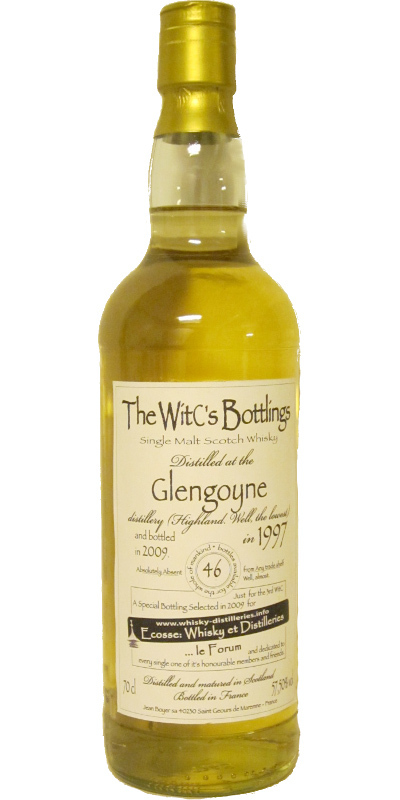 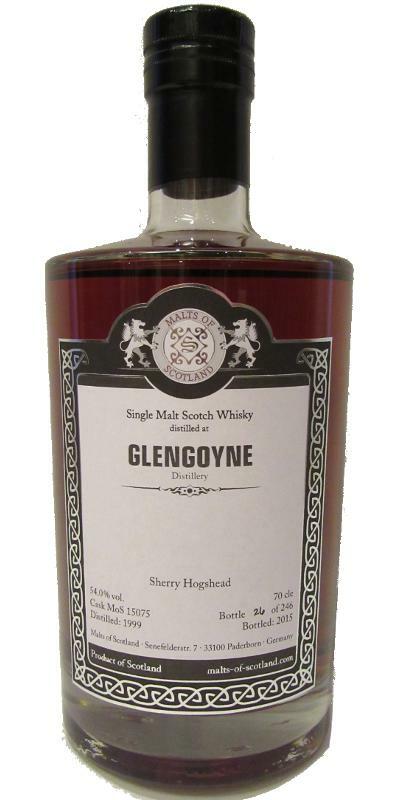 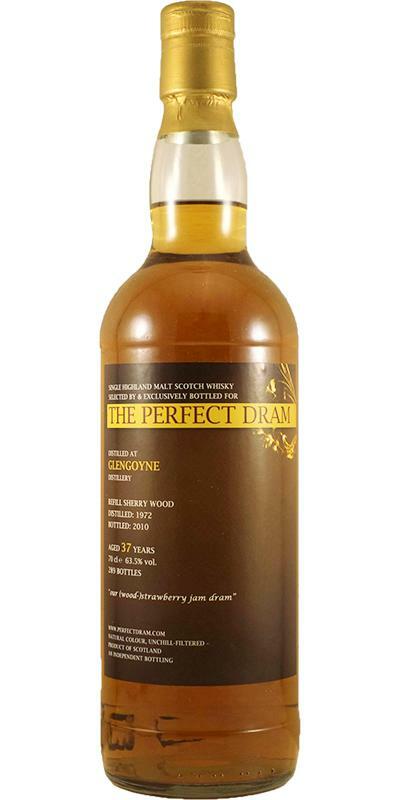 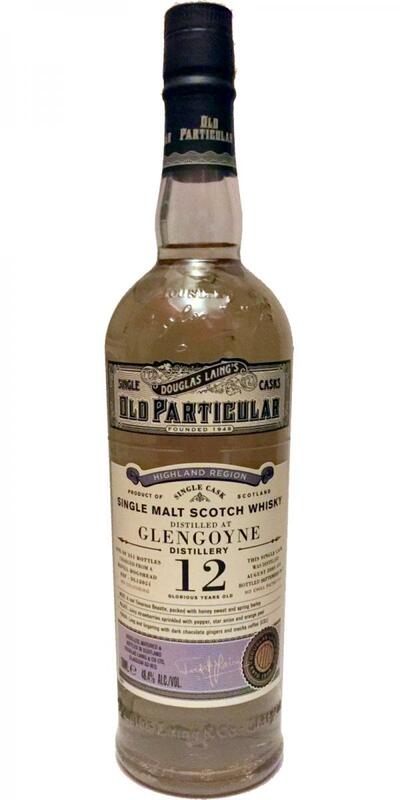 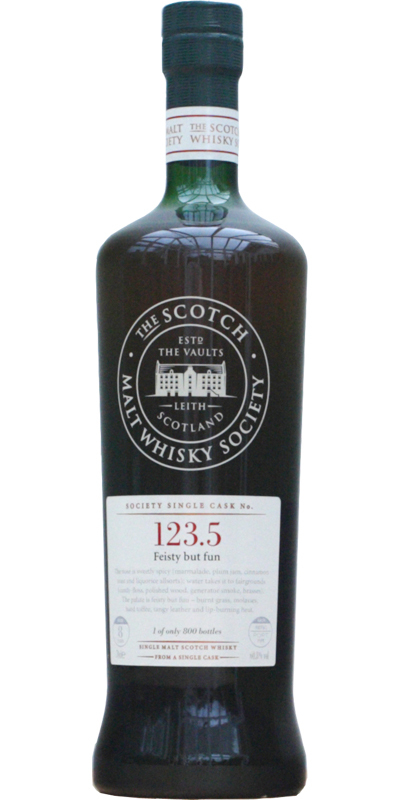 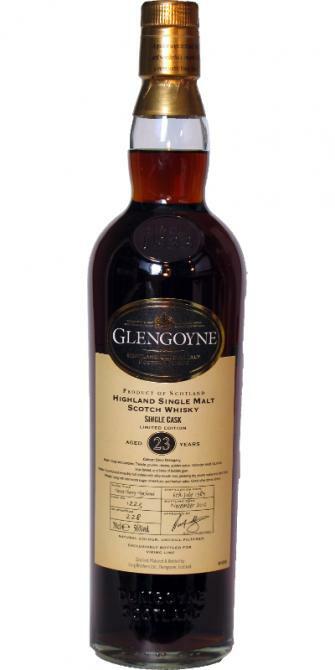 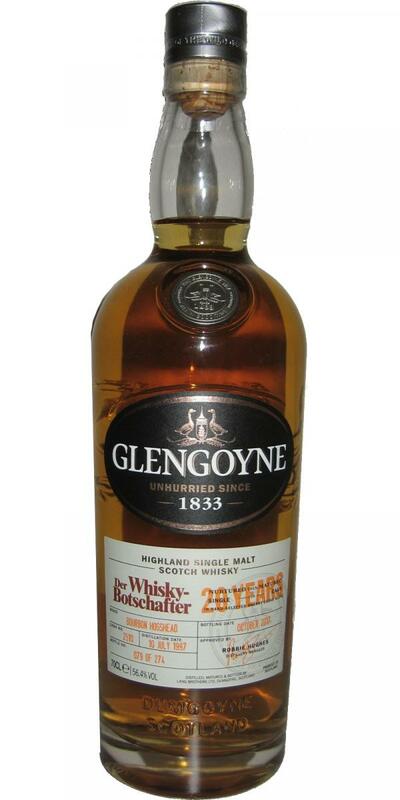 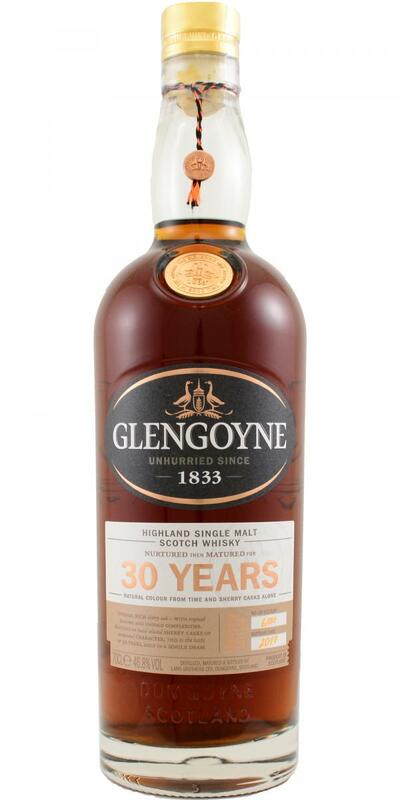 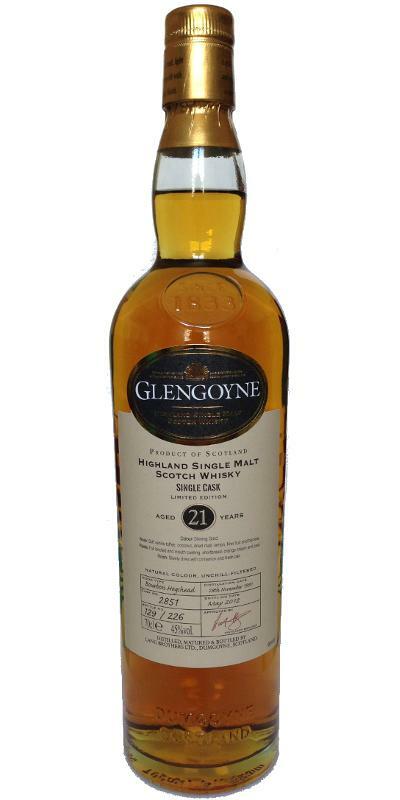 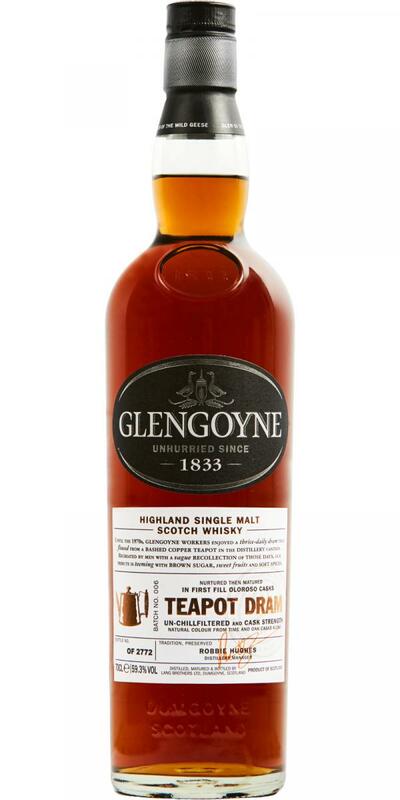 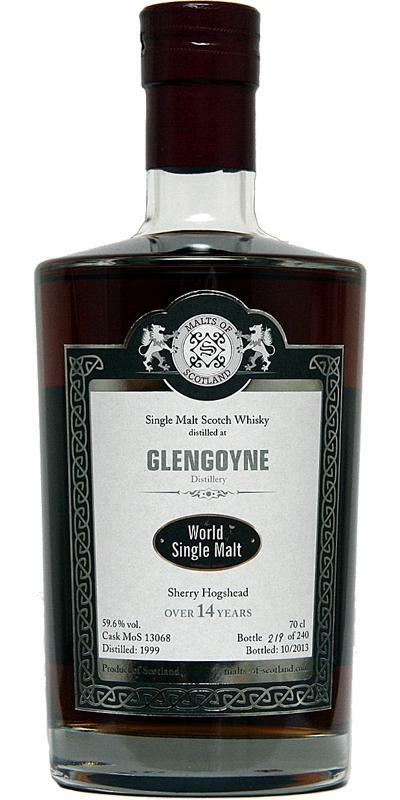 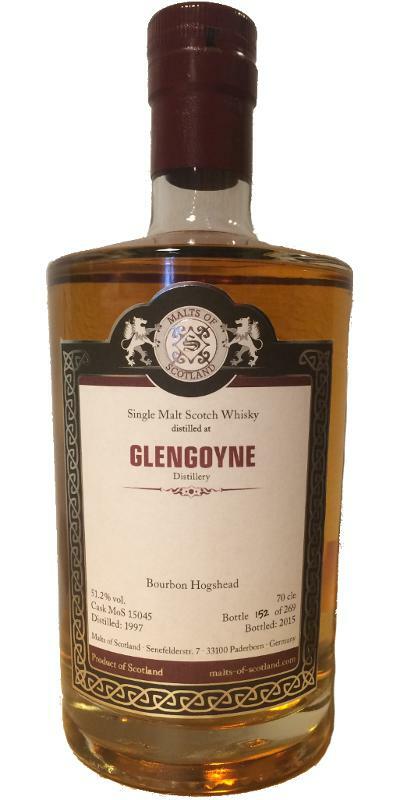 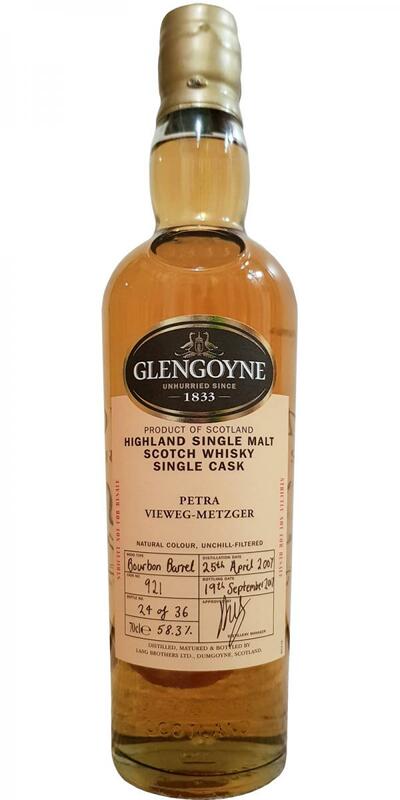 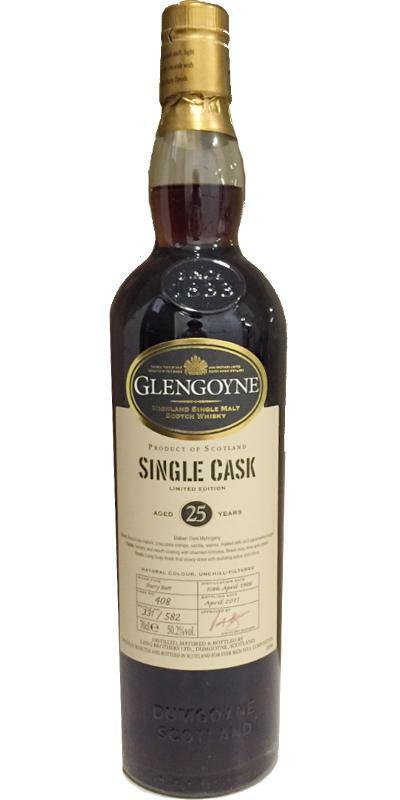 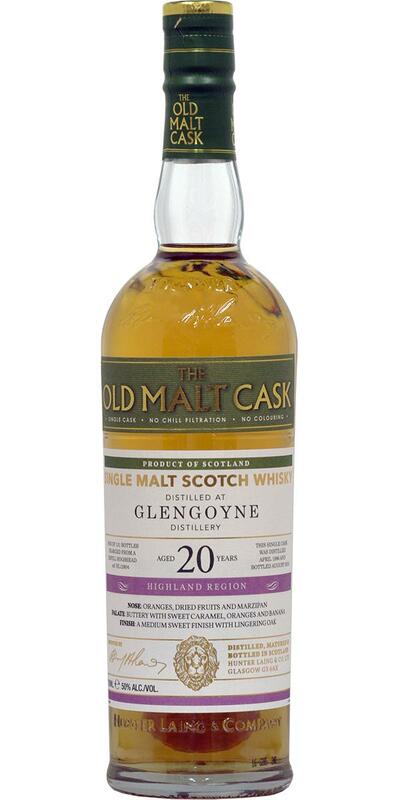 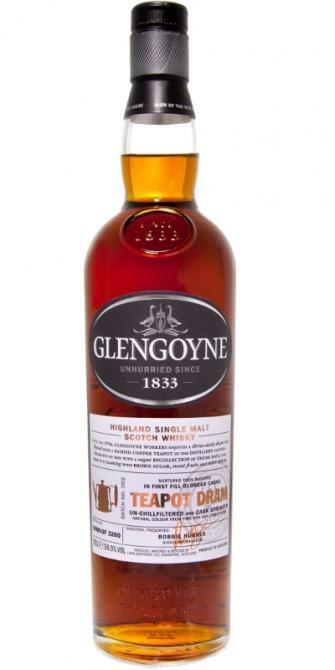 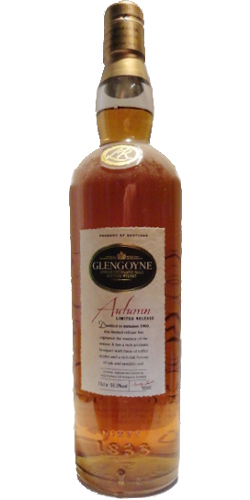 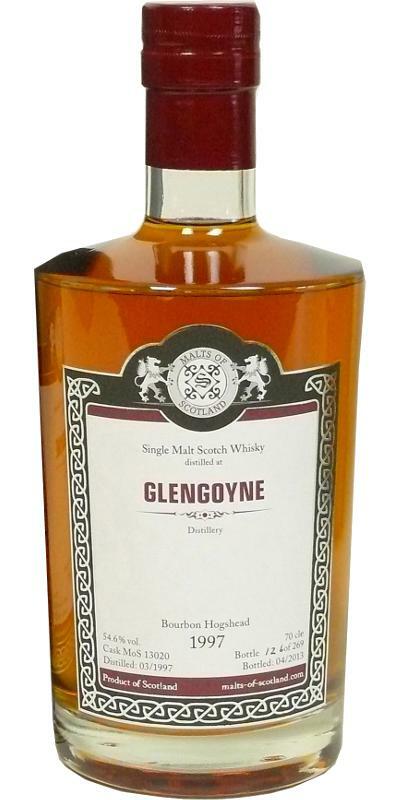 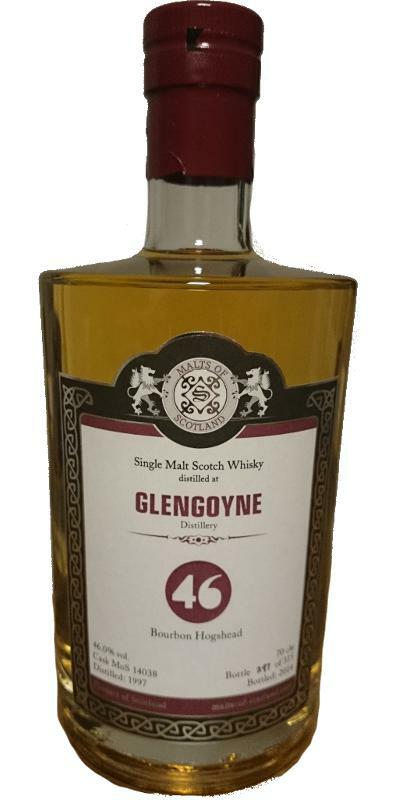 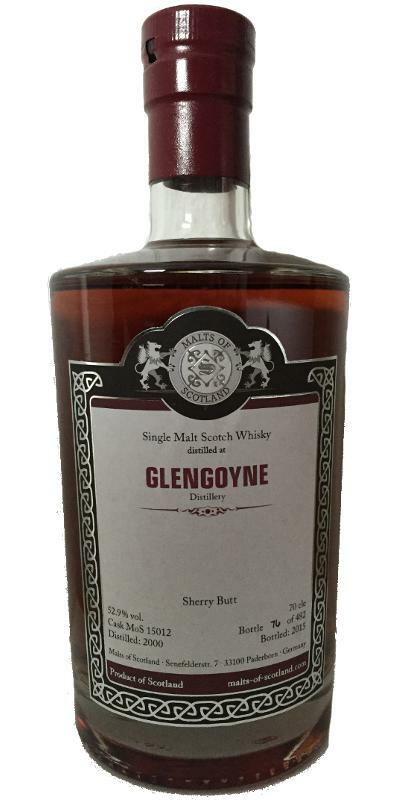 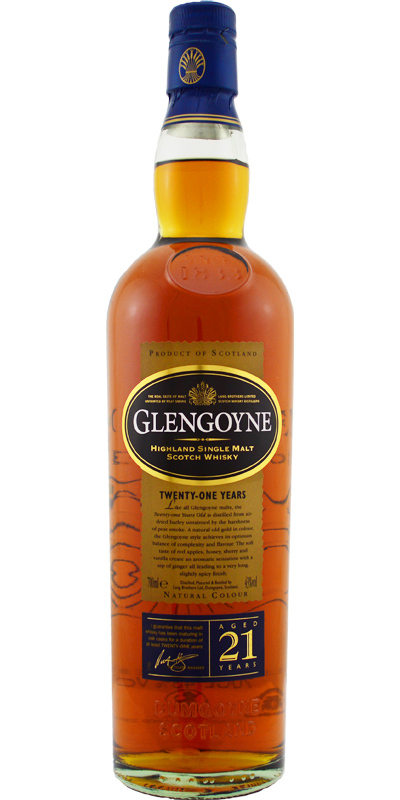 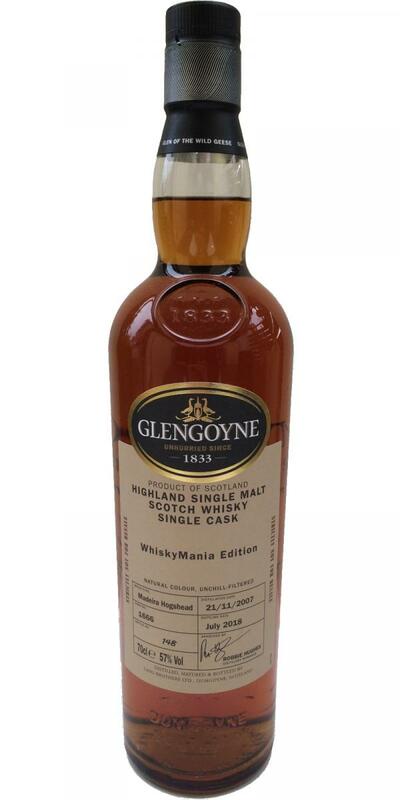 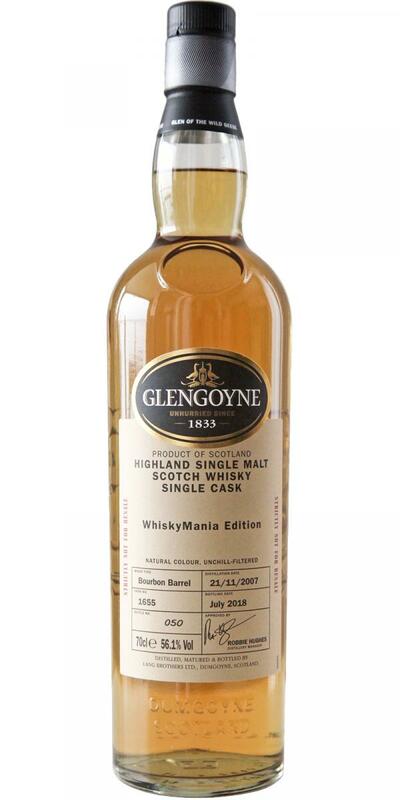 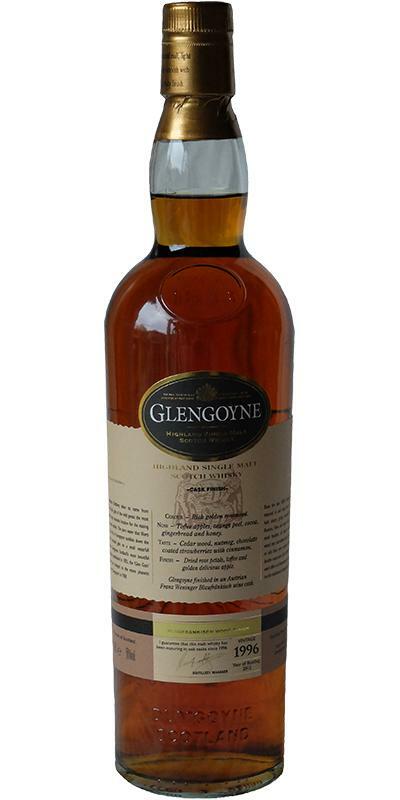 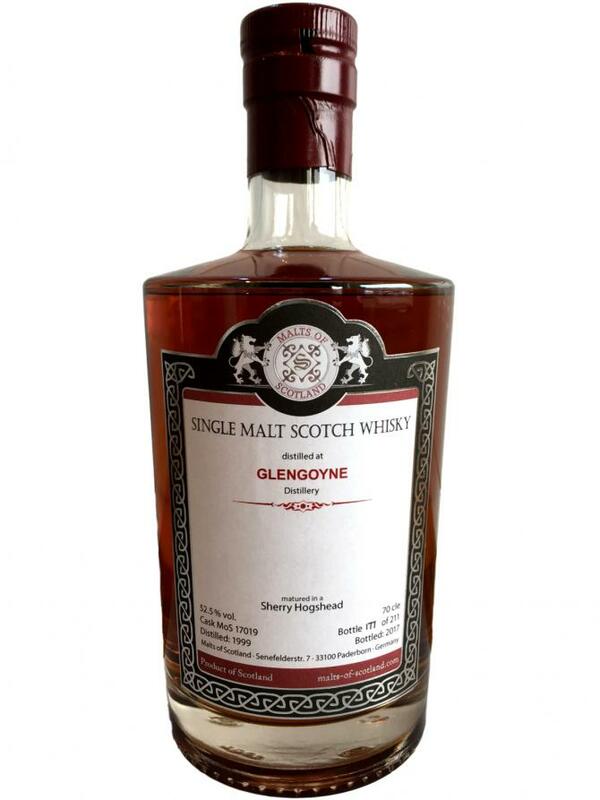 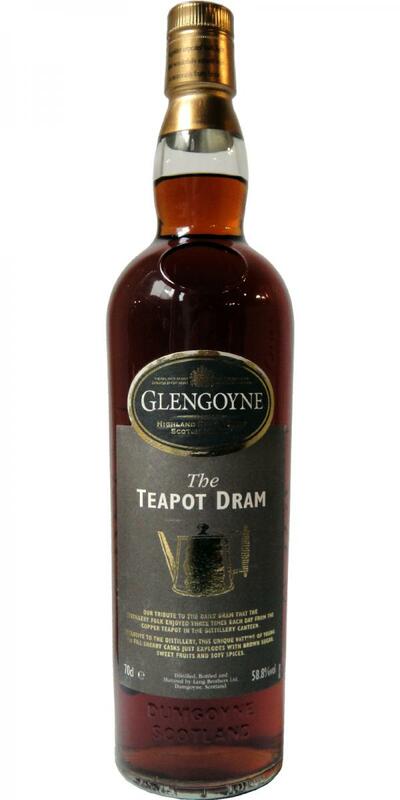 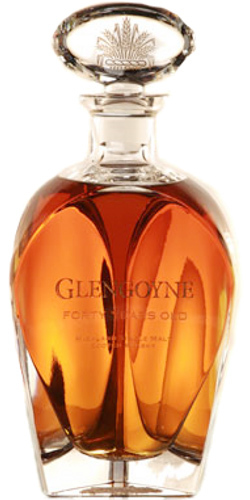 Glengoyne 25-year-old Potteries Decanter by Wade 25 50.3 % Vol. 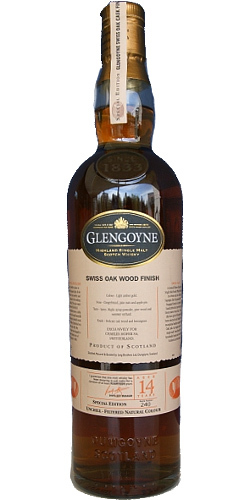 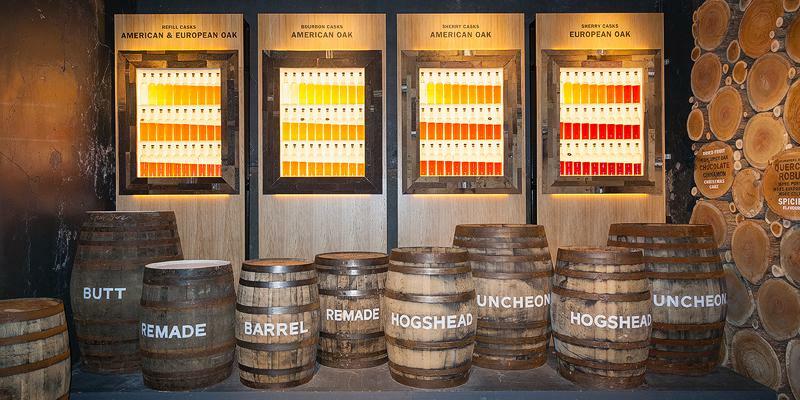 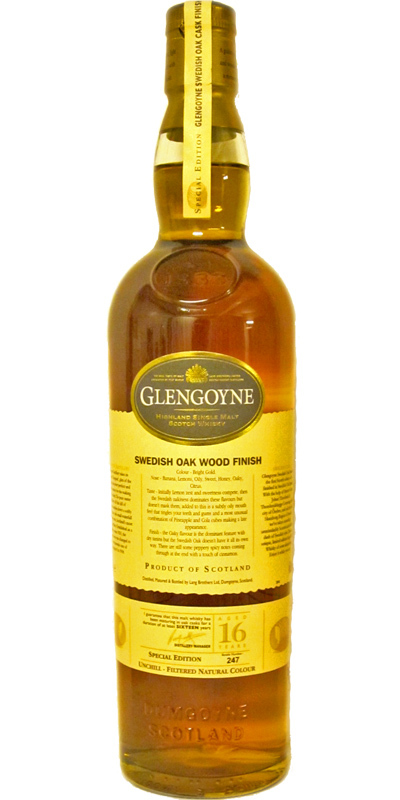 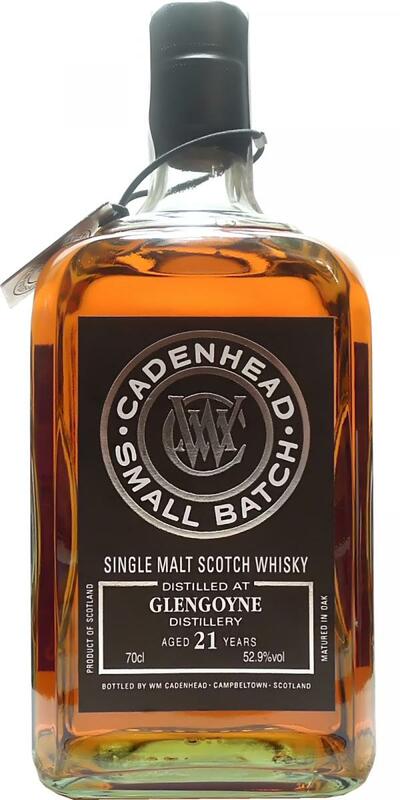 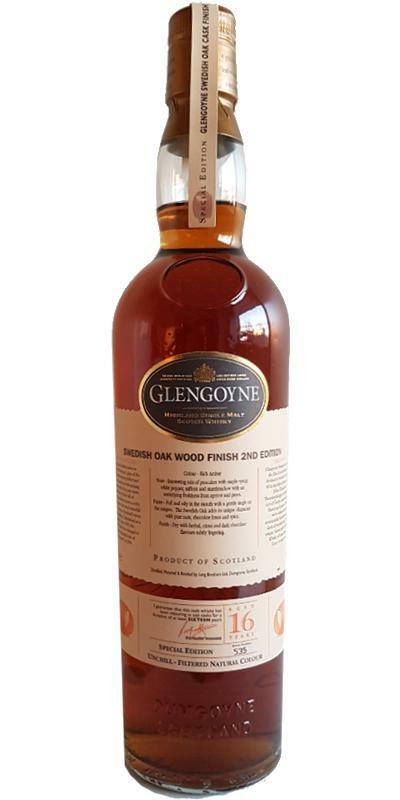 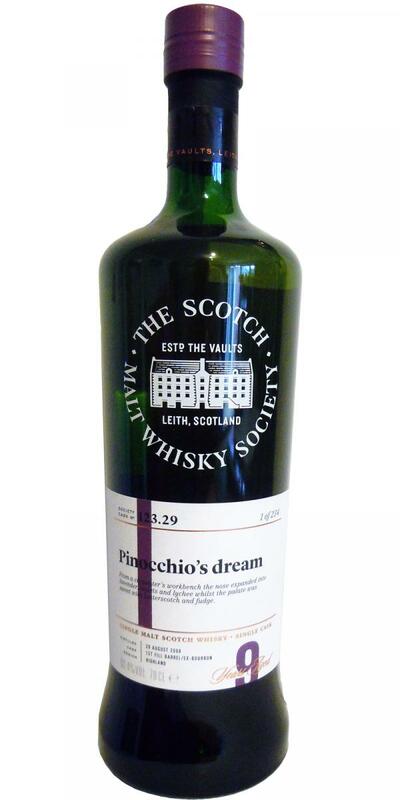 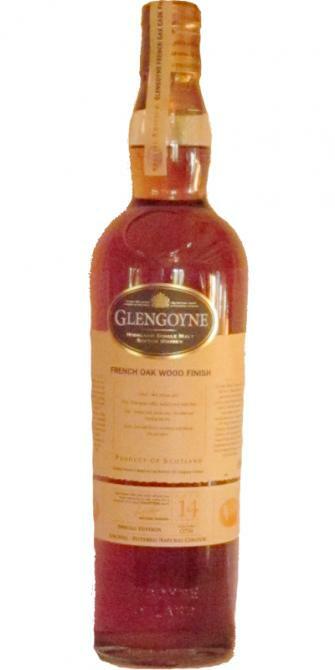 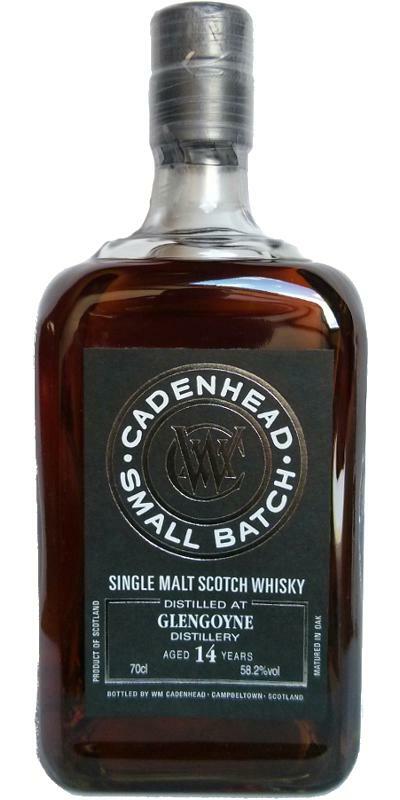 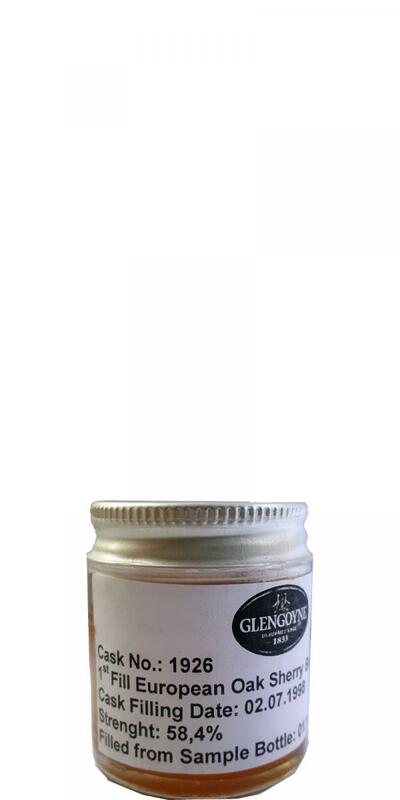 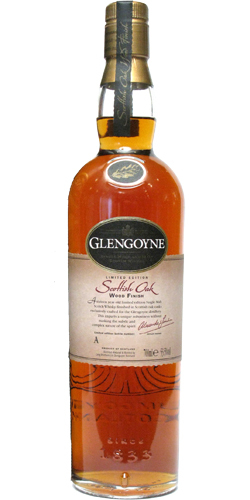 Glengoyne Scottish Oak Wood Finish - Batch B 15 43.0 % Vol. 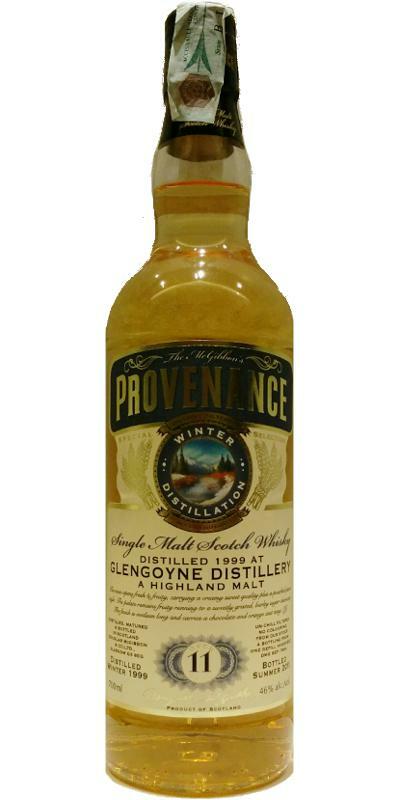 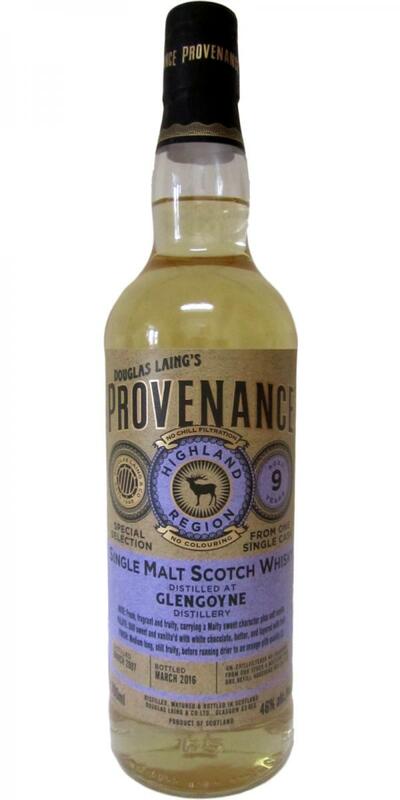 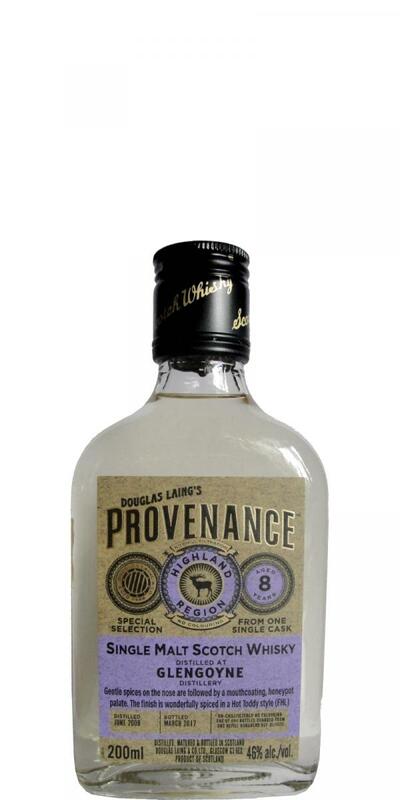 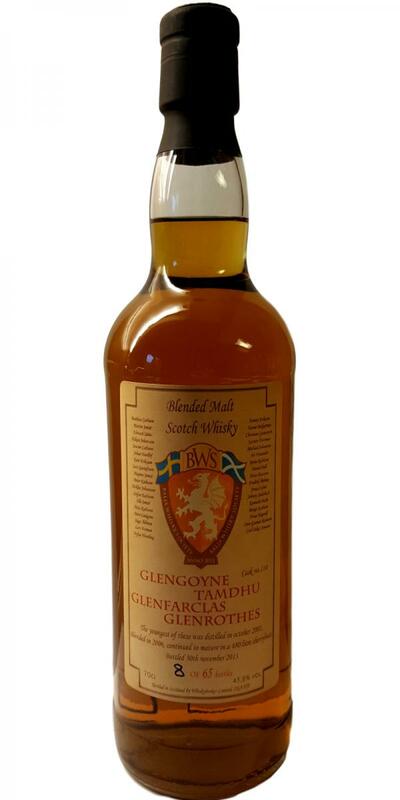 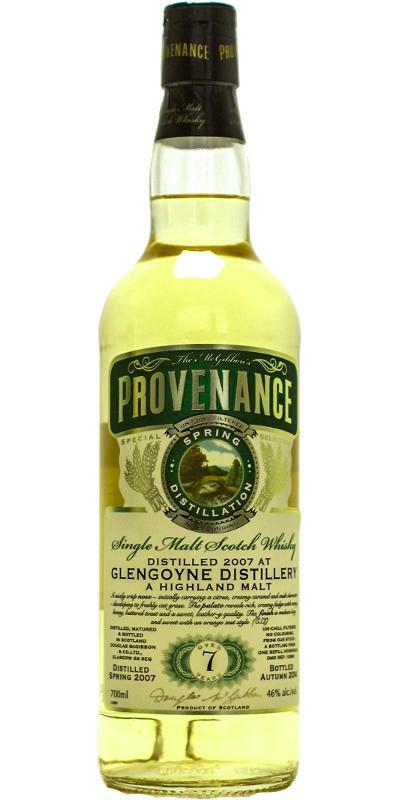 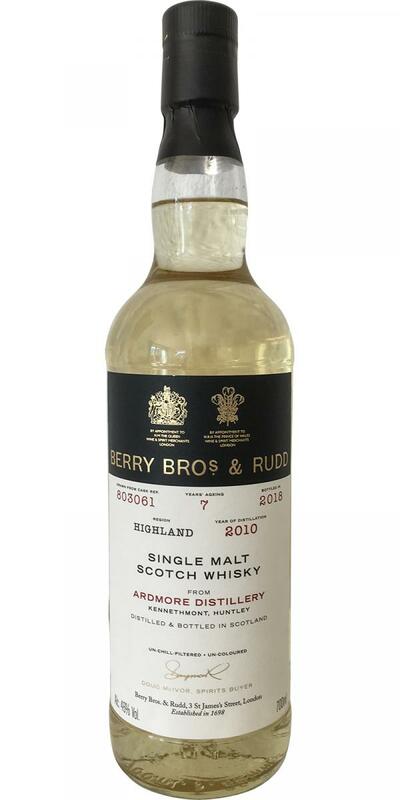 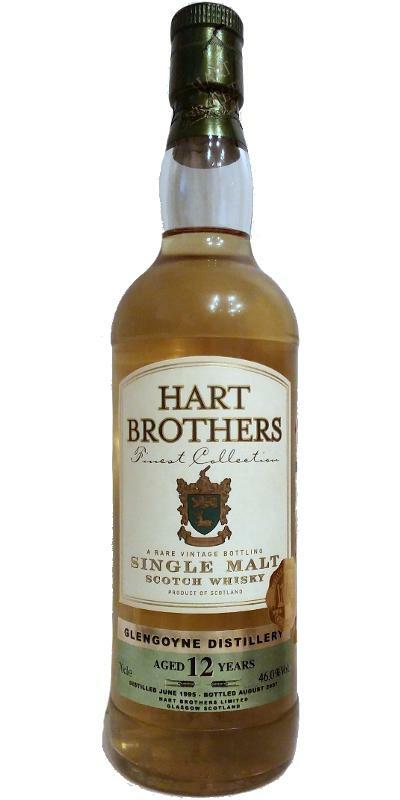 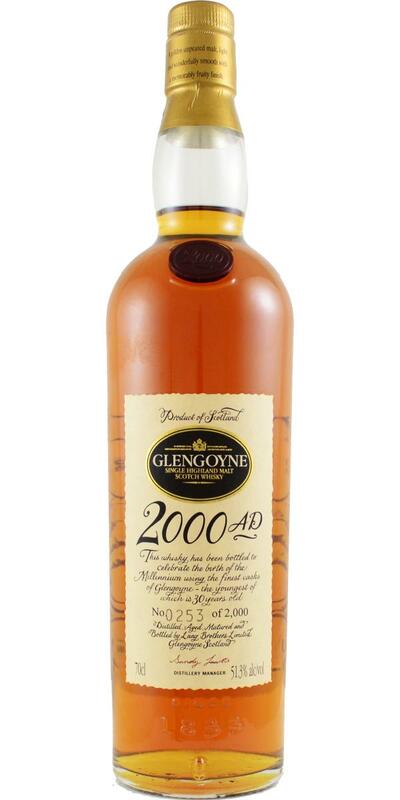 Glengoyne 2000 BRI Highland Laird 13 52.1 % Vol. 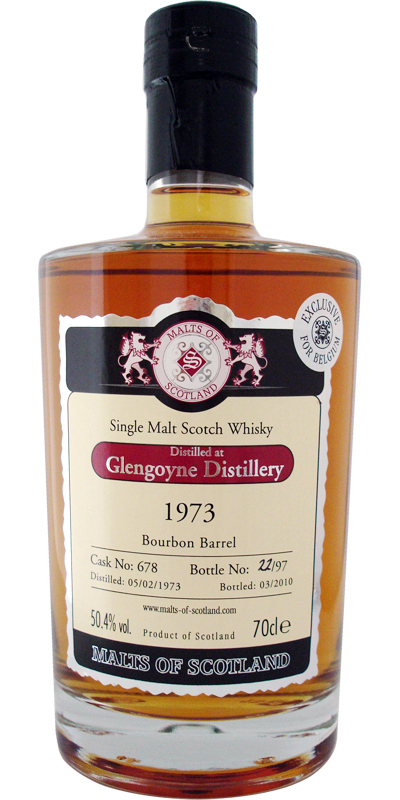 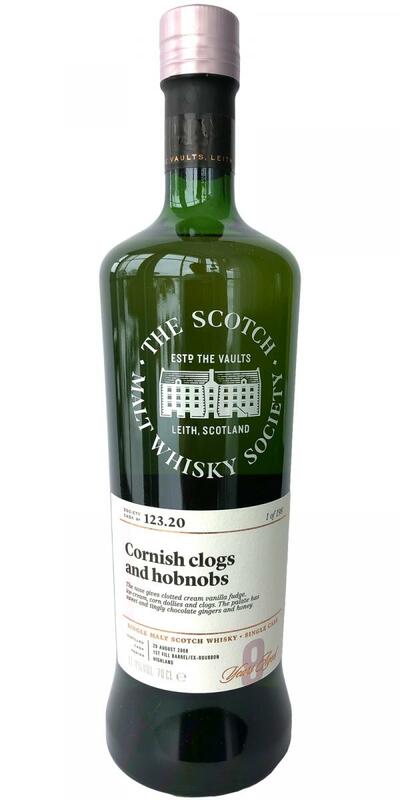 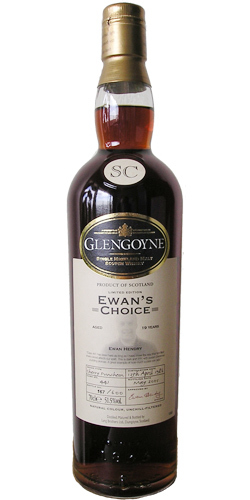 Glengoyne 1969 CA Chairman's Stock 26 62.2 % Vol. 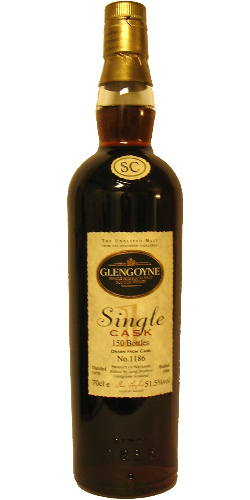 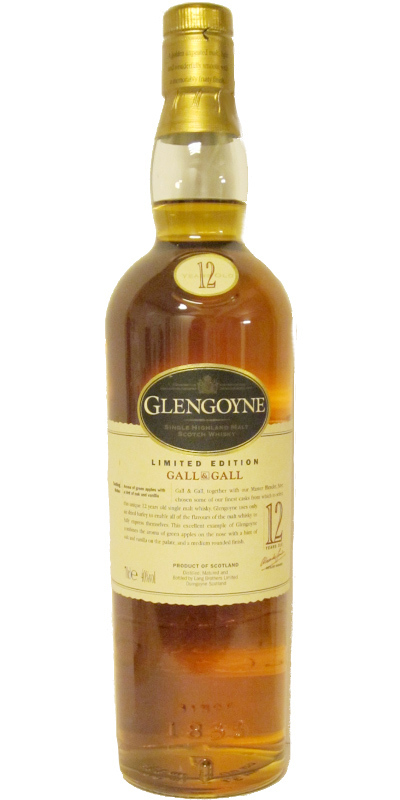 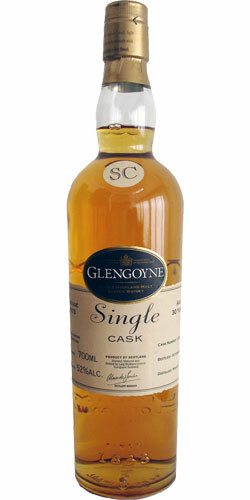 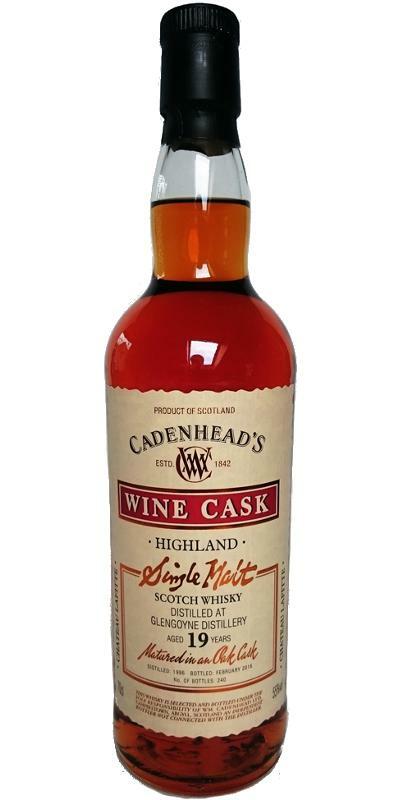 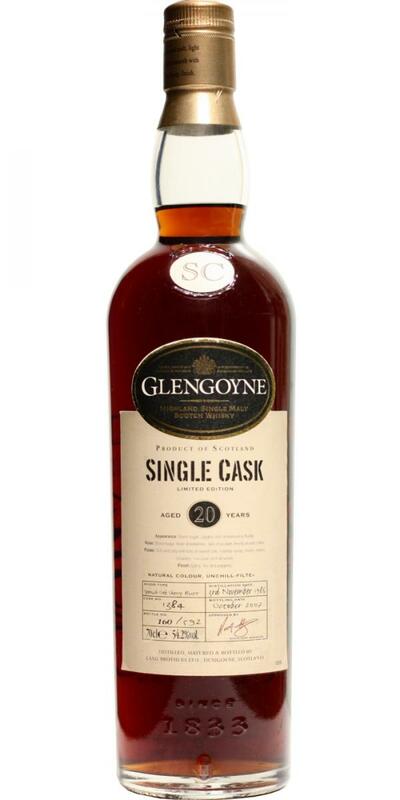 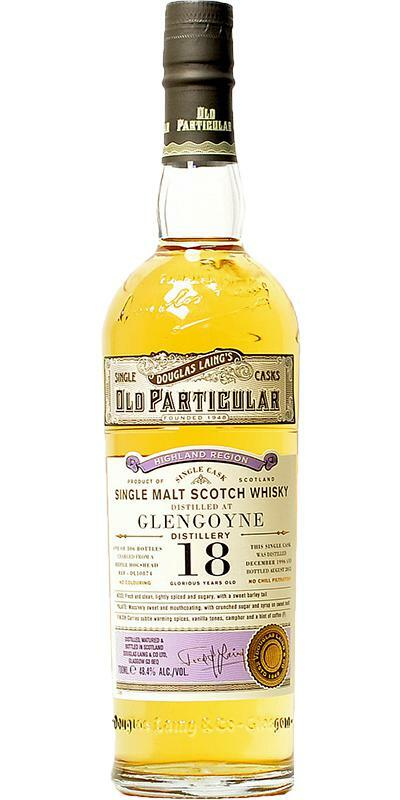 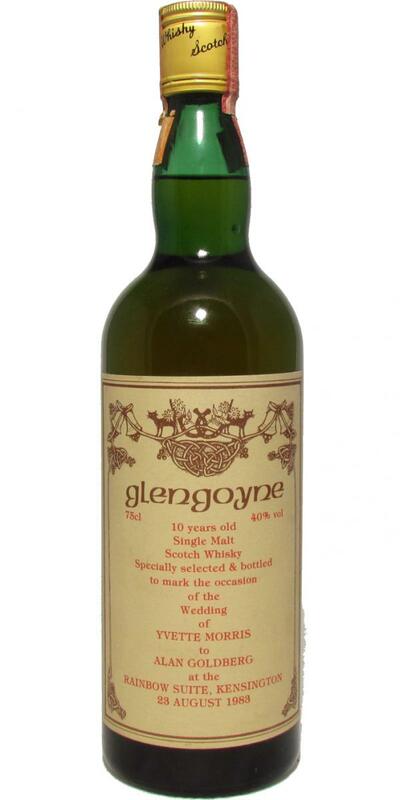 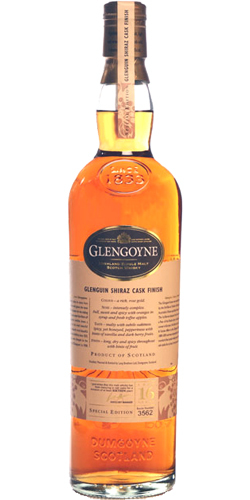 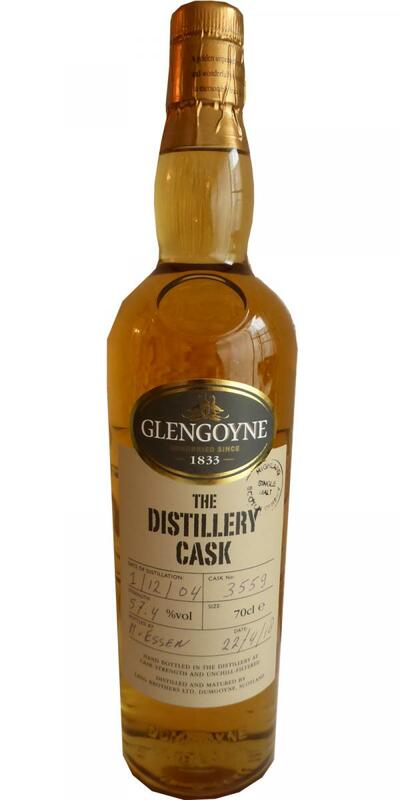 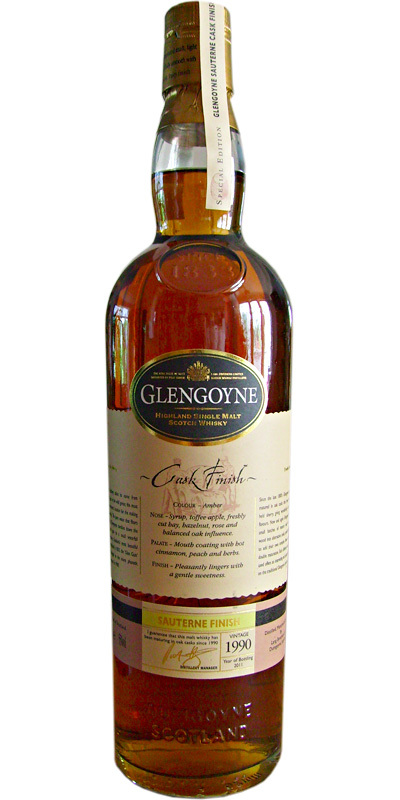 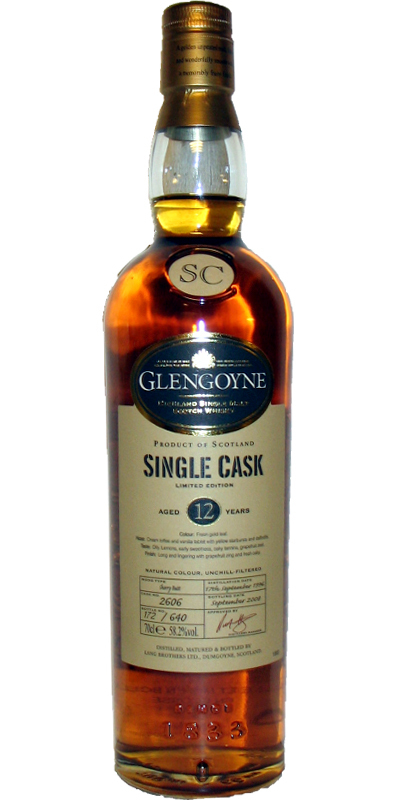 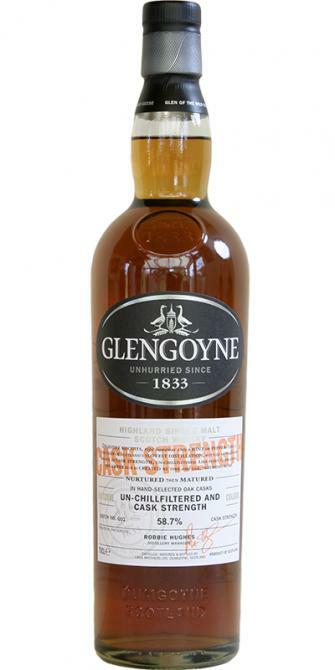 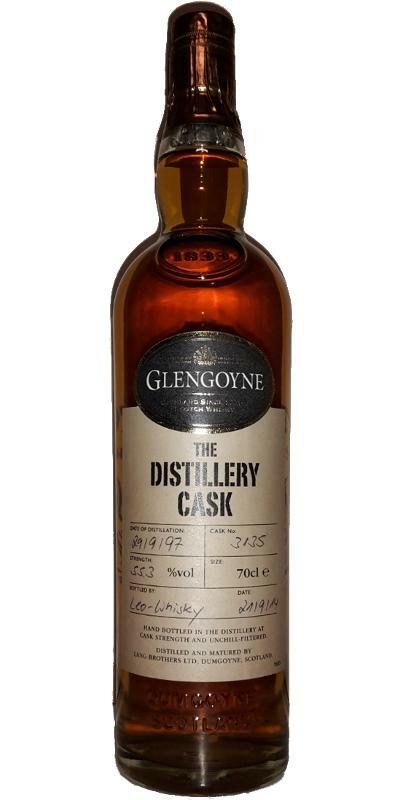 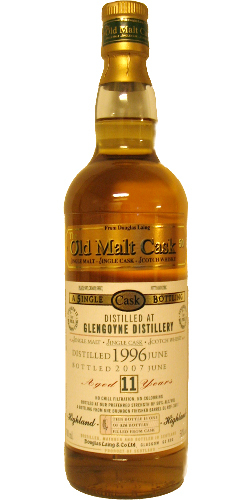 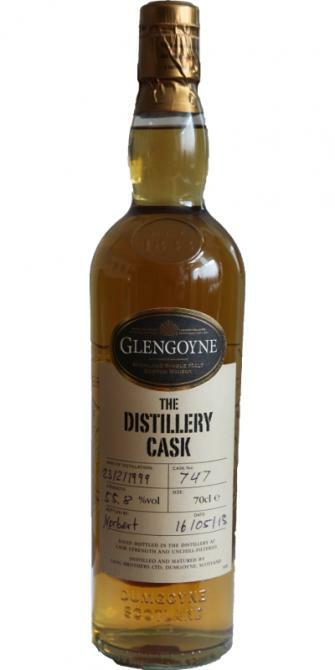 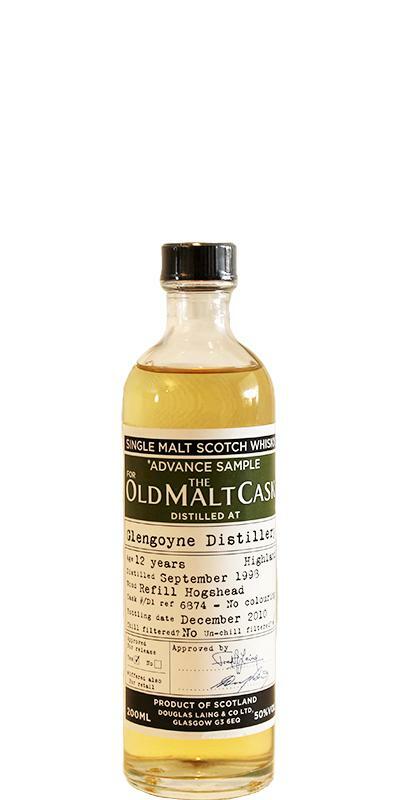 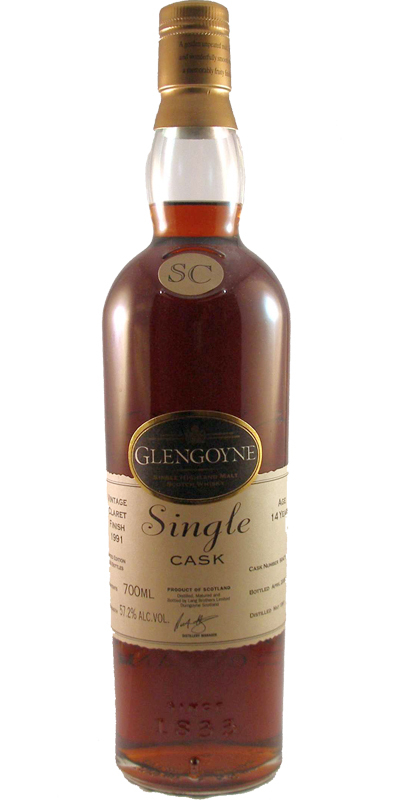 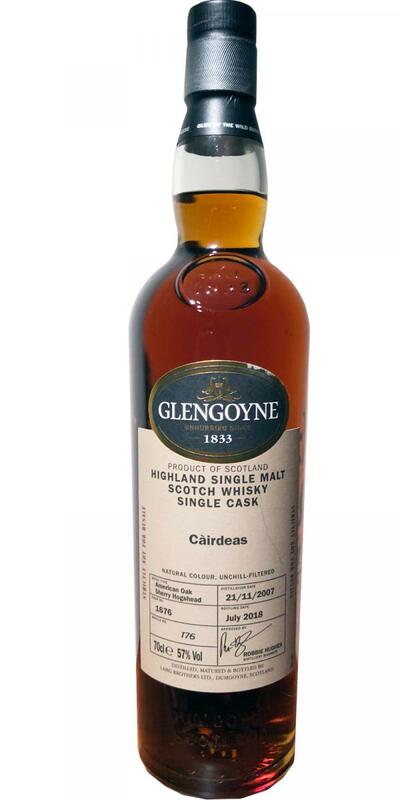 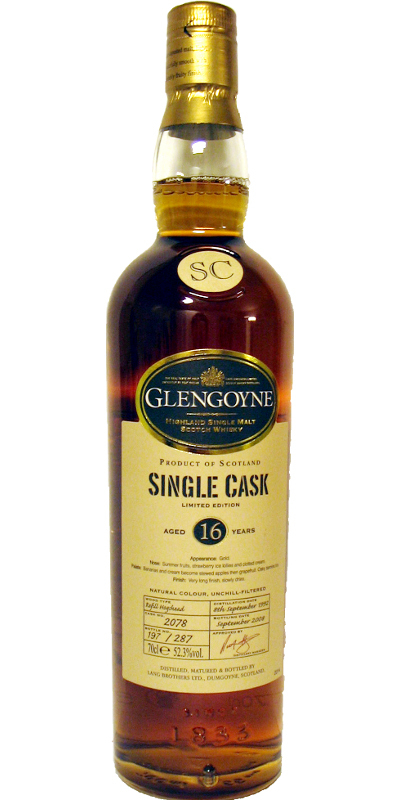 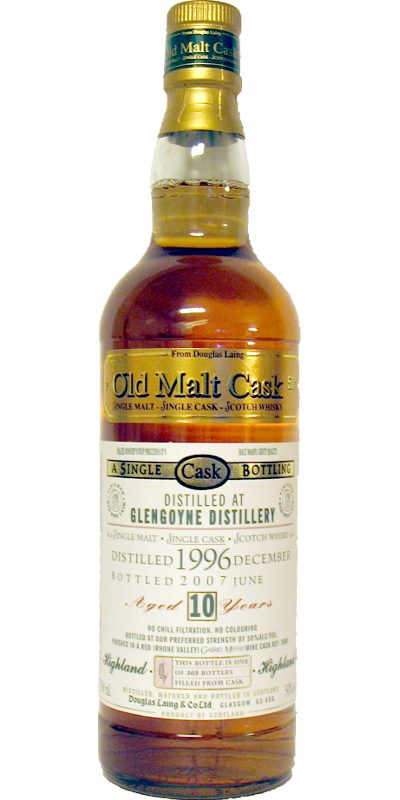 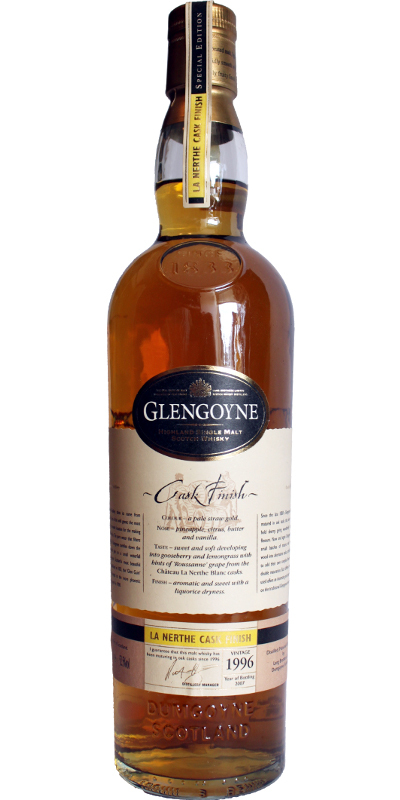 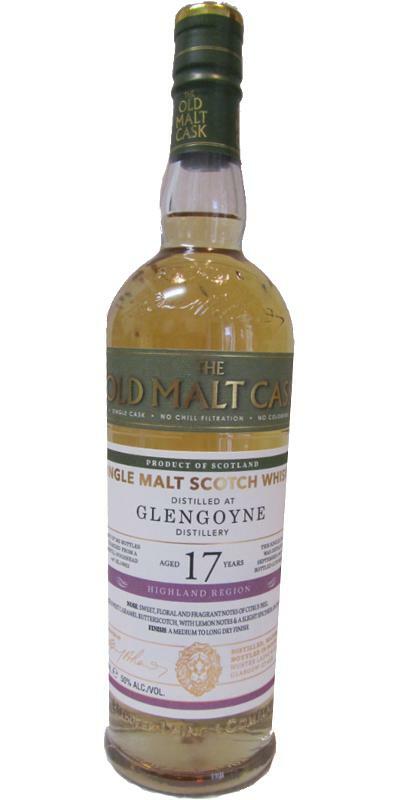 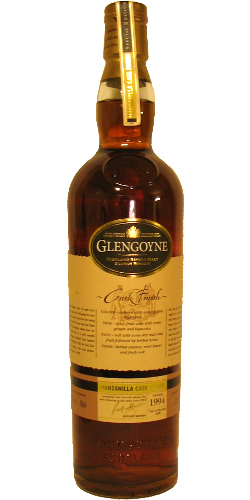 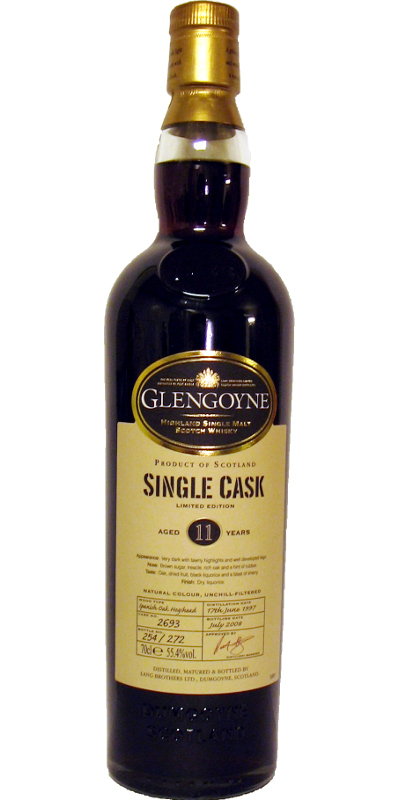 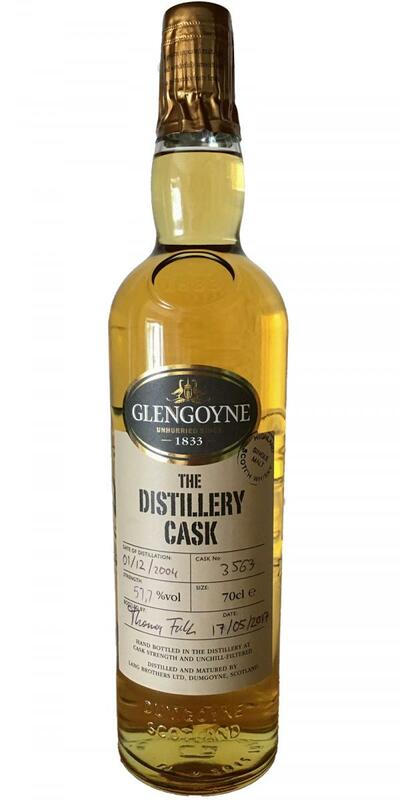 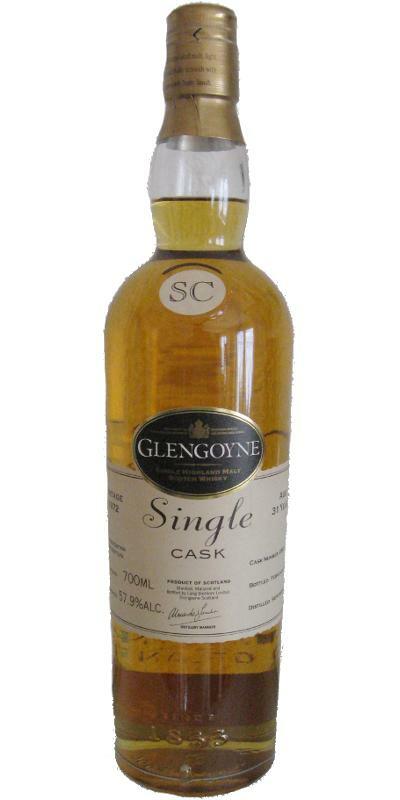 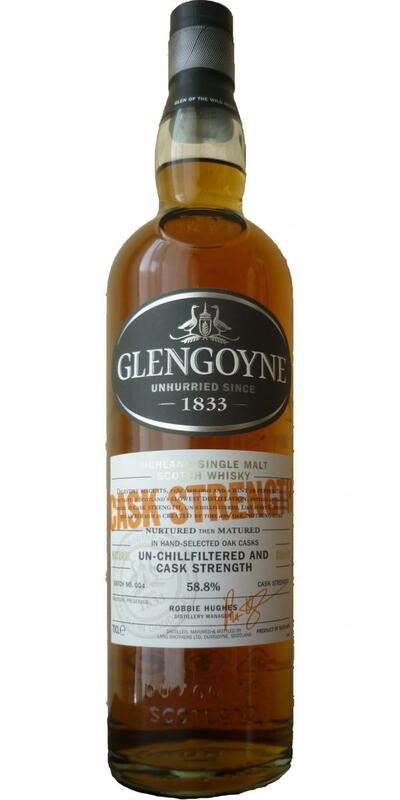 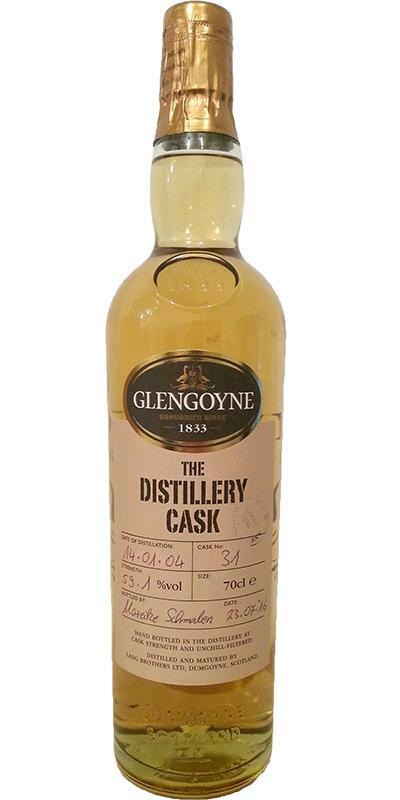 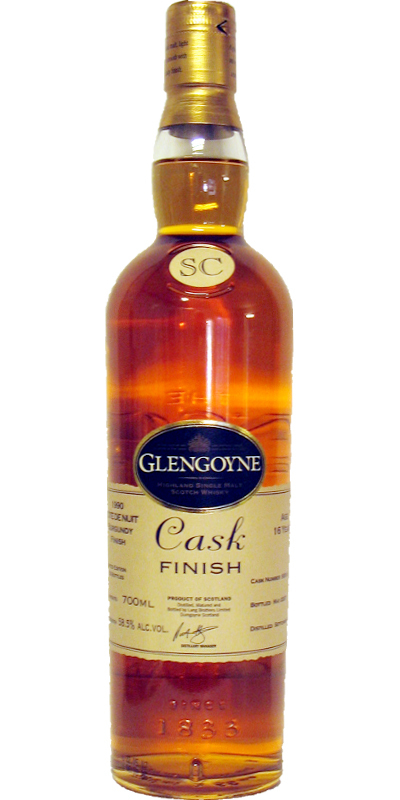 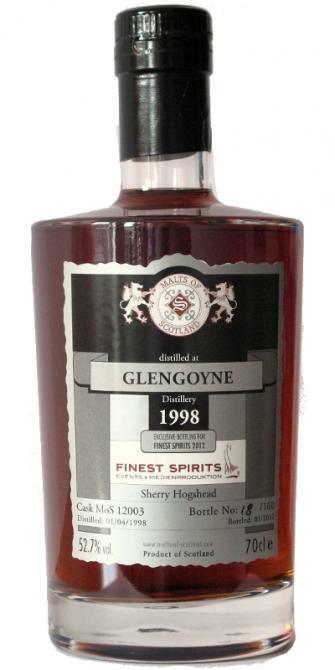 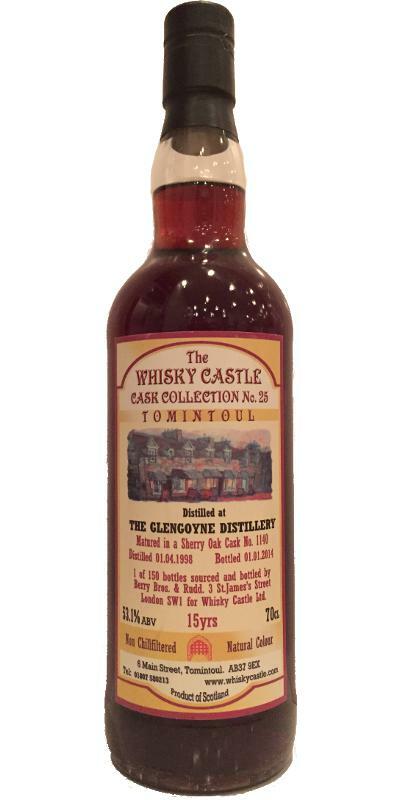 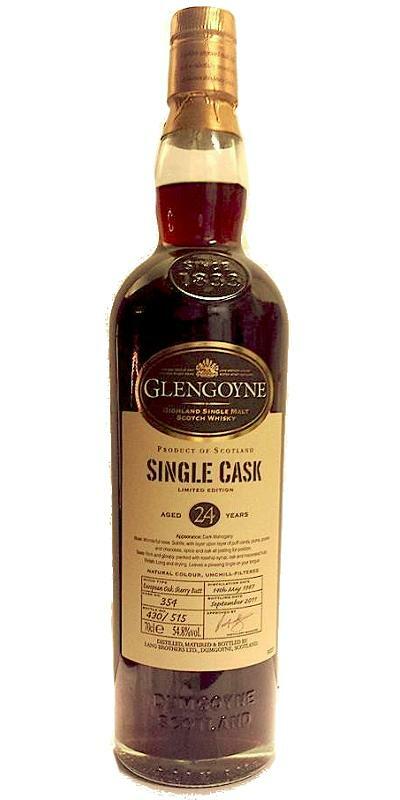 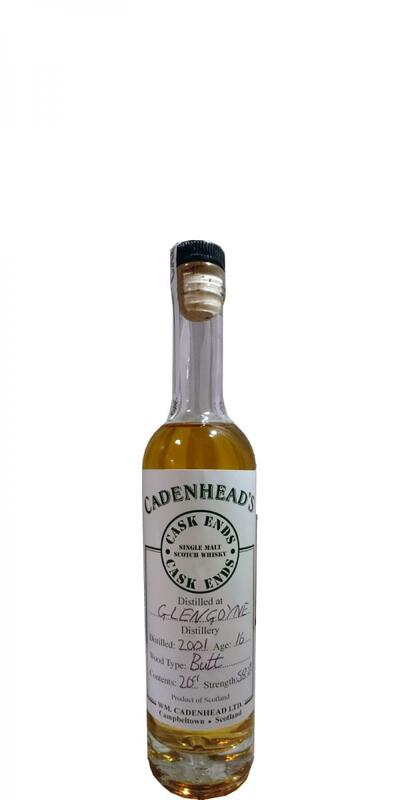 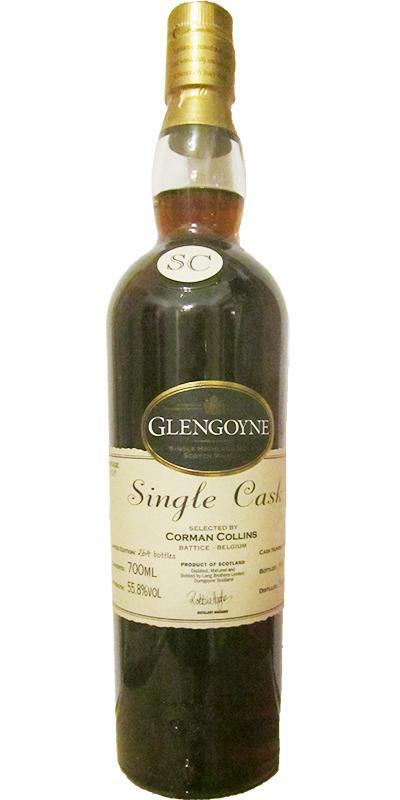 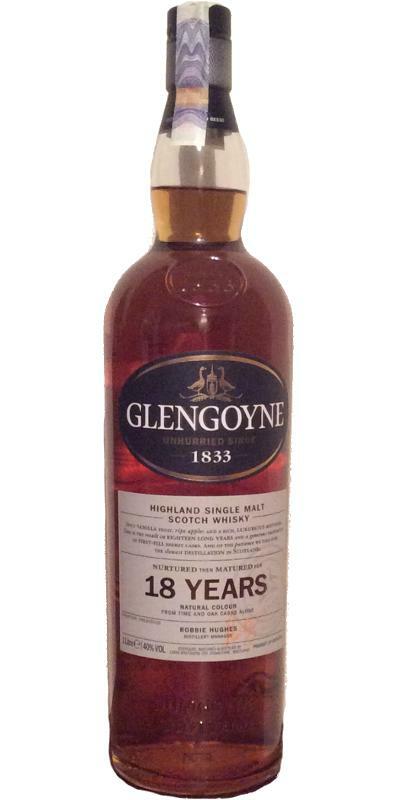 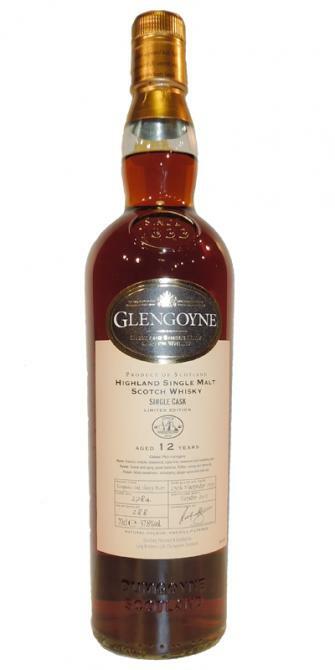 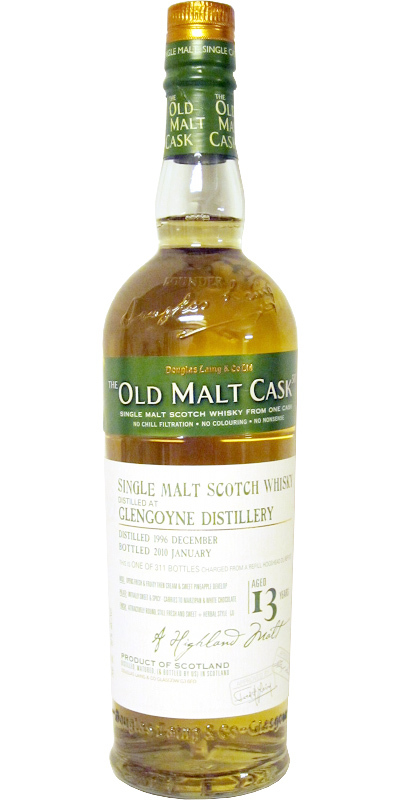 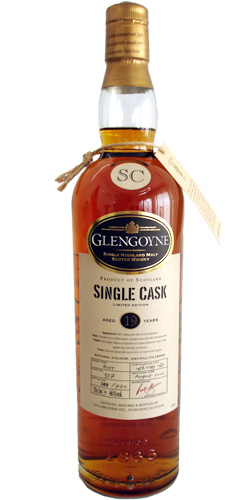 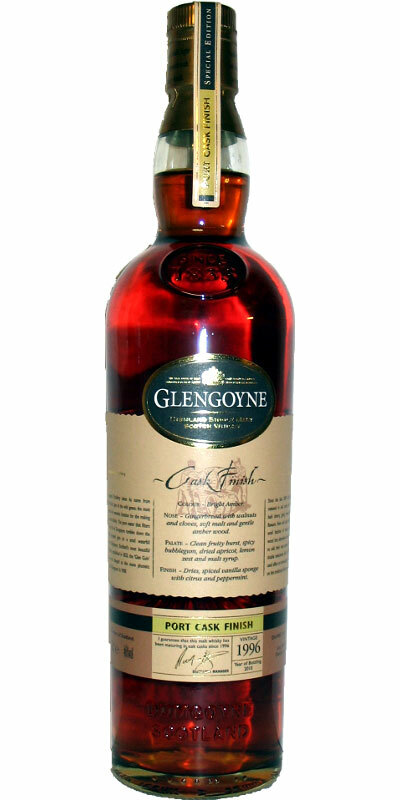 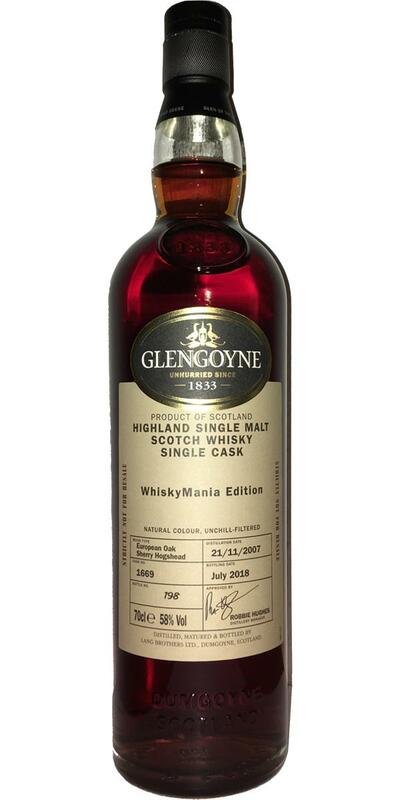 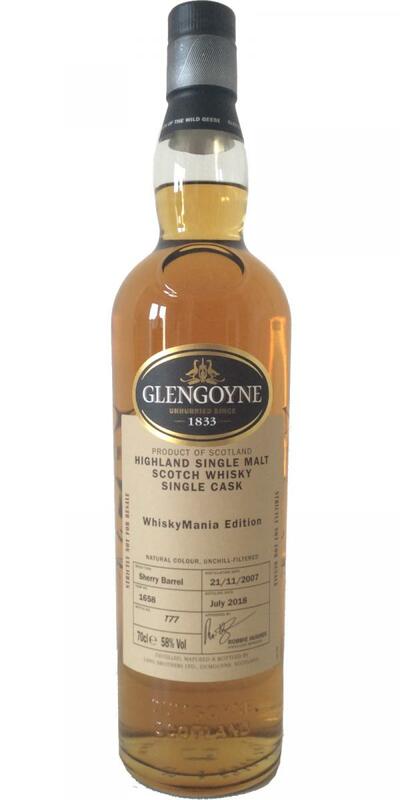 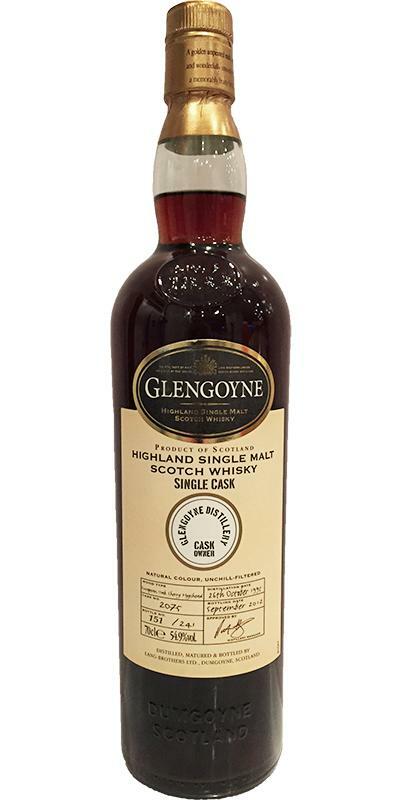 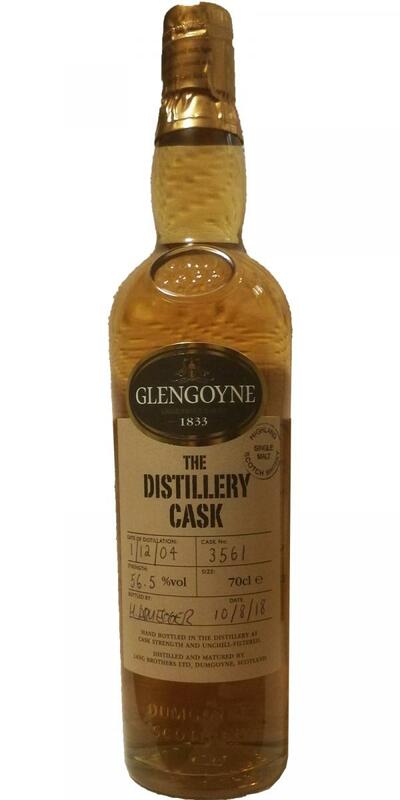 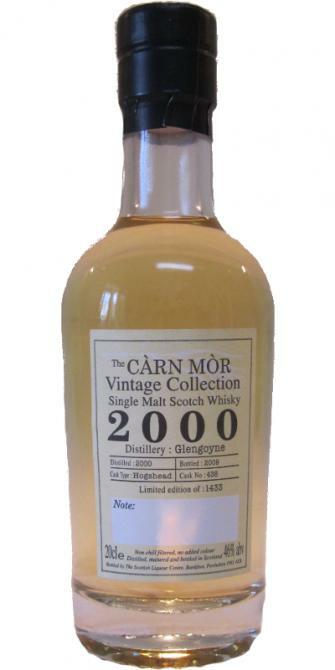 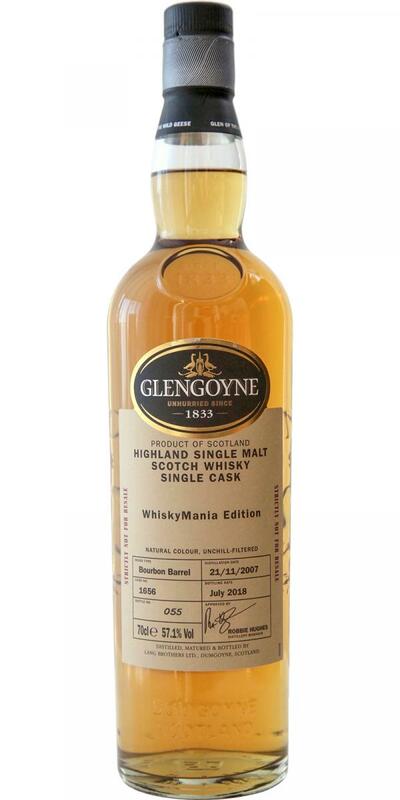 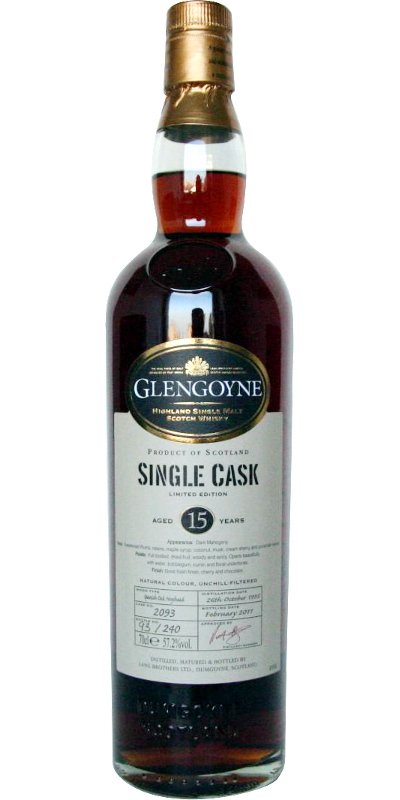 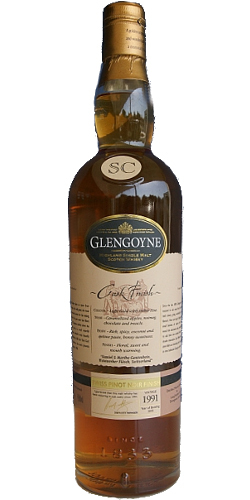 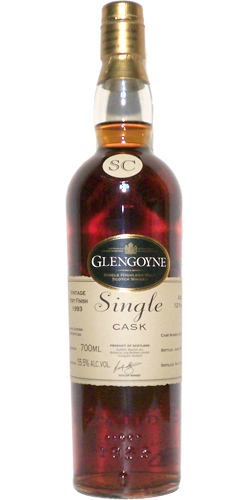 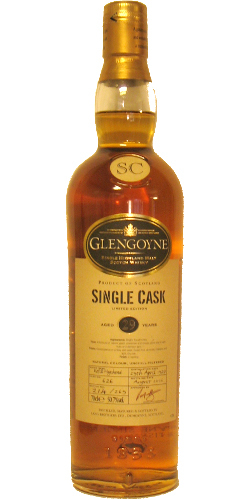 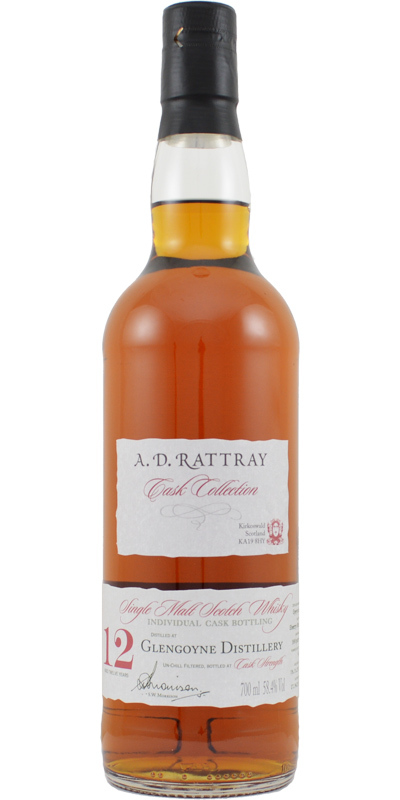 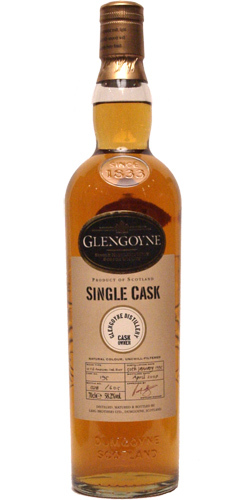 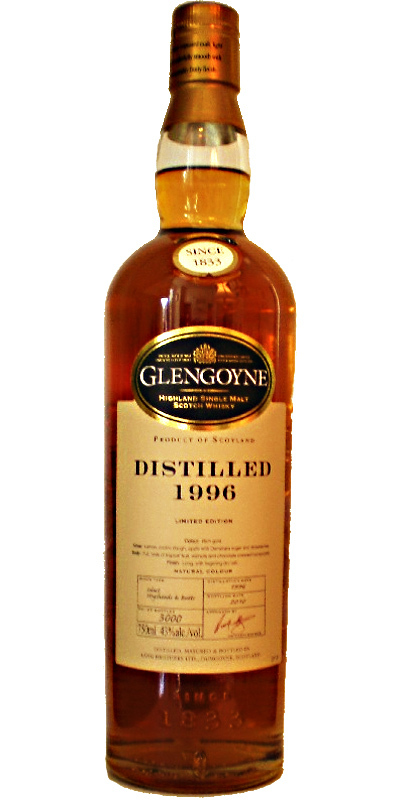 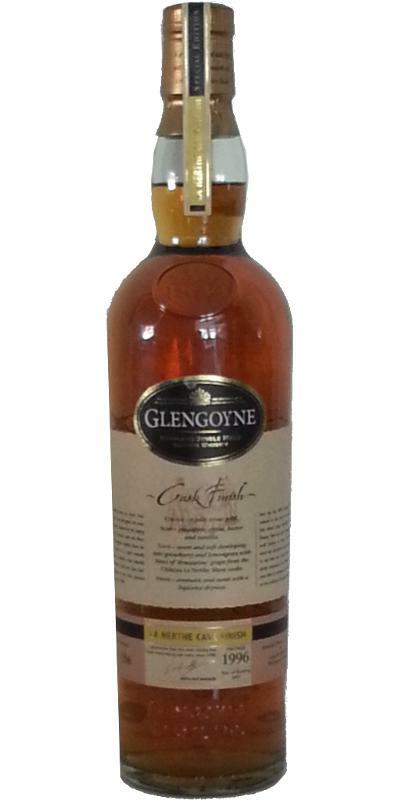 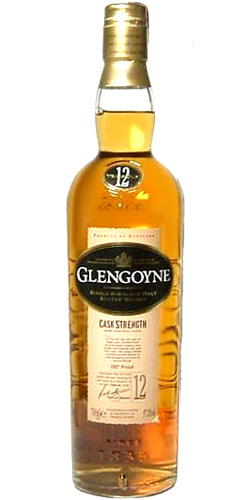 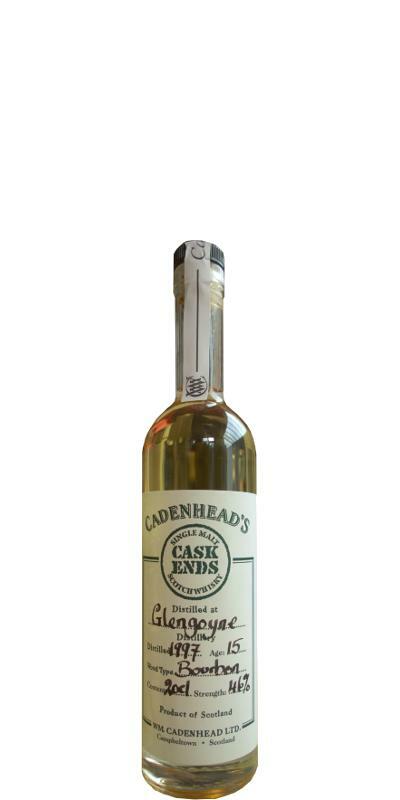 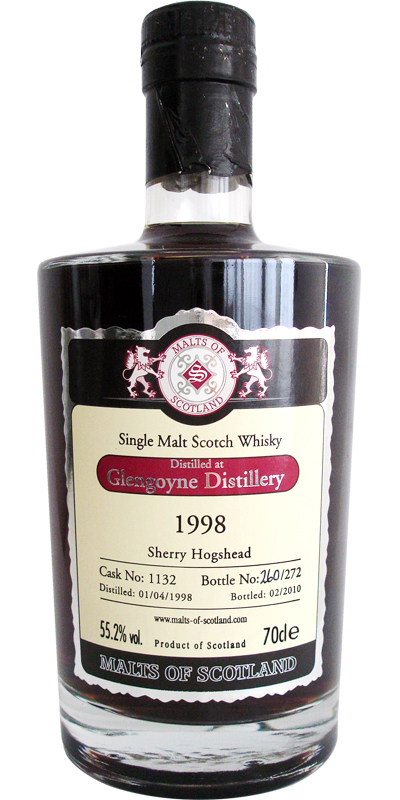 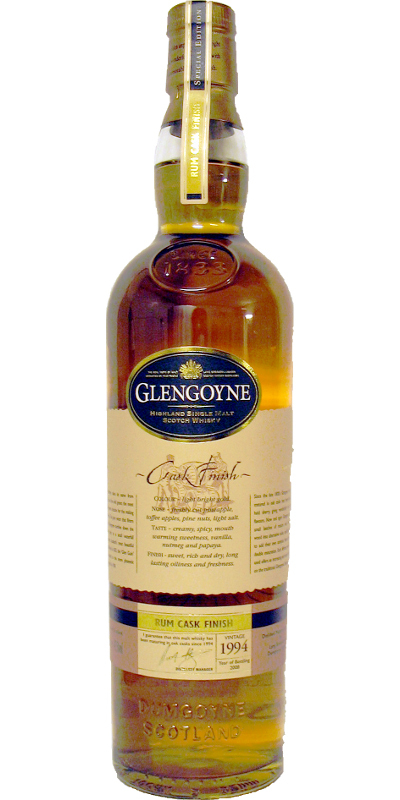 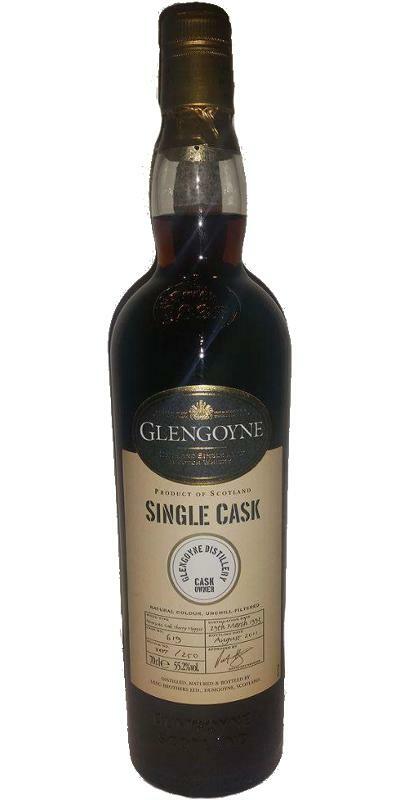 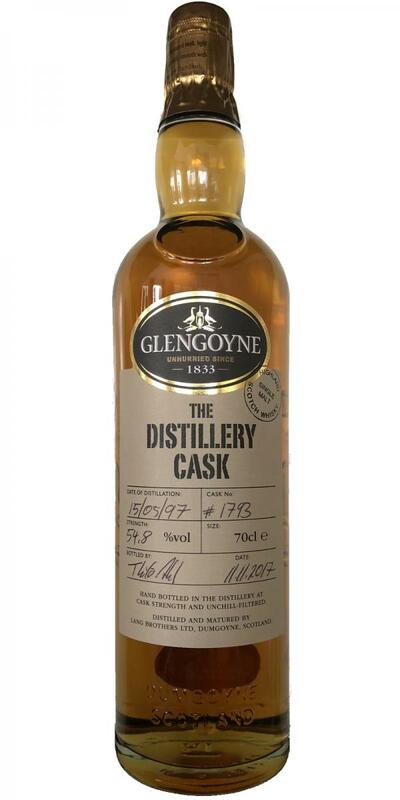 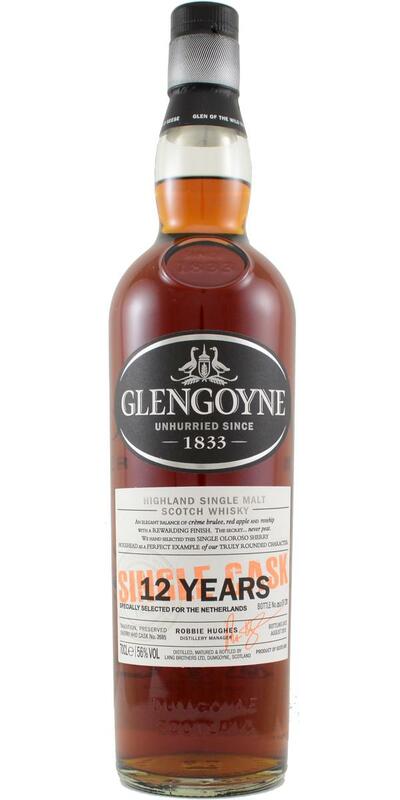 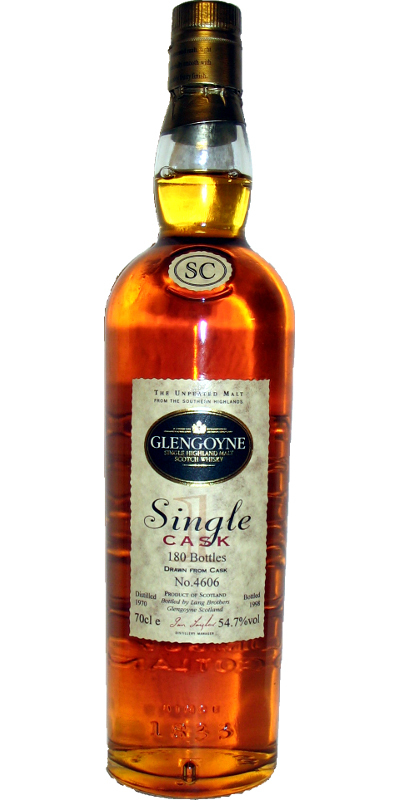 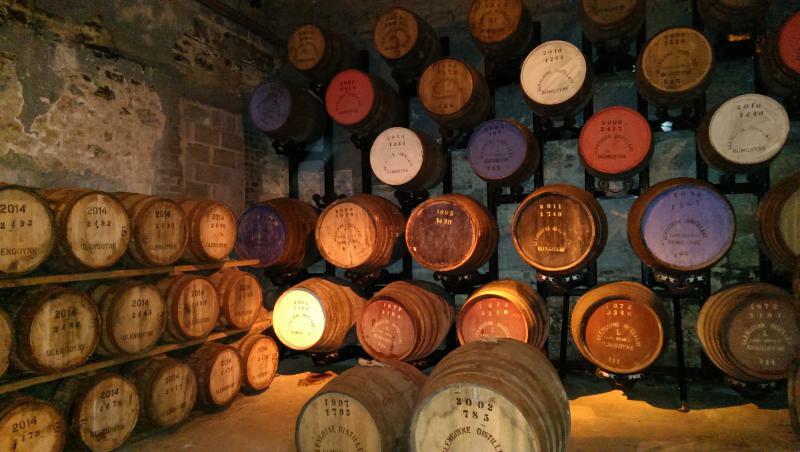 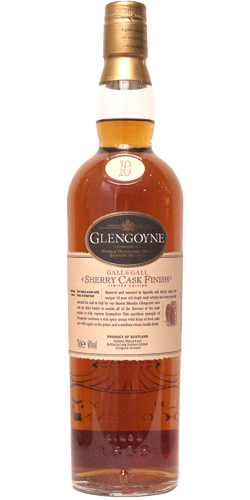 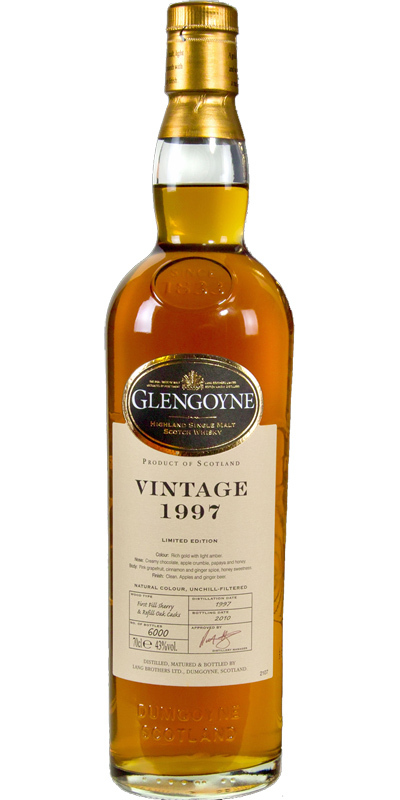 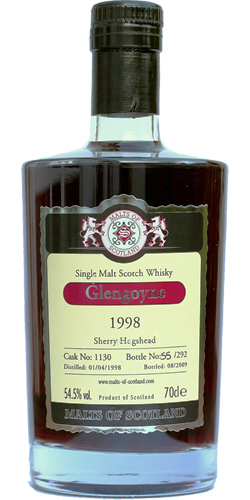 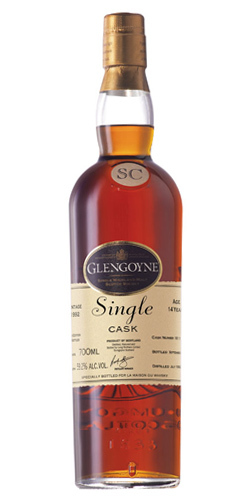 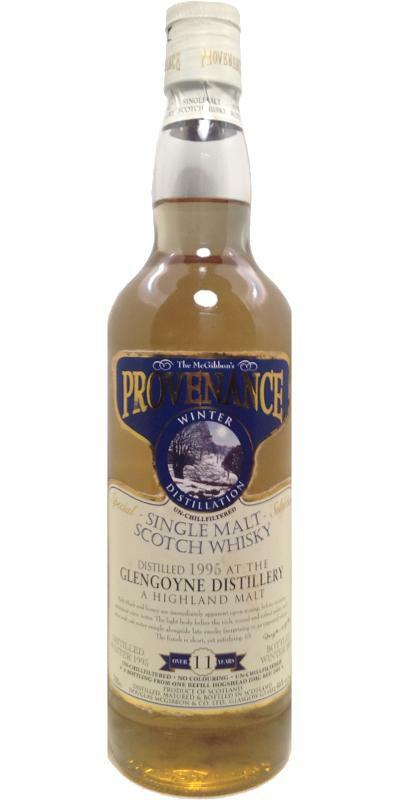 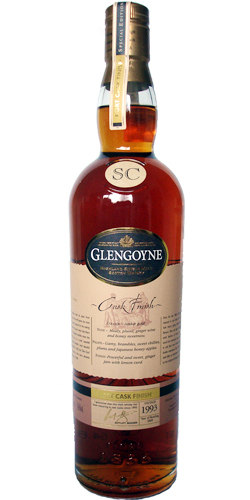 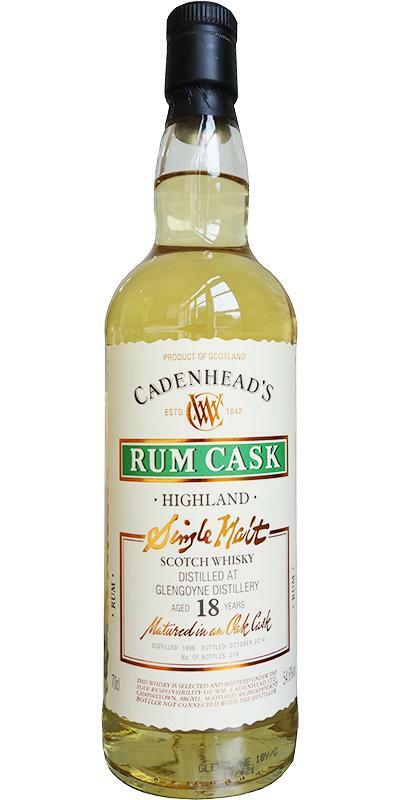 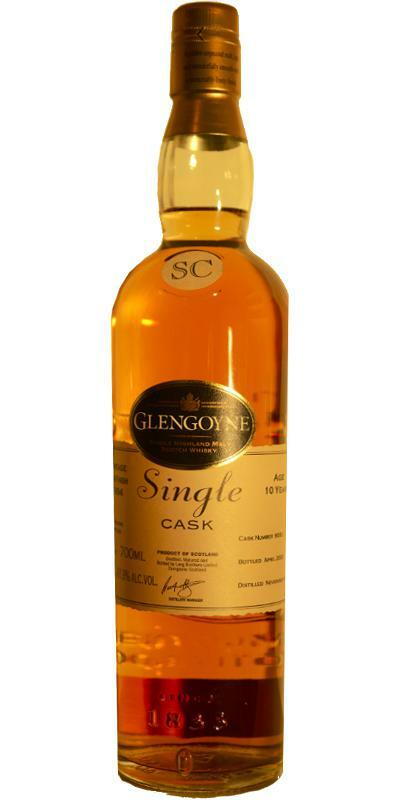 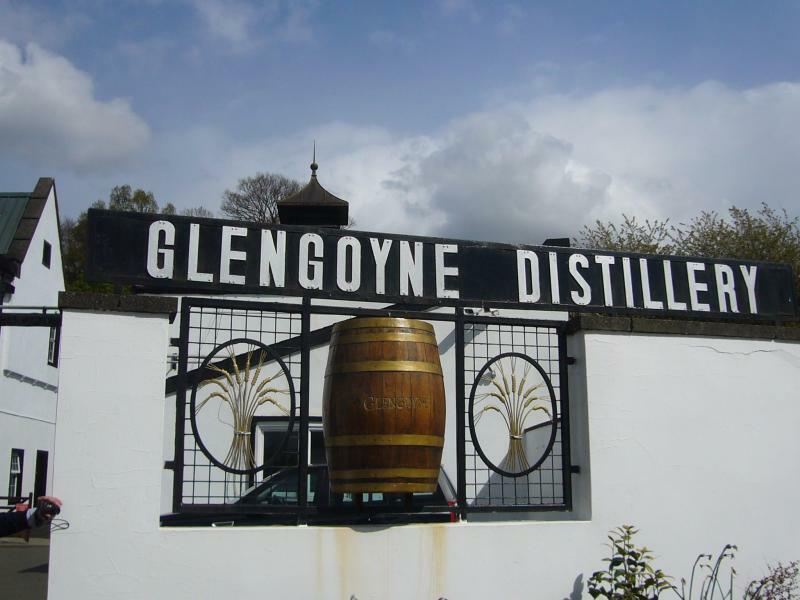 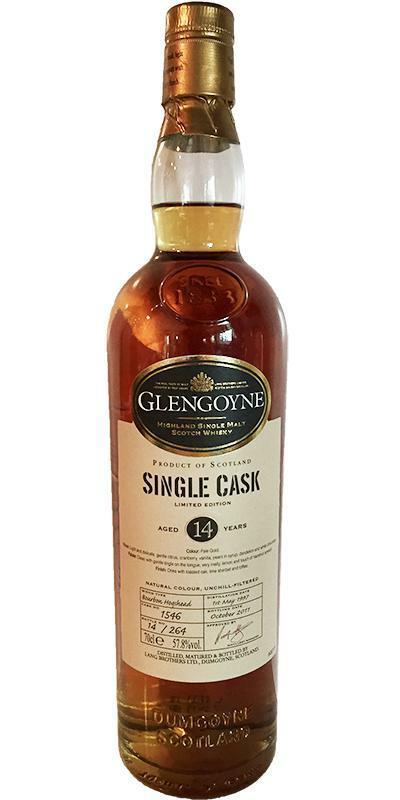 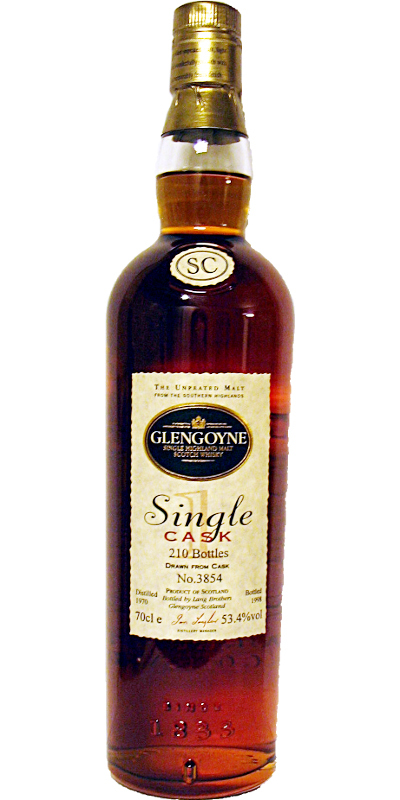 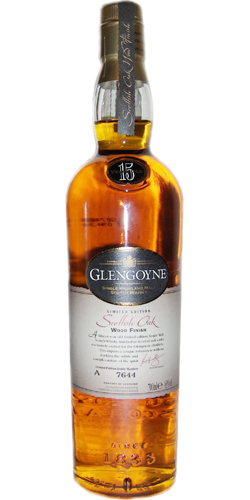 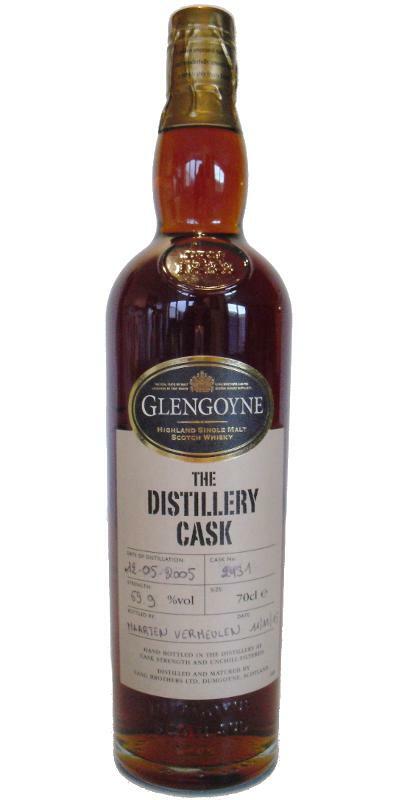 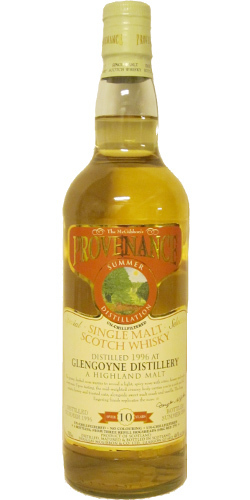 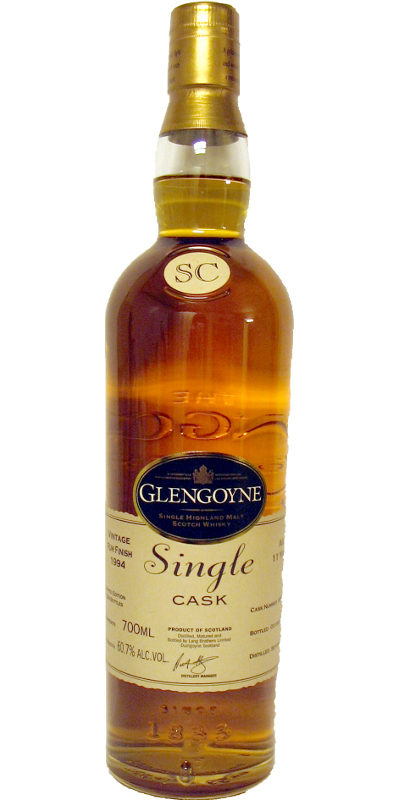 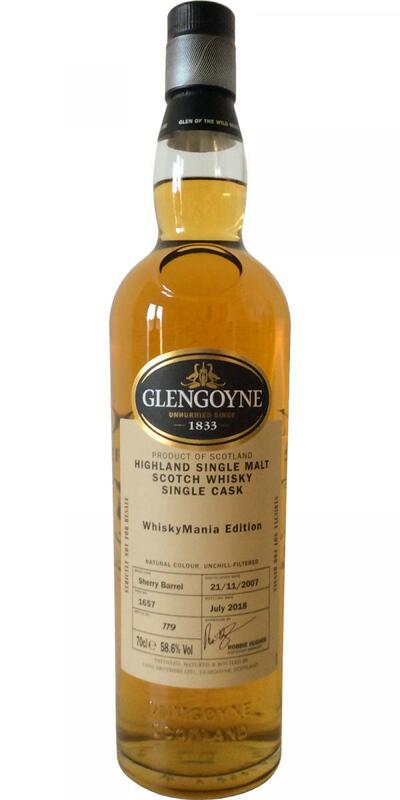 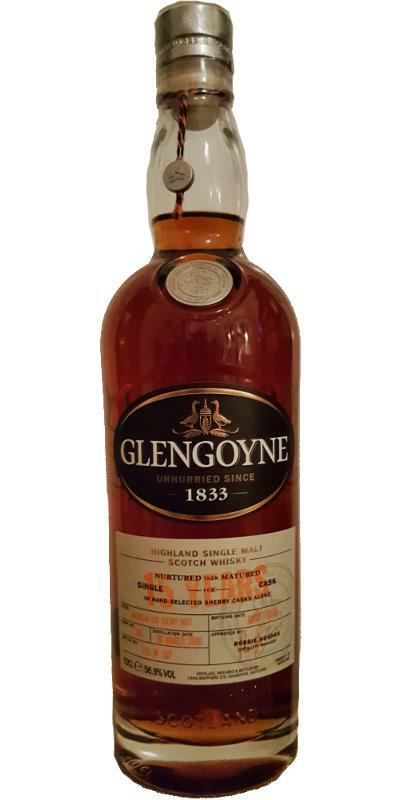 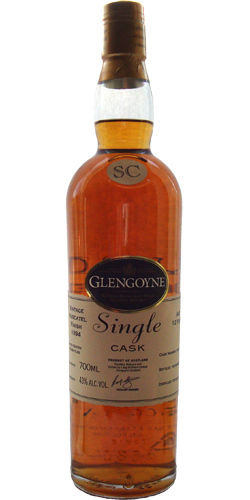 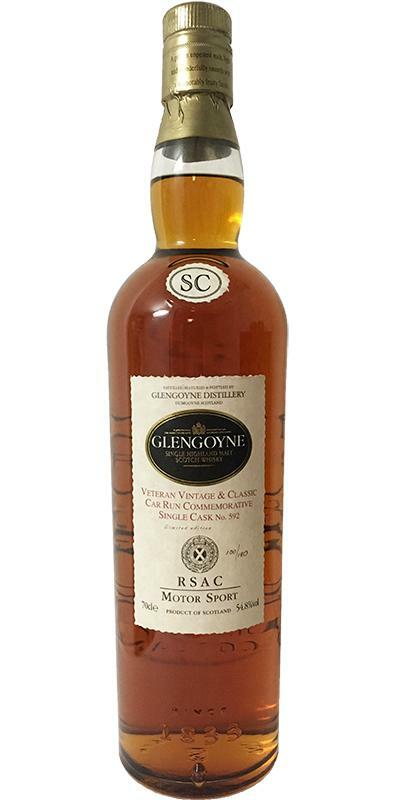 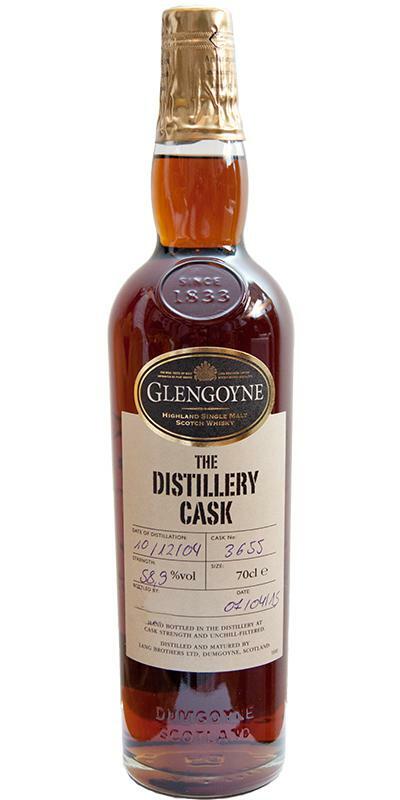 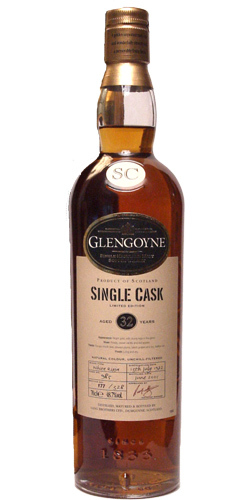 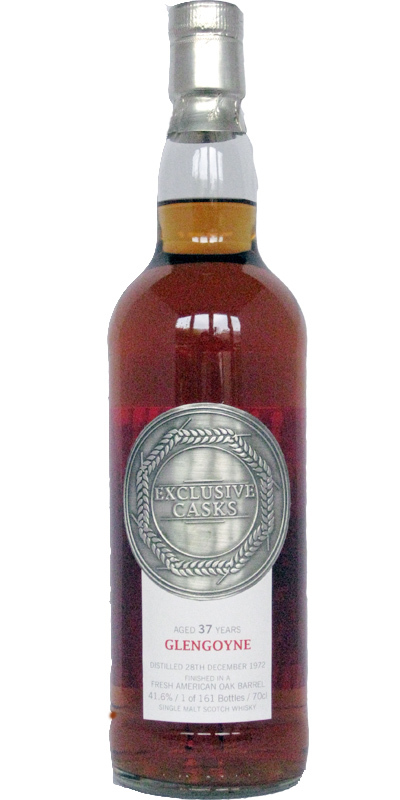 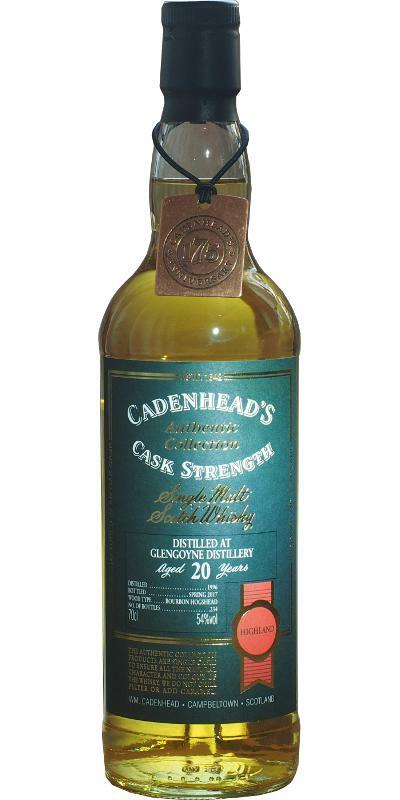 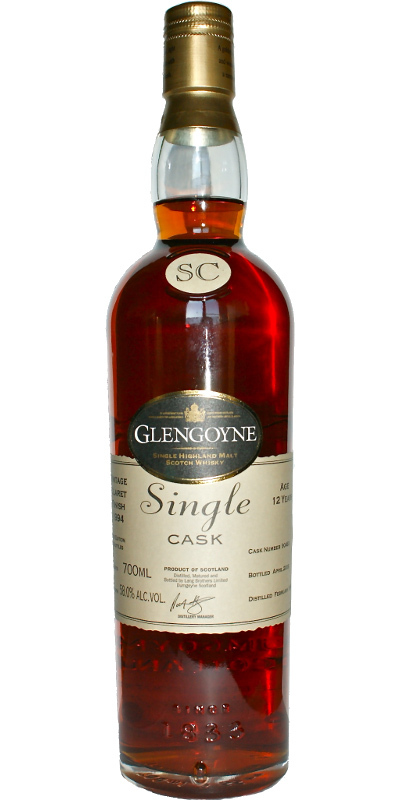 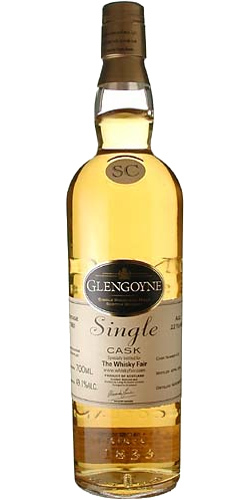 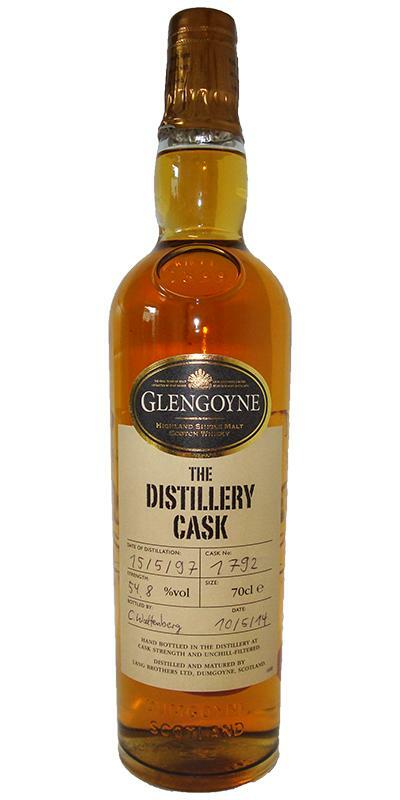 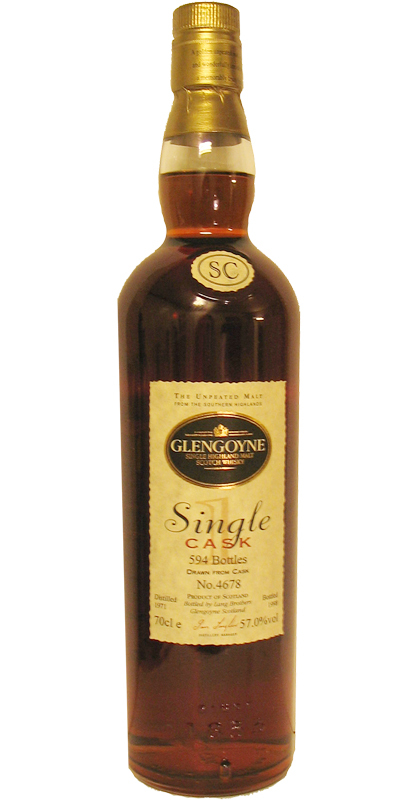 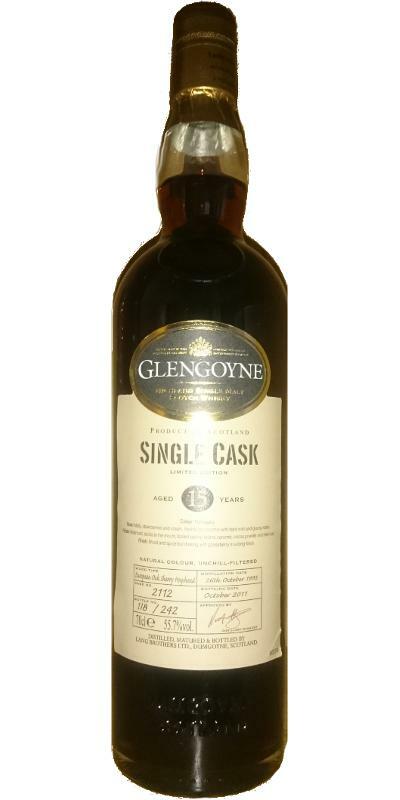 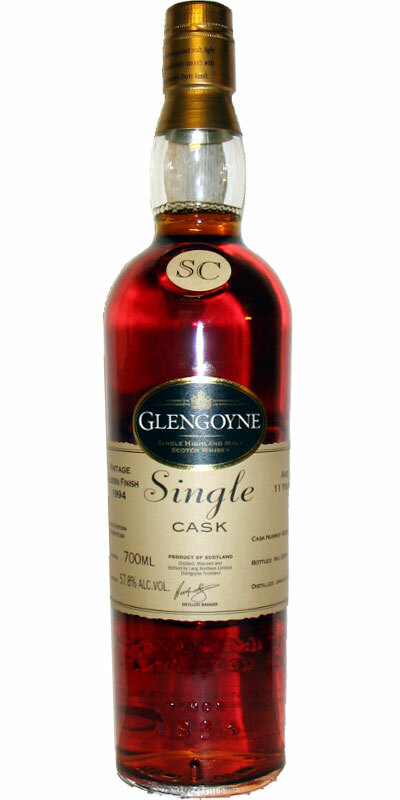 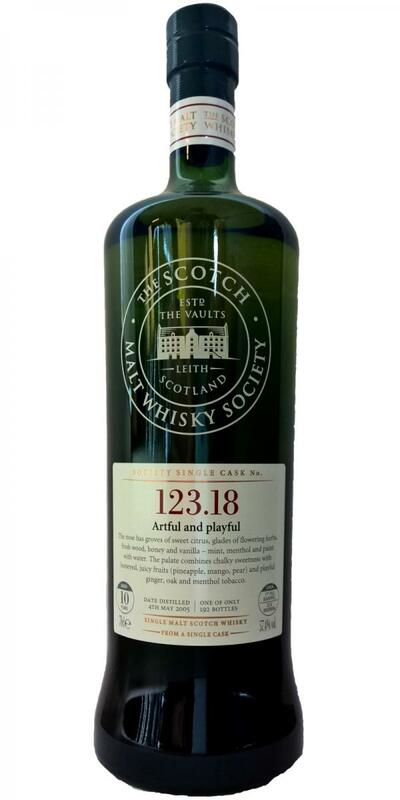 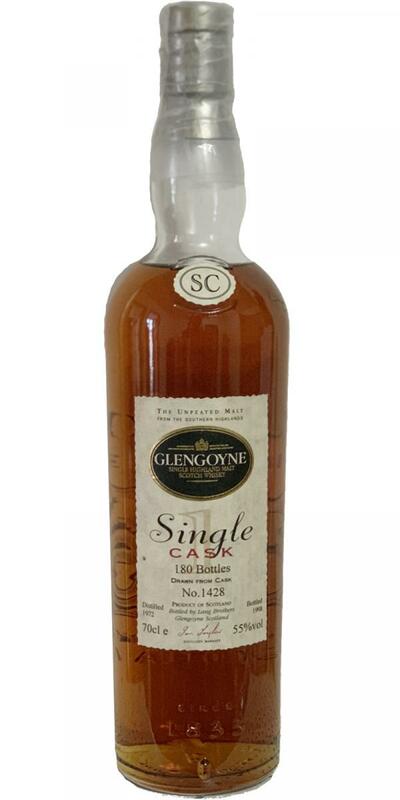 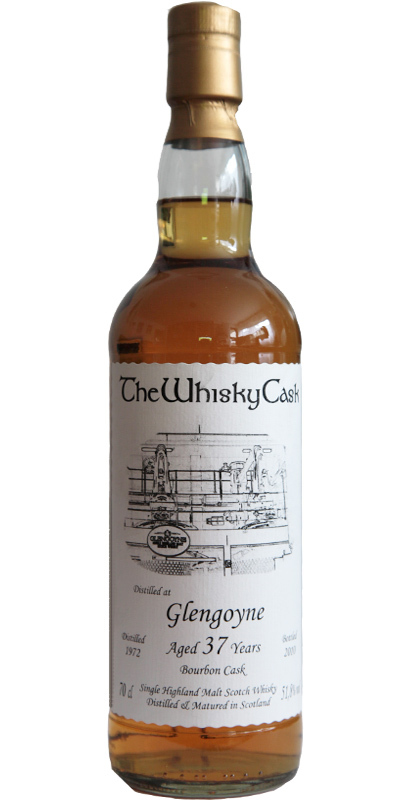 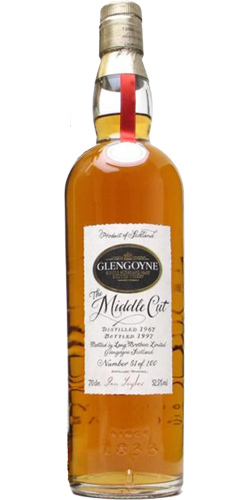 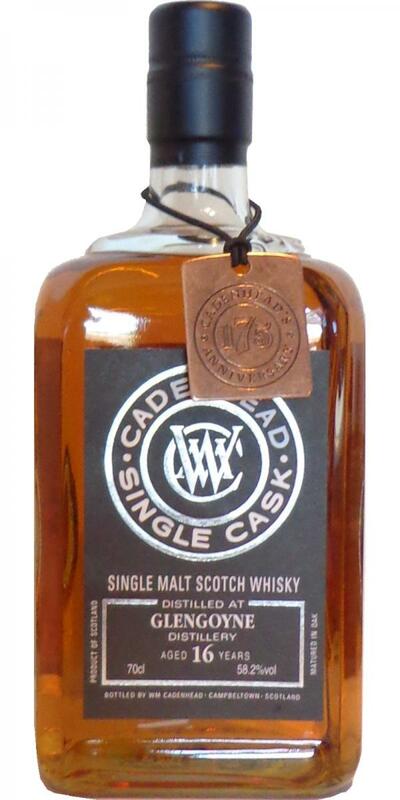 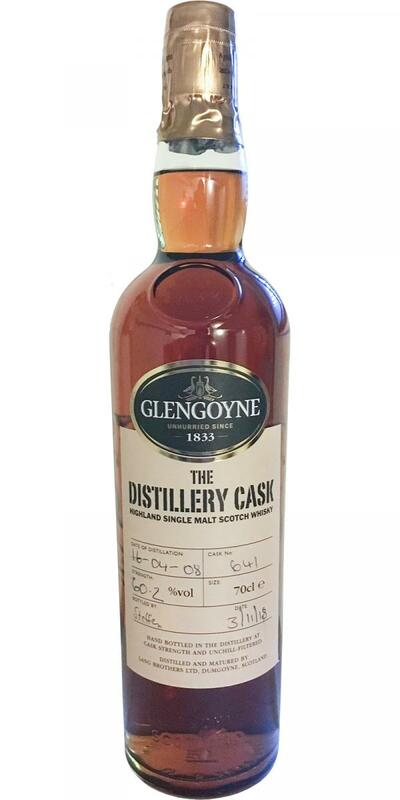 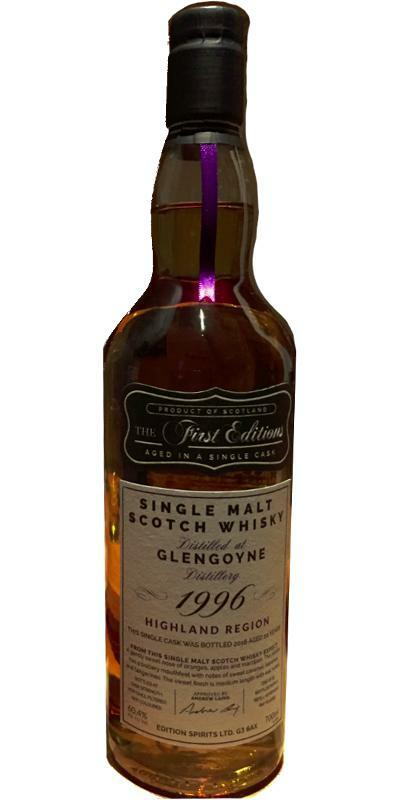 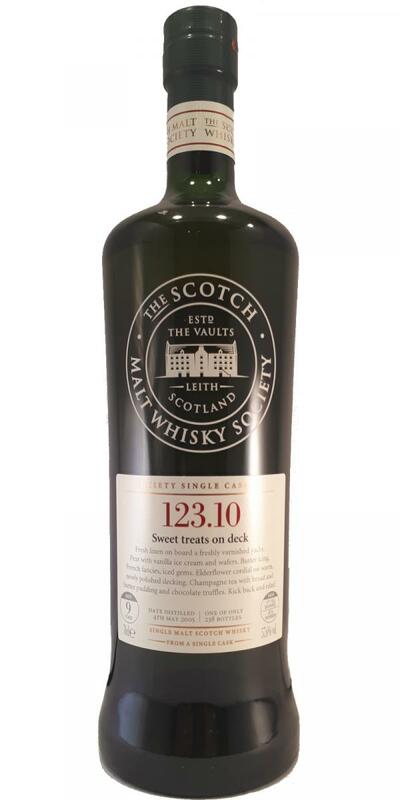 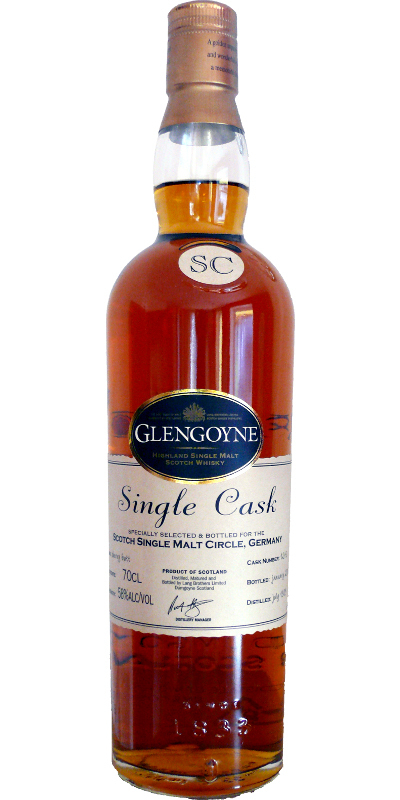 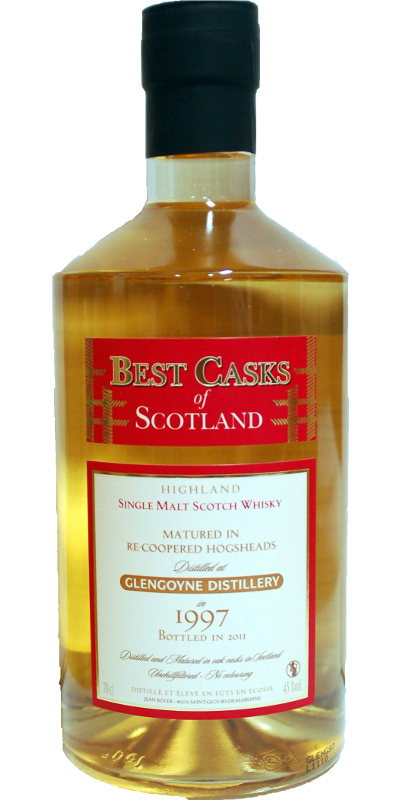 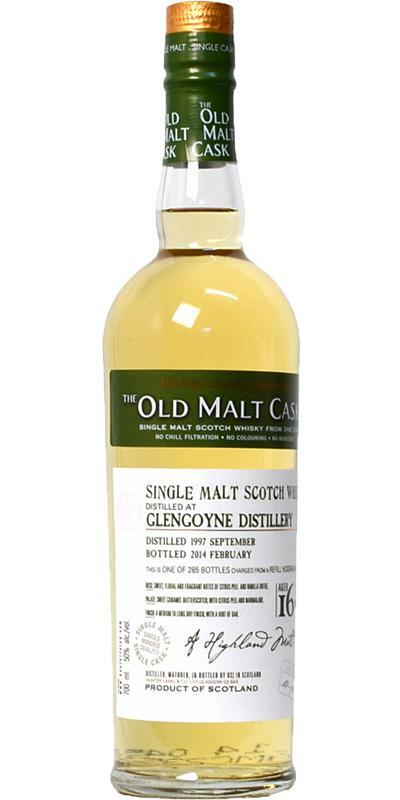 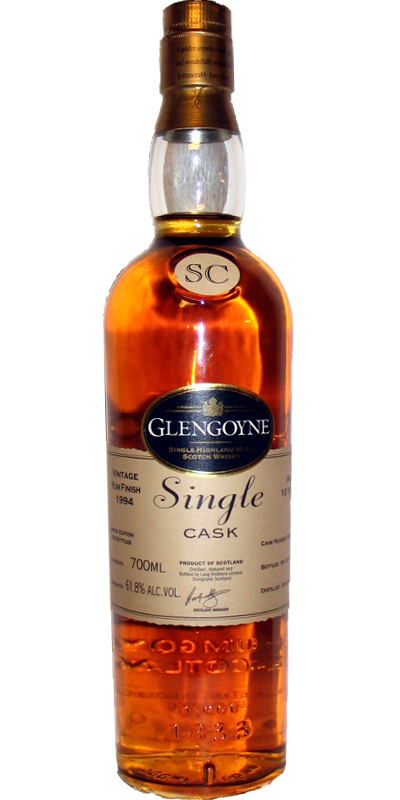 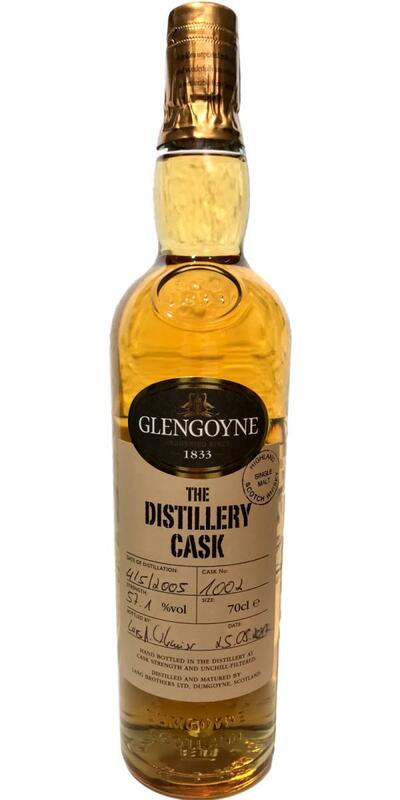 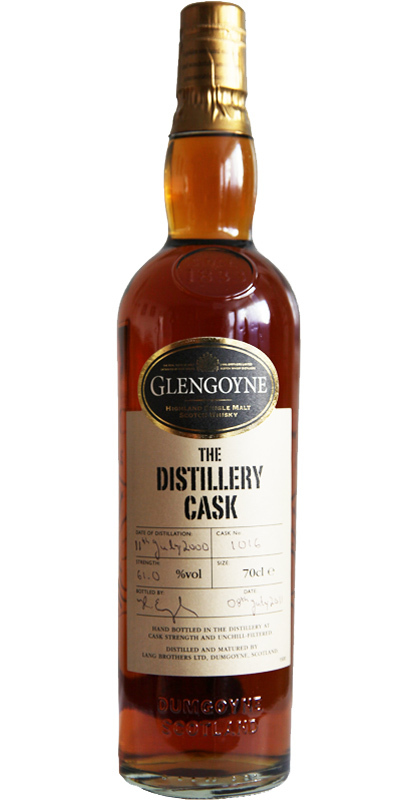 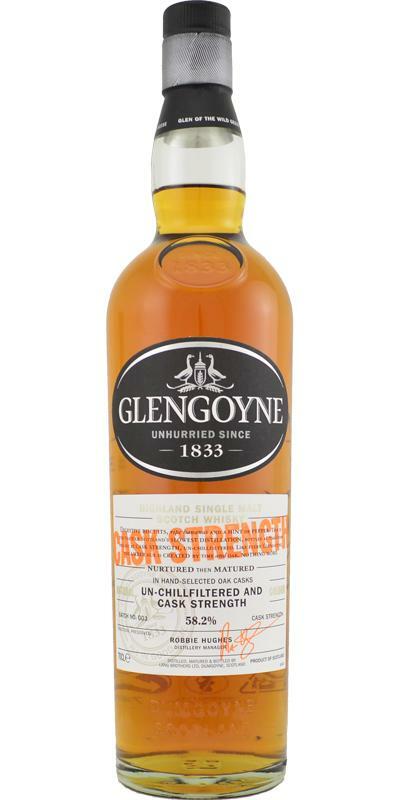 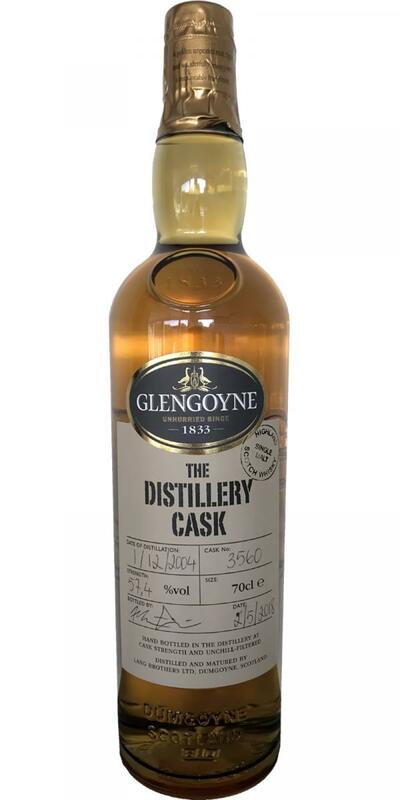 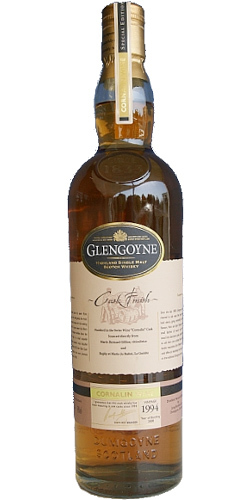 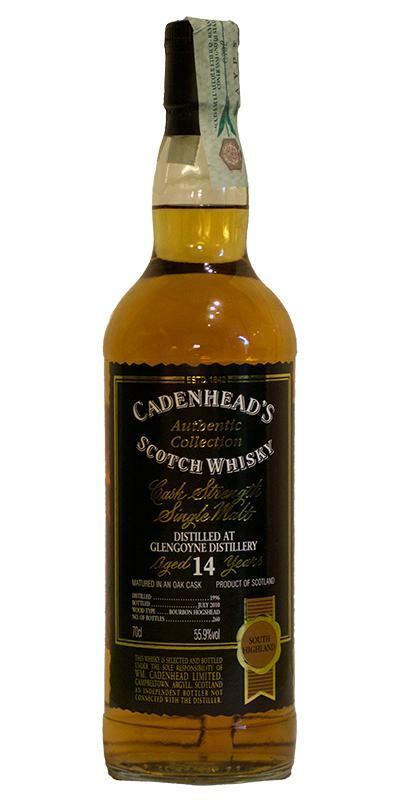 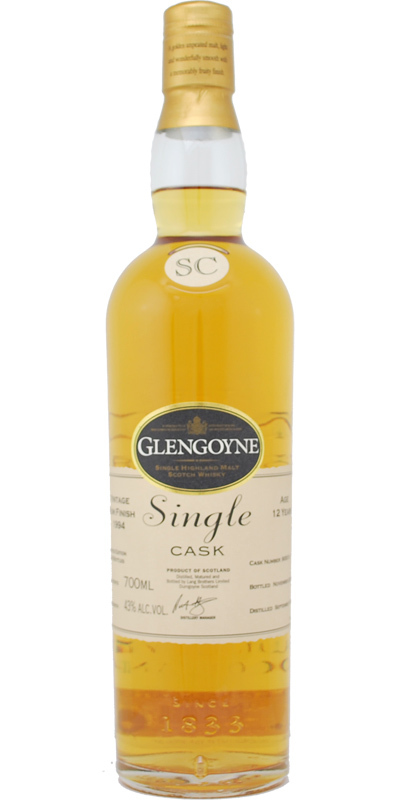 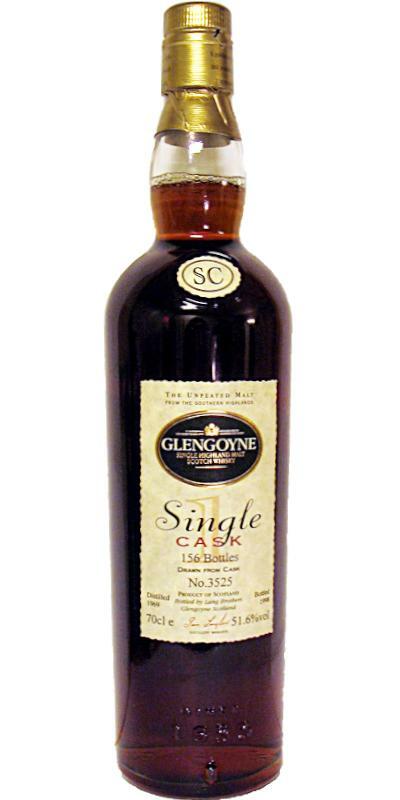 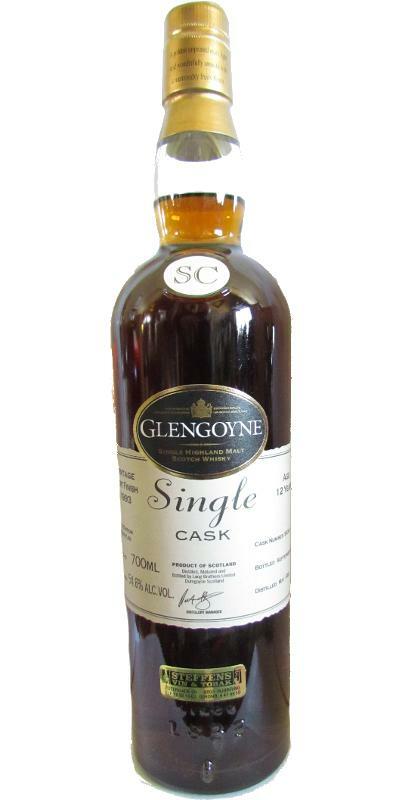 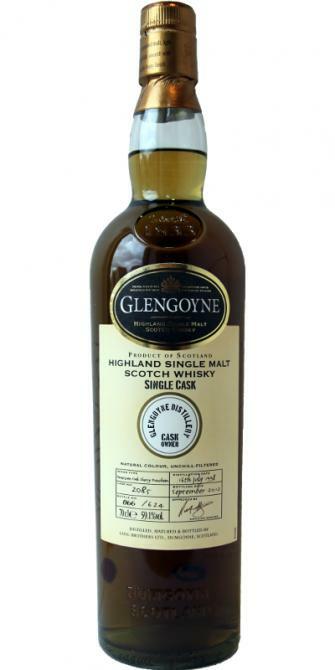 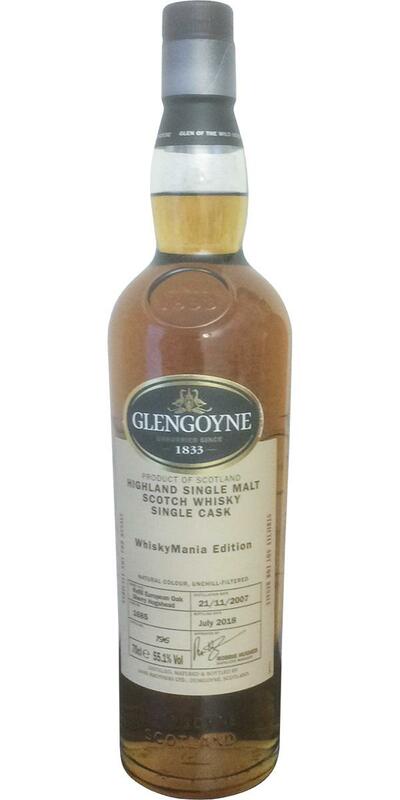 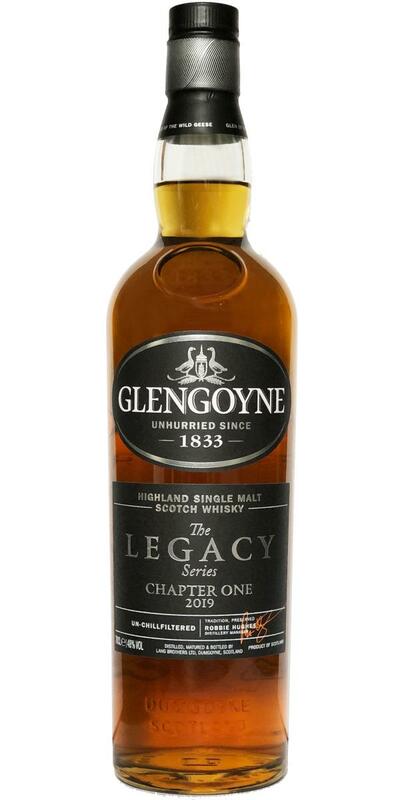 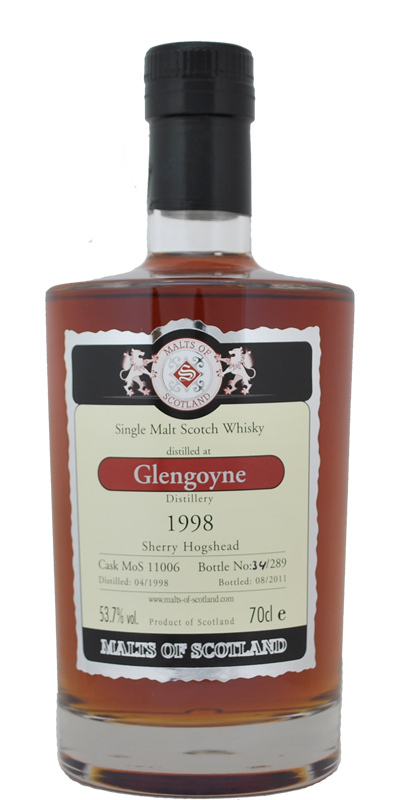 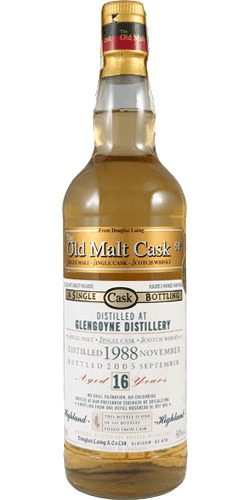 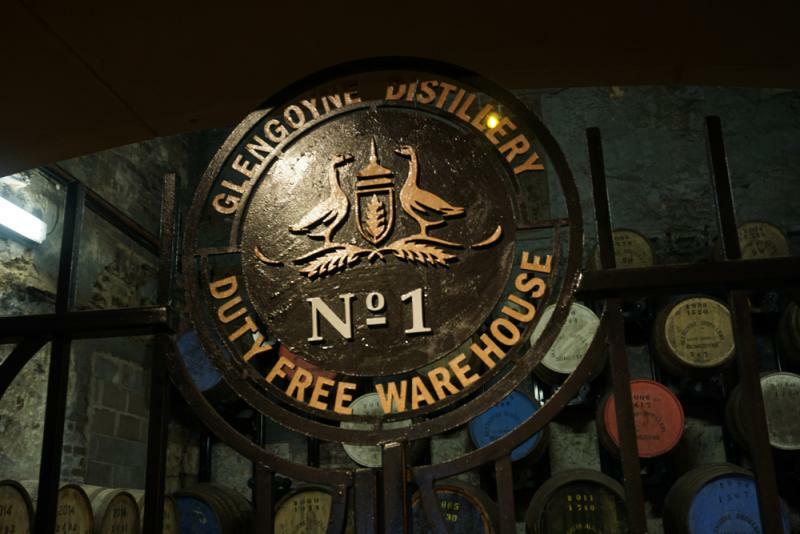 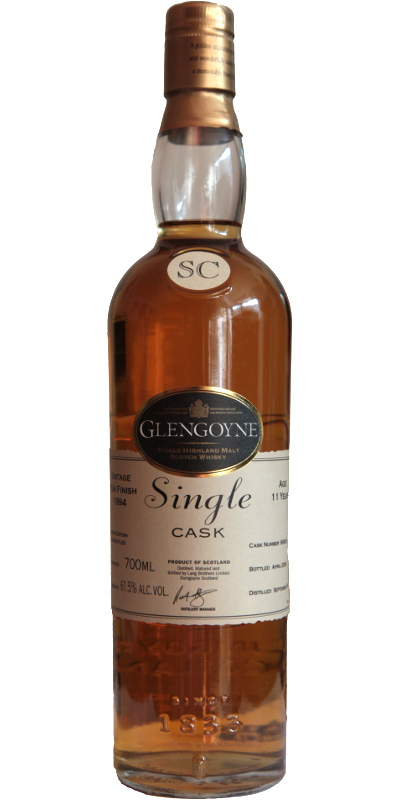 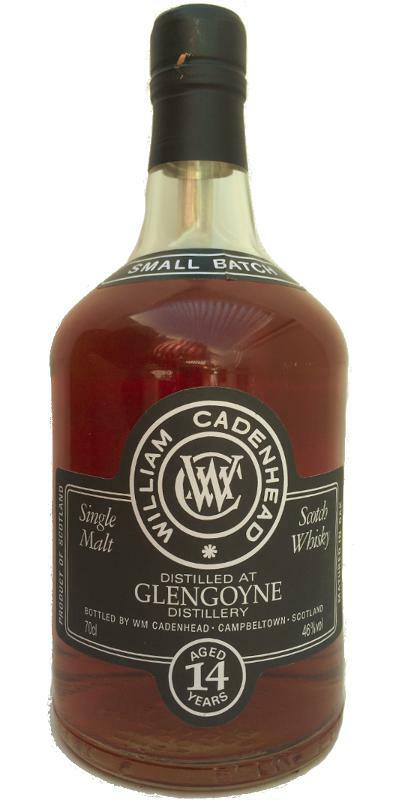 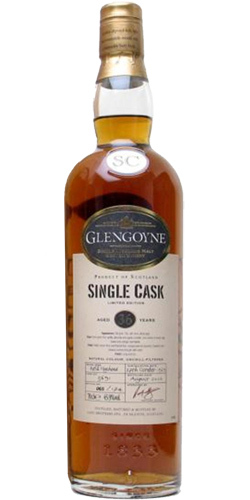 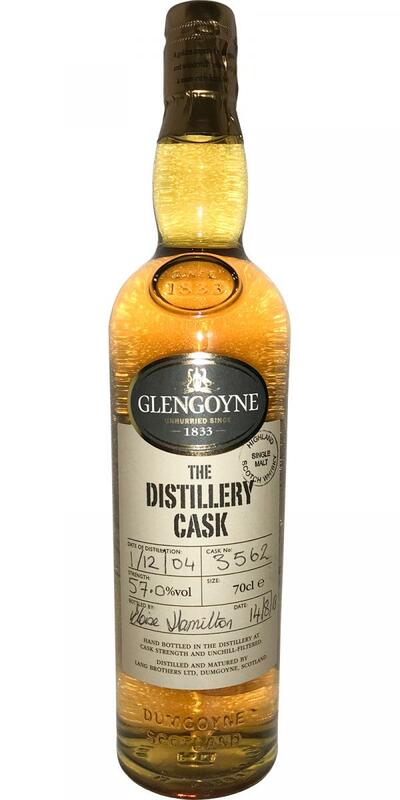 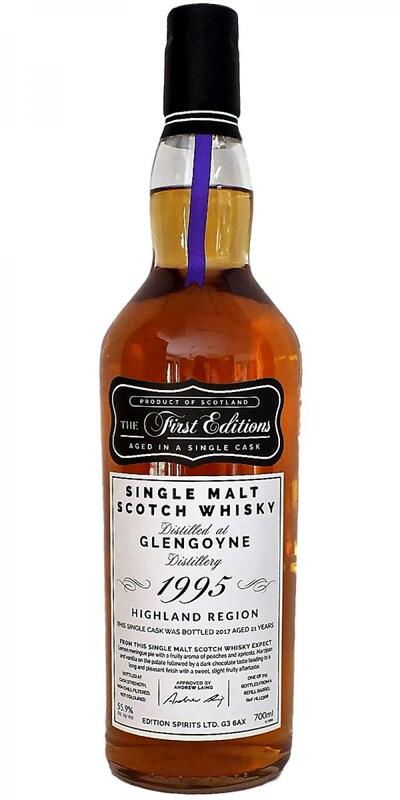 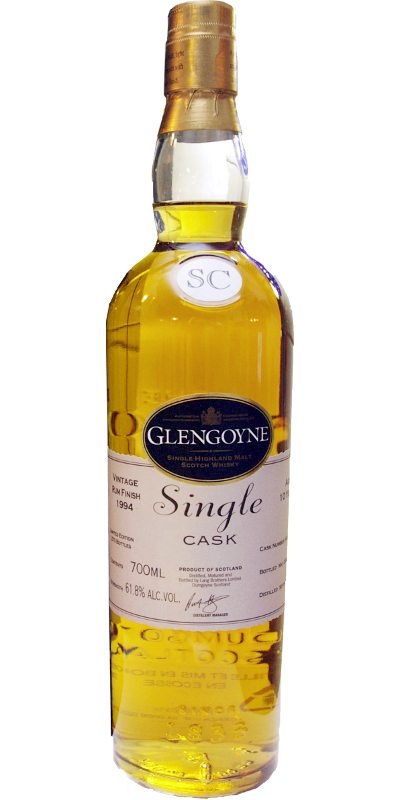 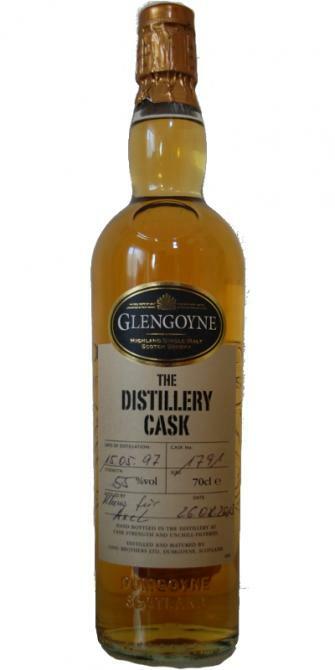 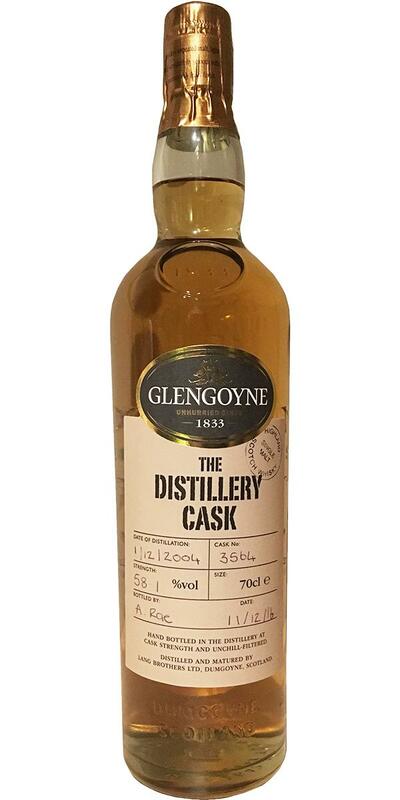 Glengoyne 1997 CA Cask Ends 15 46.0 % Vol. 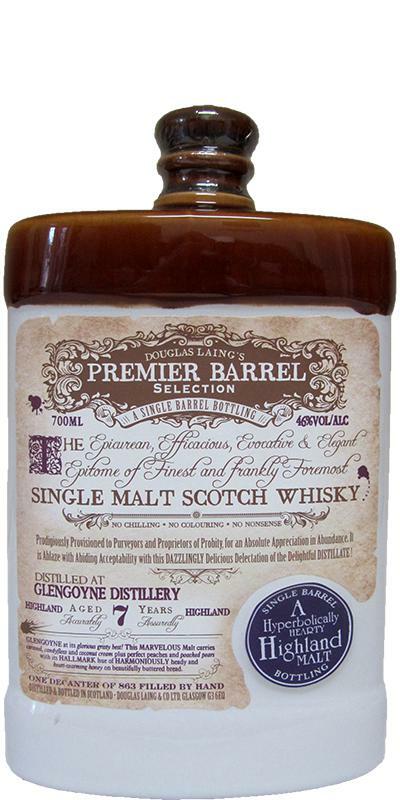 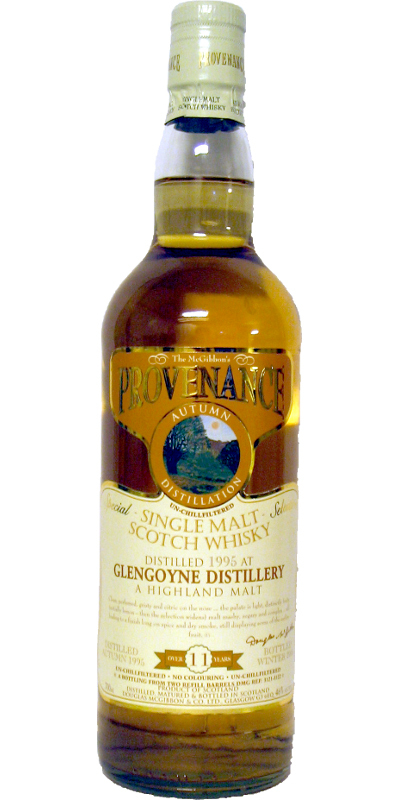 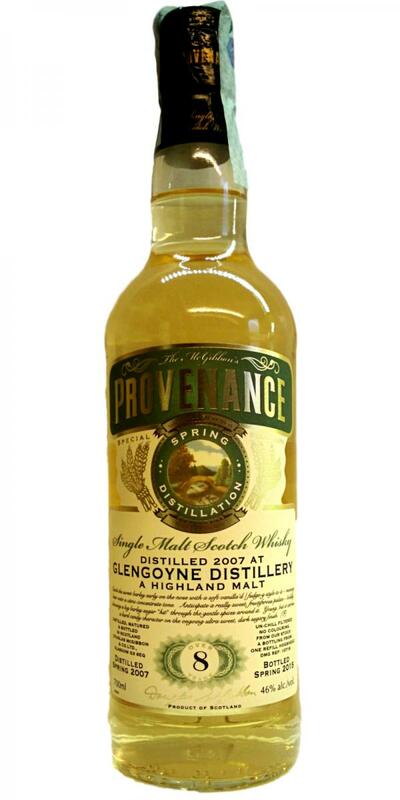 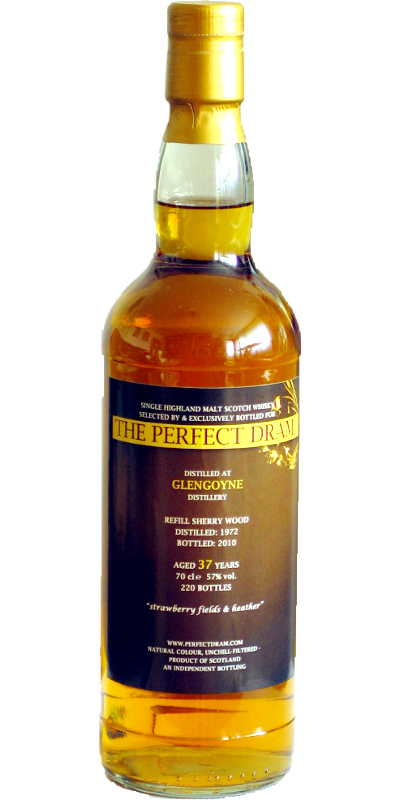 Glengoyne 07-year-old DL Premier Barrel Selection 07 46.0 % Vol. 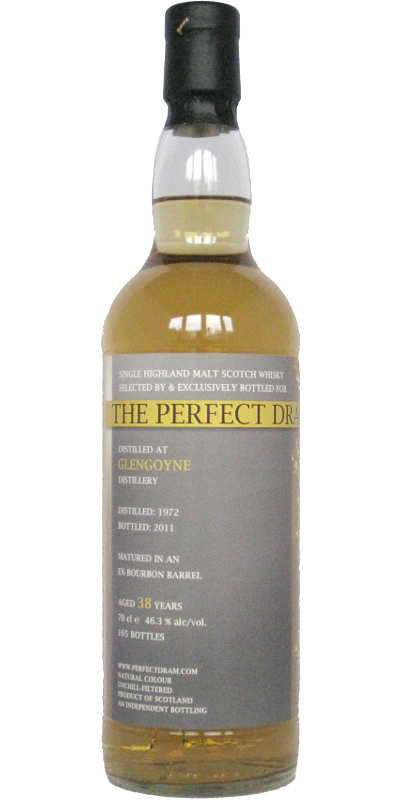 Glengoyne 10-year-old DL Premier Barrel Selection 10 46.0 % Vol. 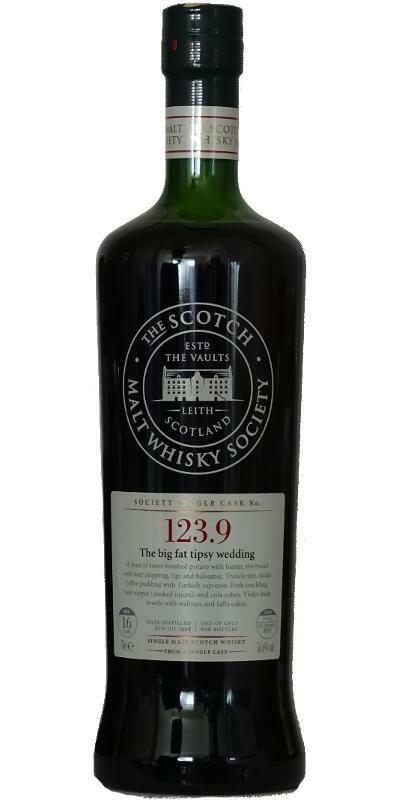 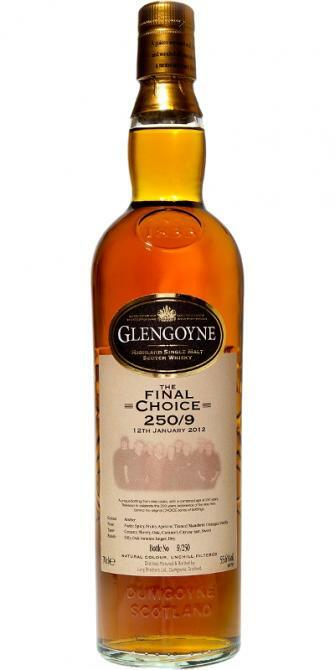 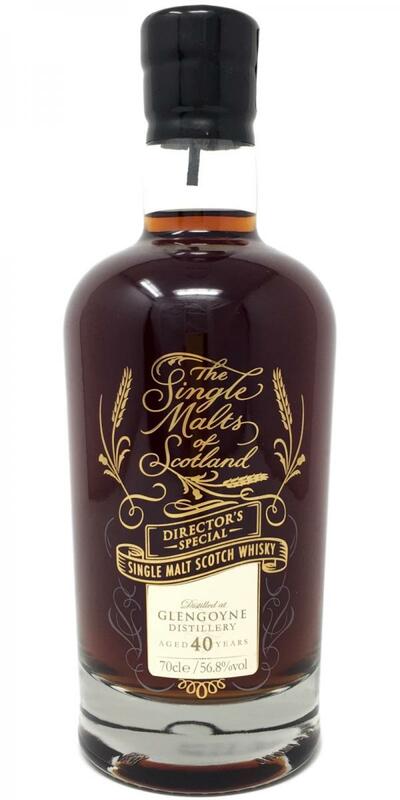 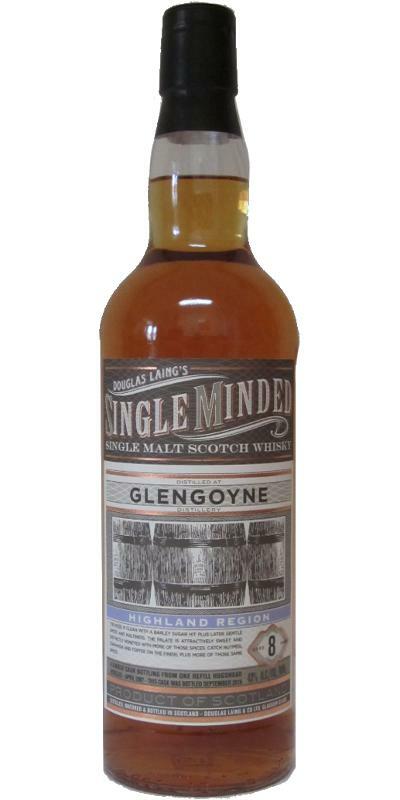 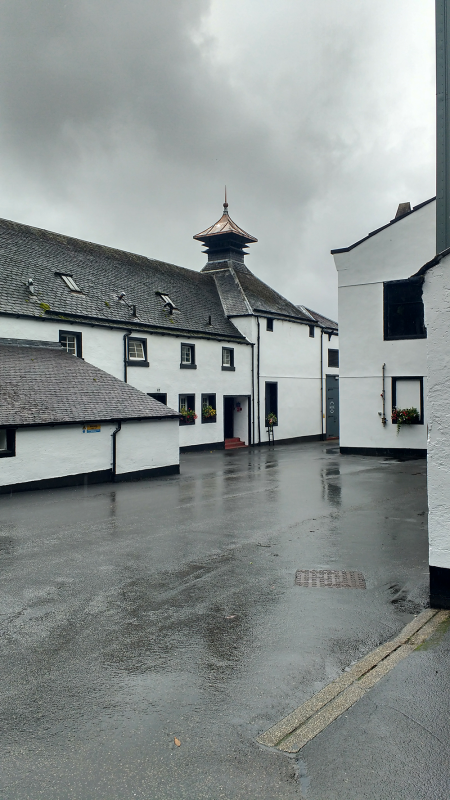 Glengoyne 25-year-old JM Fine Malt Selection - Miniature 25 50.3 % Vol. 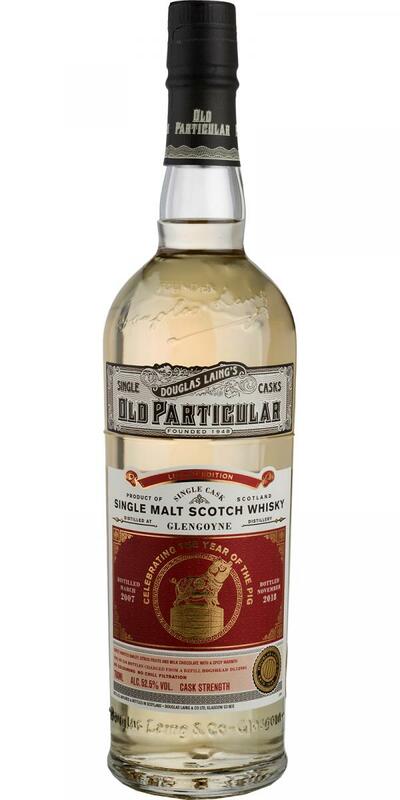 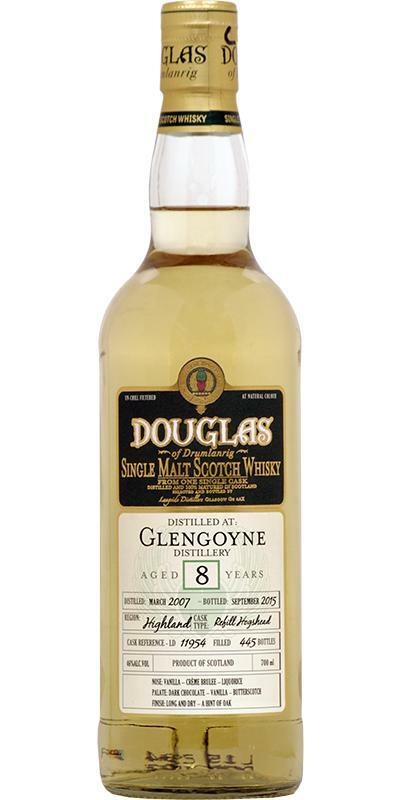 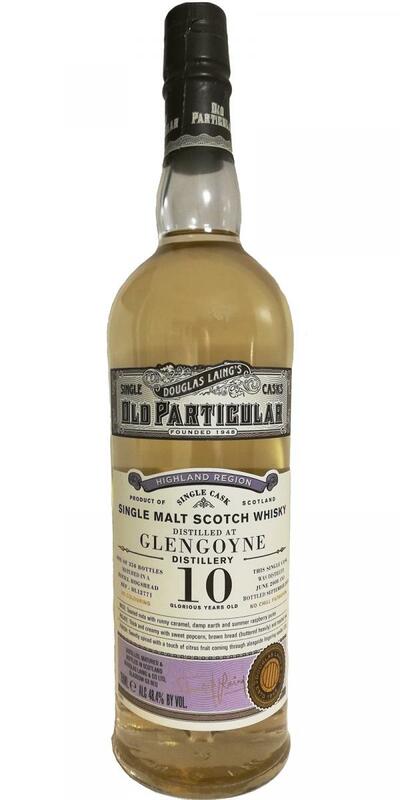 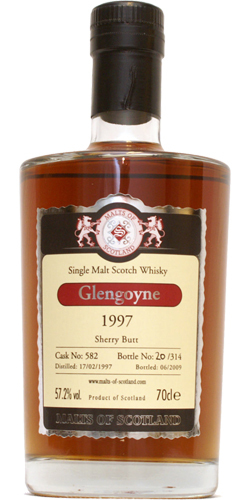 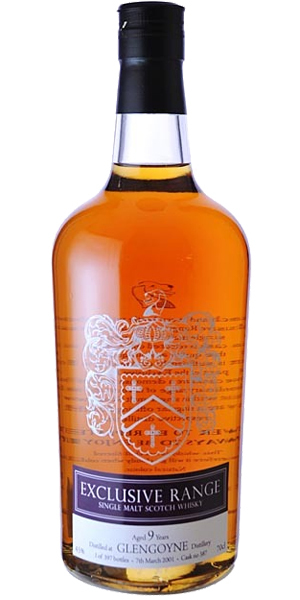 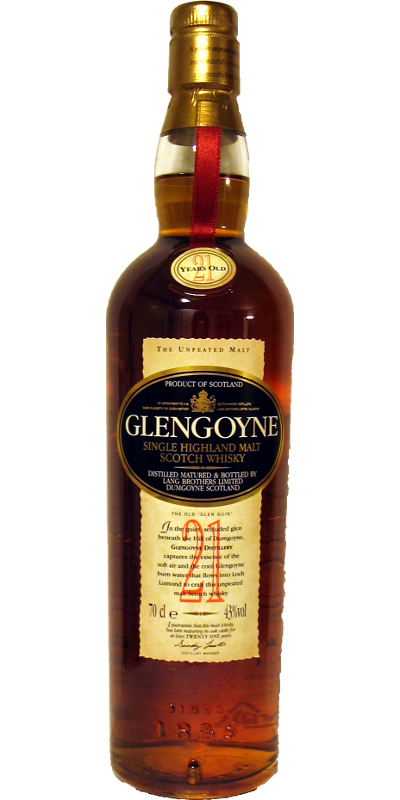 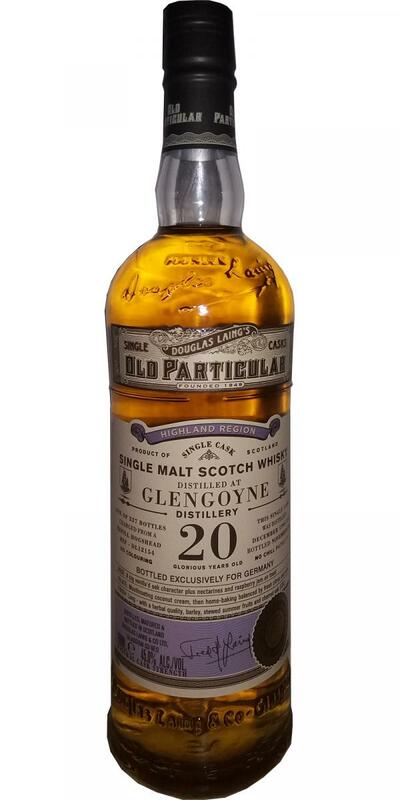 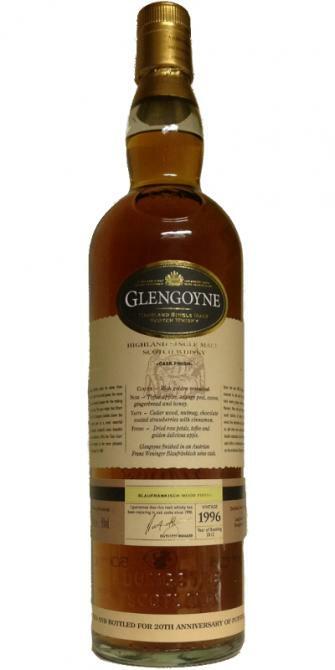 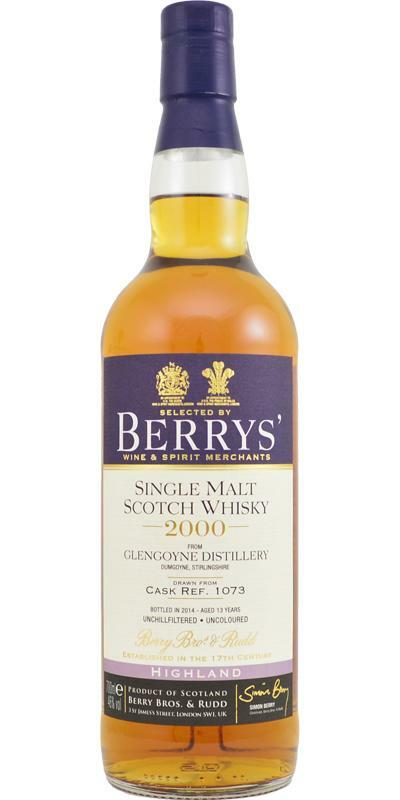 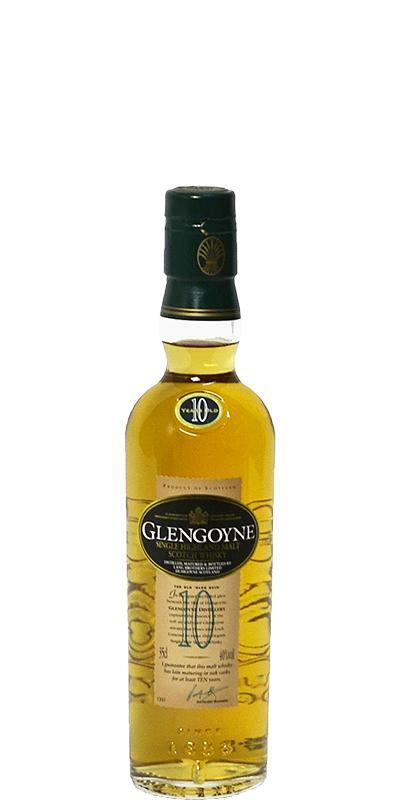 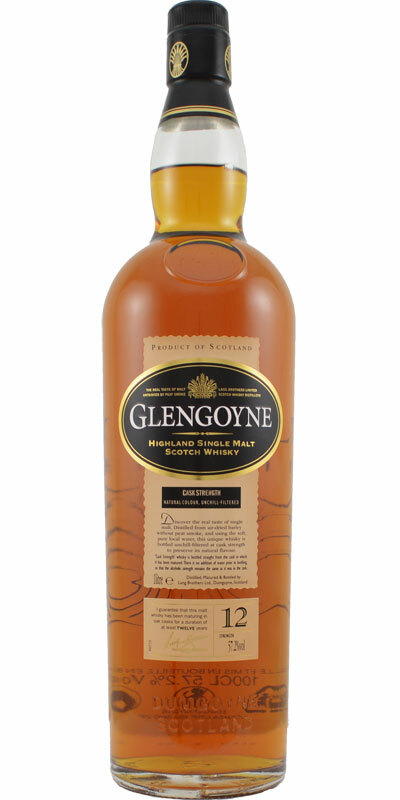 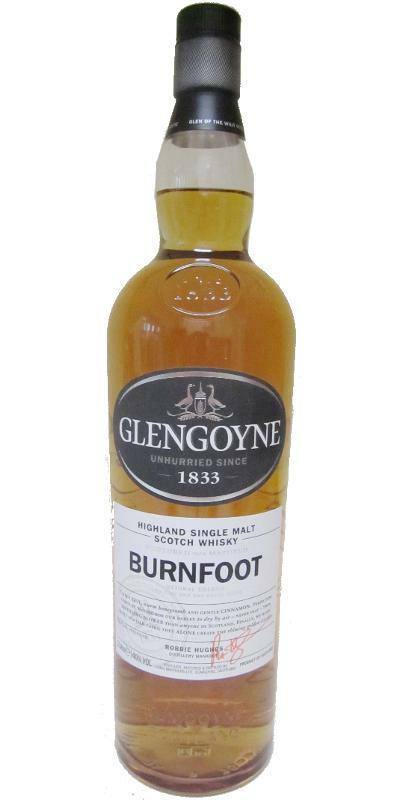 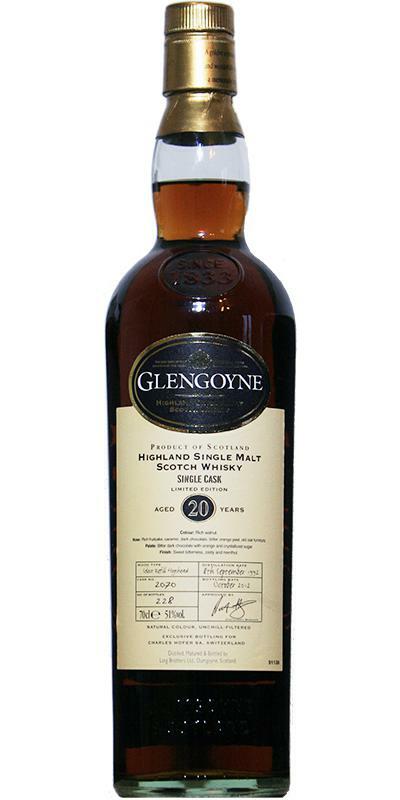 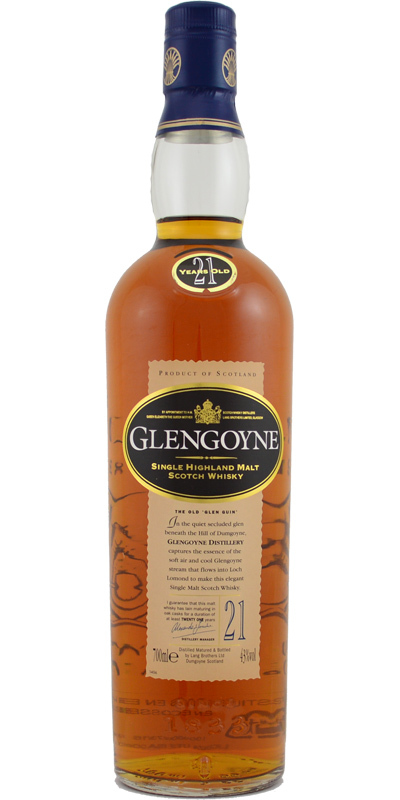 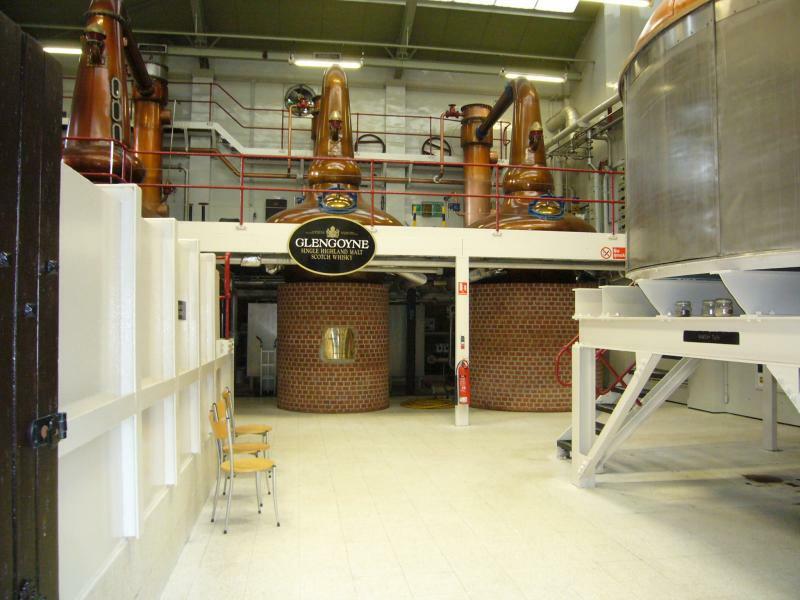 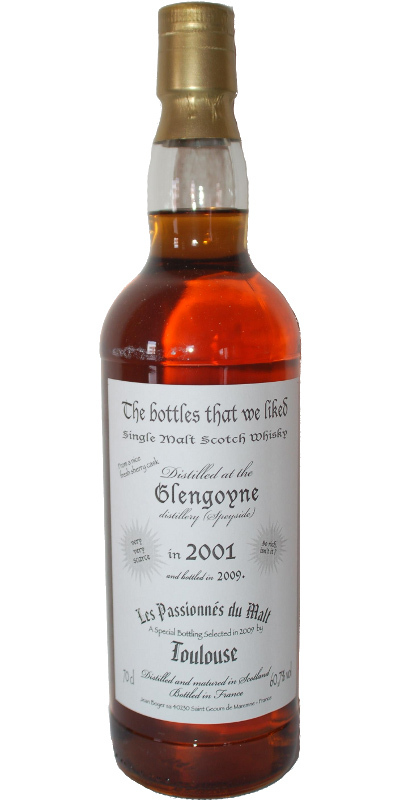 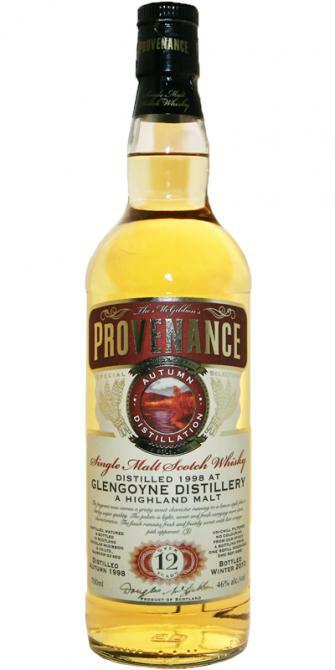 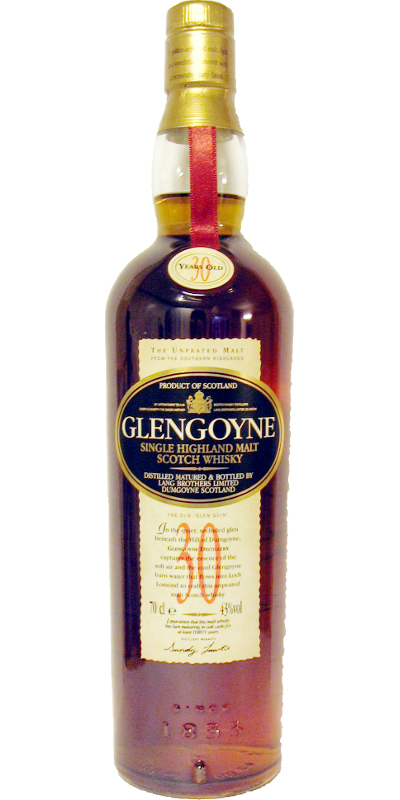 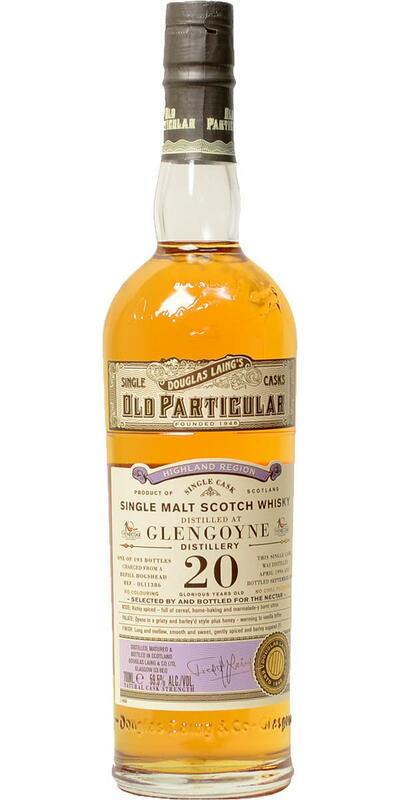 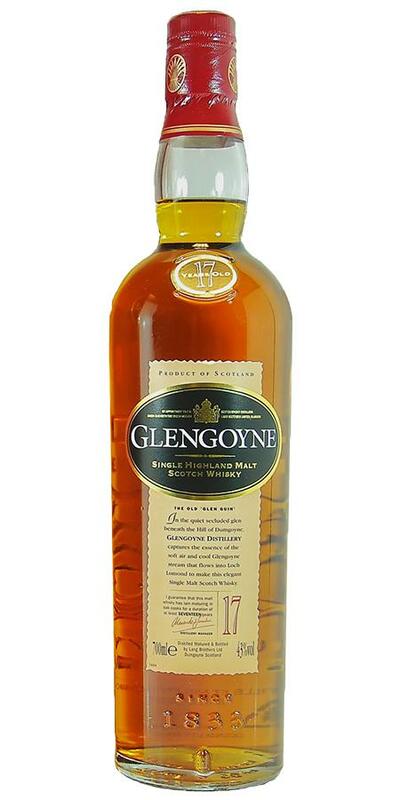 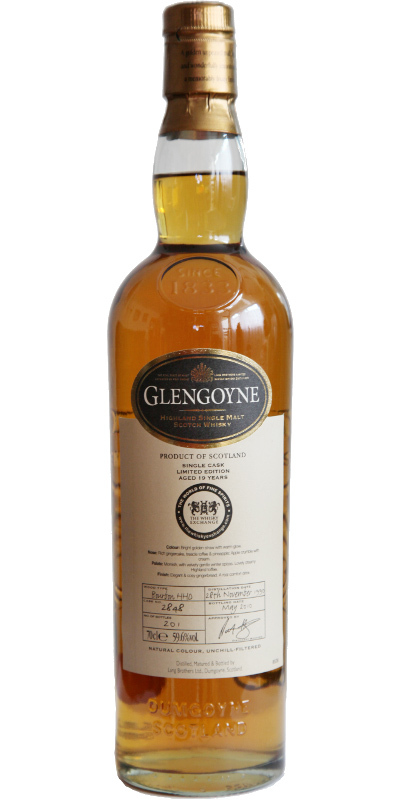 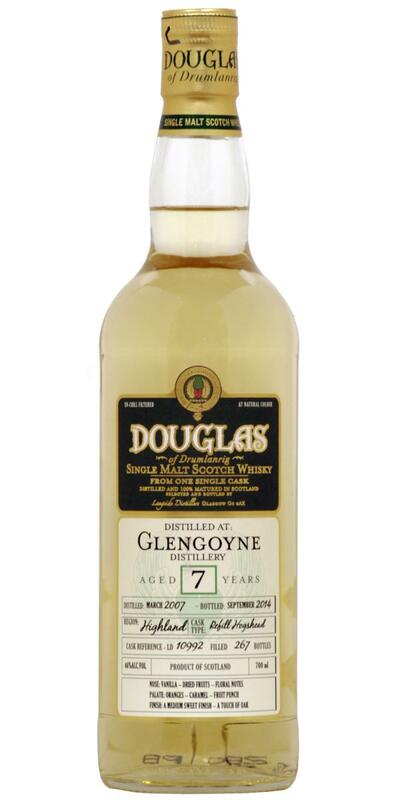 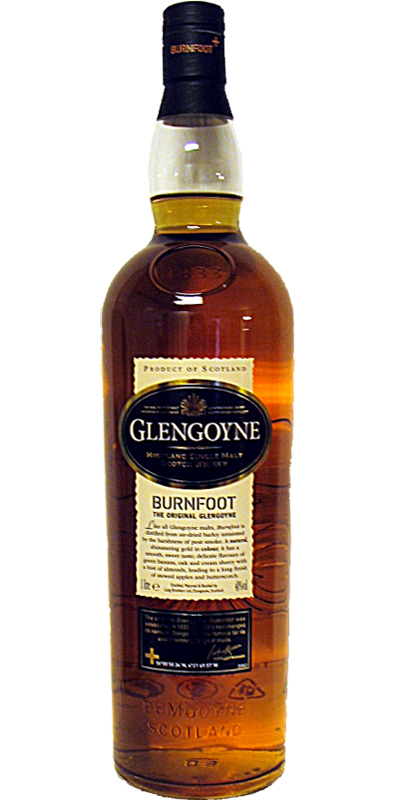 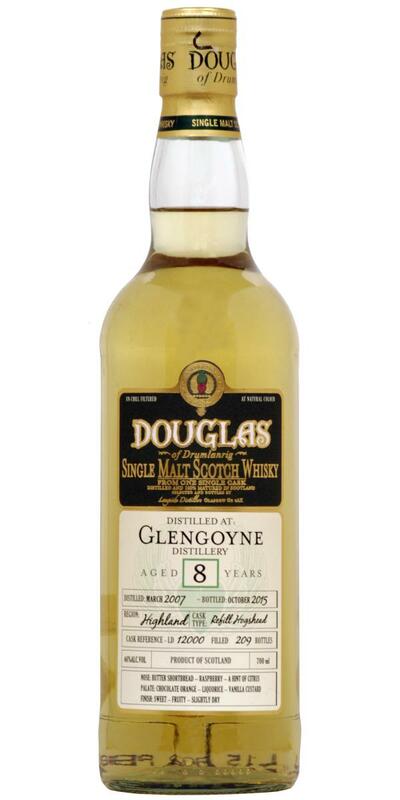 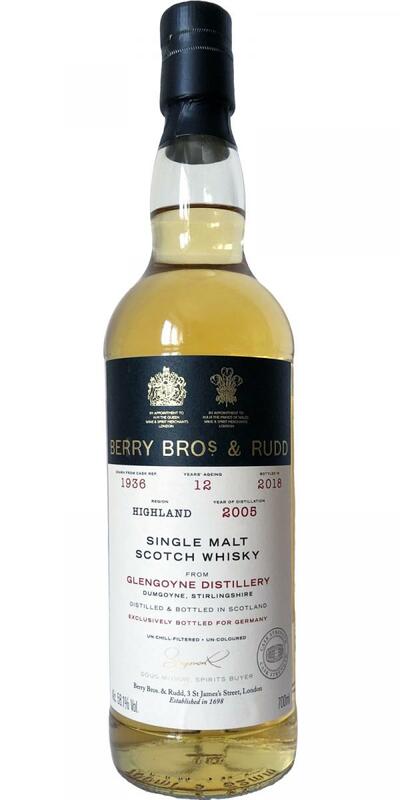 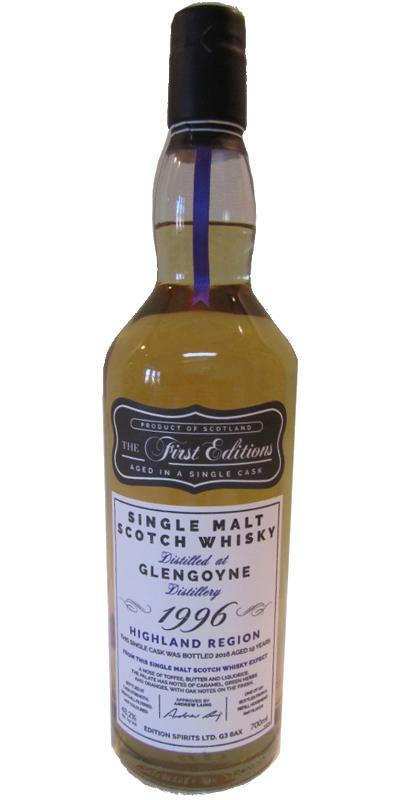 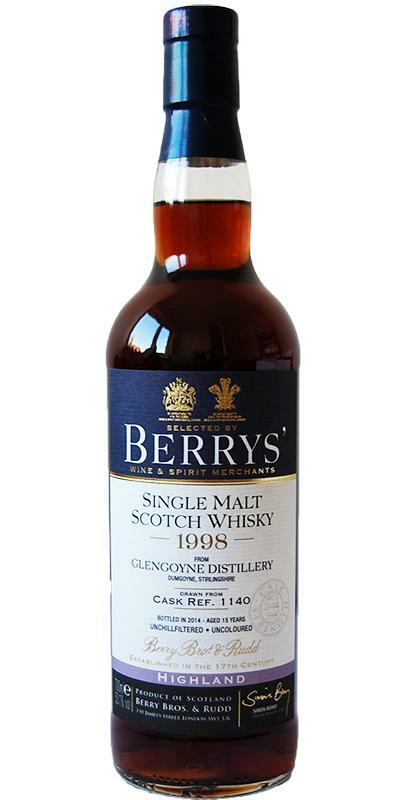 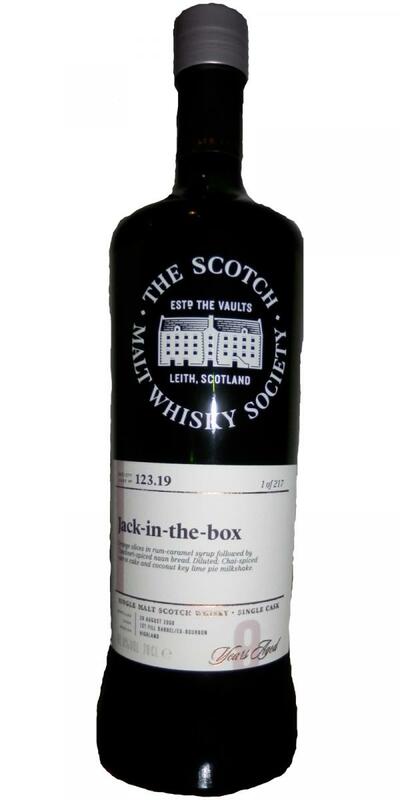 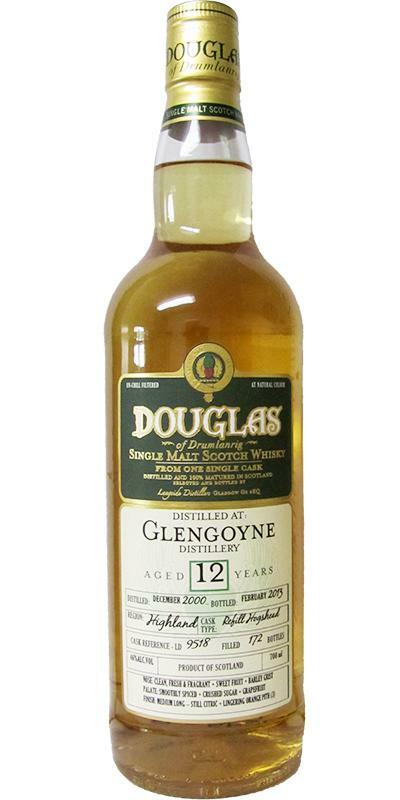 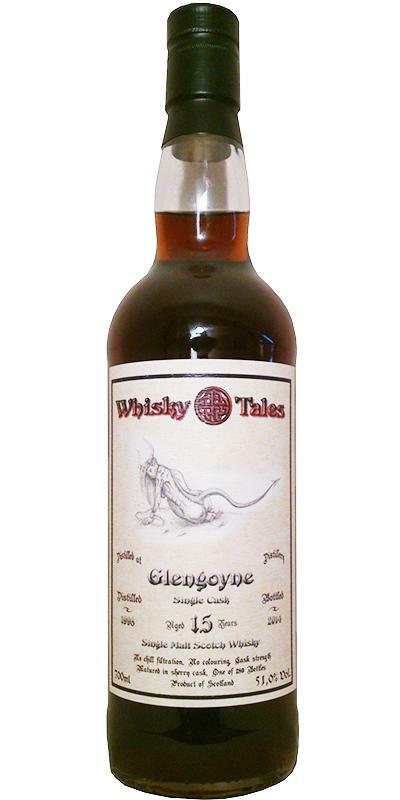 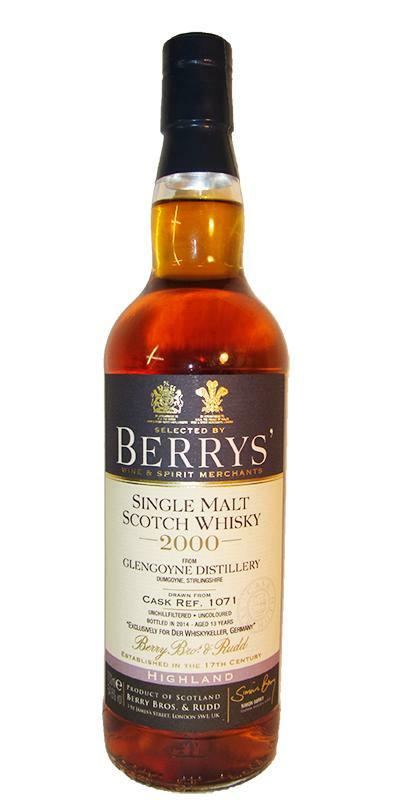 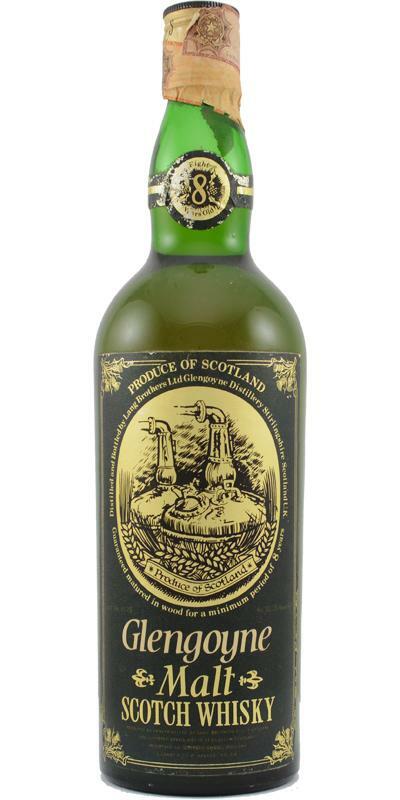 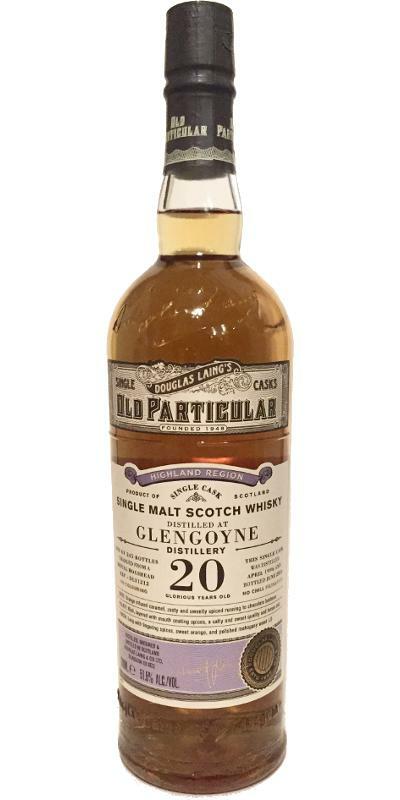 Glengoyne 2001 JB Le puits a whisky 08 43.0 % Vol. 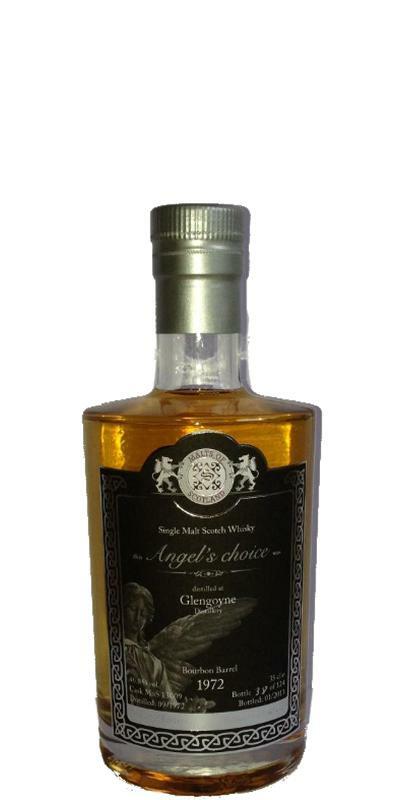 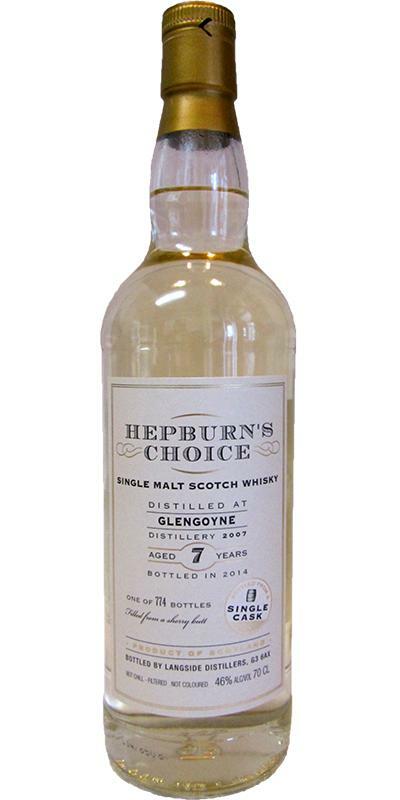 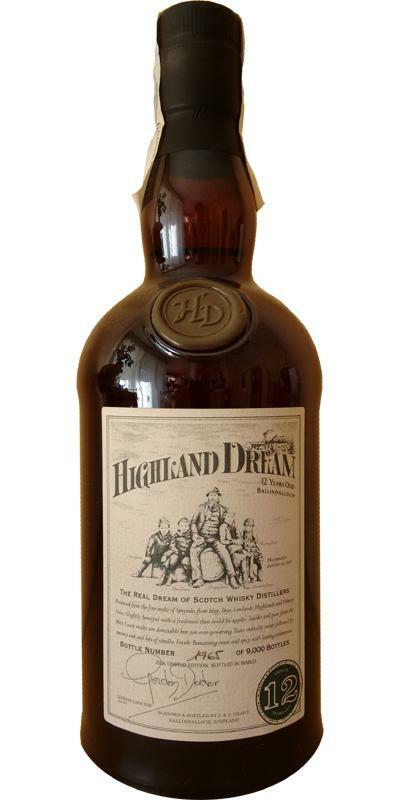 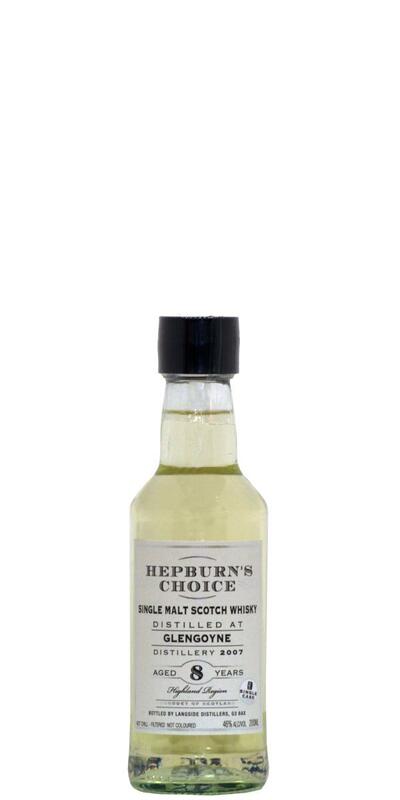 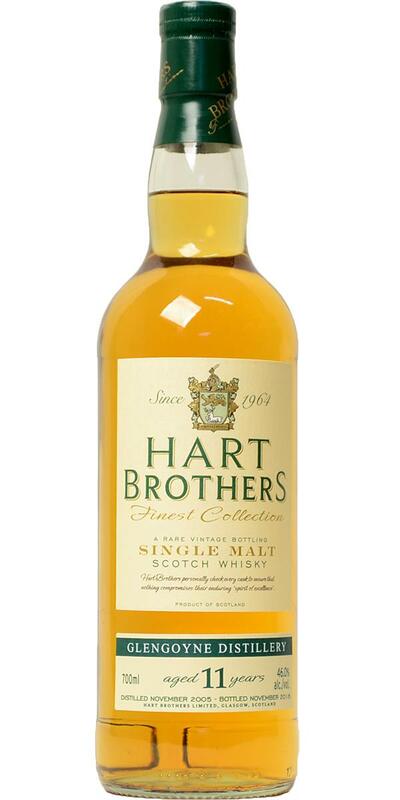 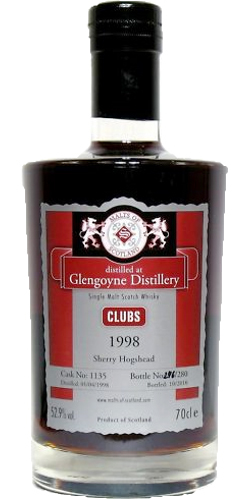 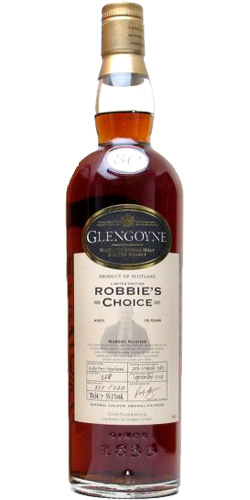 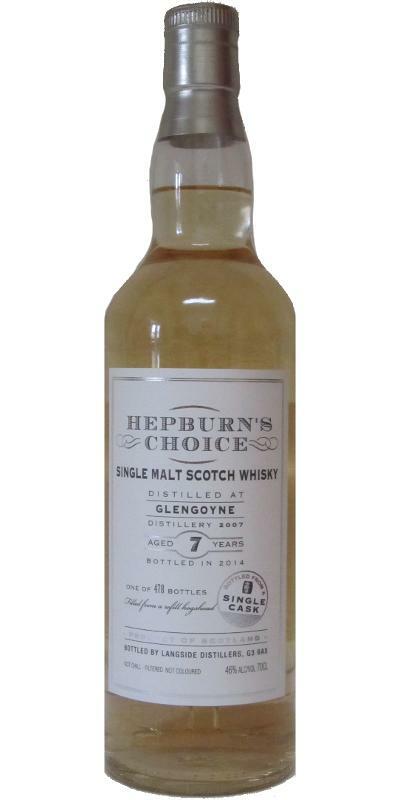 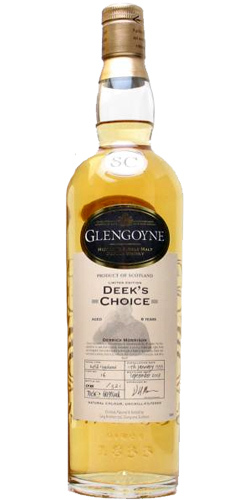 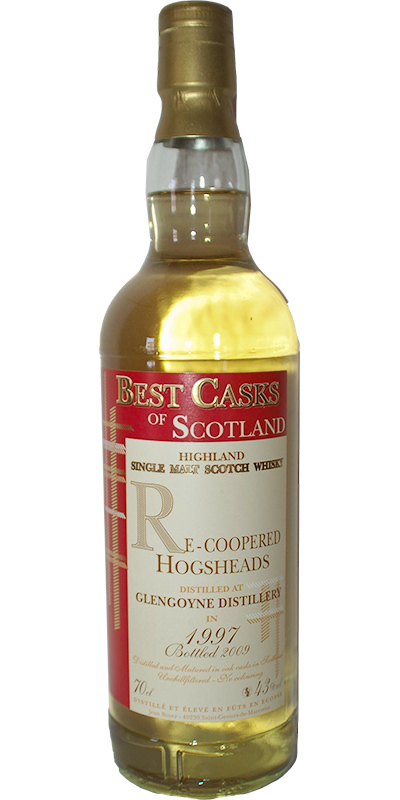 Glengoyne 2007 LsD Hepburn's Choice 07 46.0 % Vol. 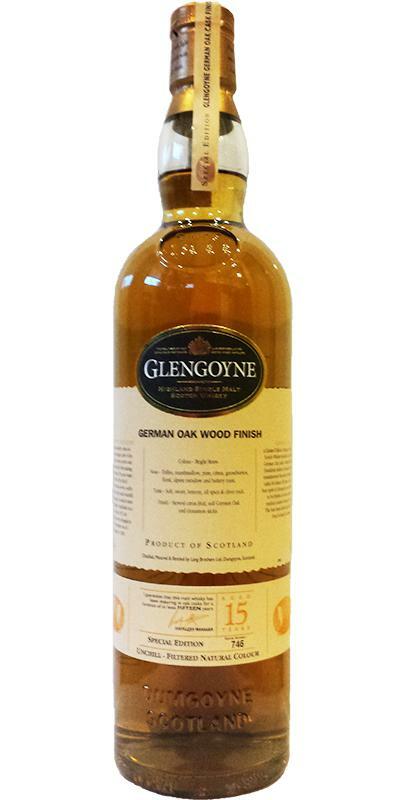 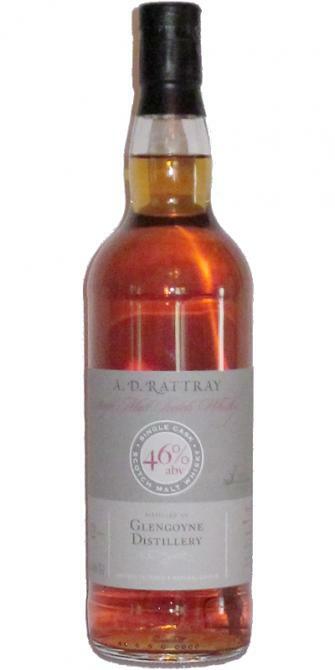 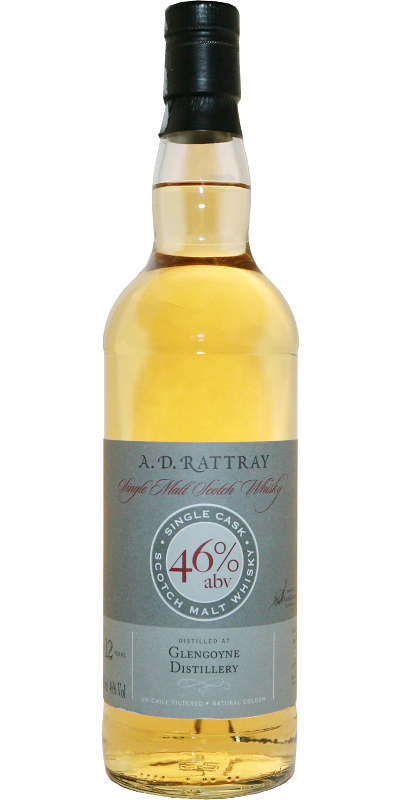 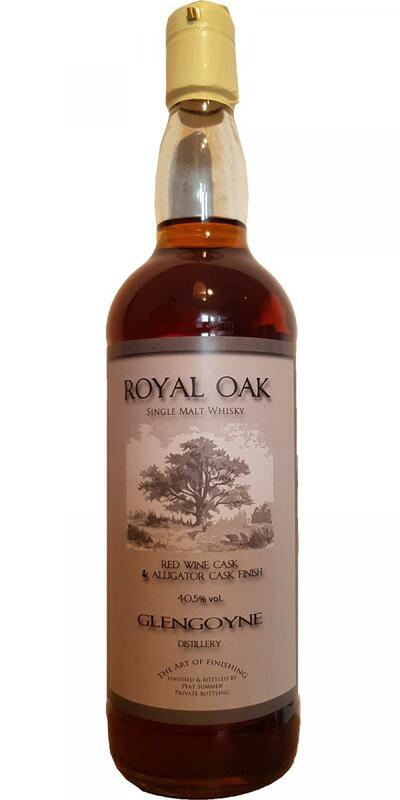 Glengoyne Royal Oak PeSu The Art Of Finishing 40.5 % Vol. 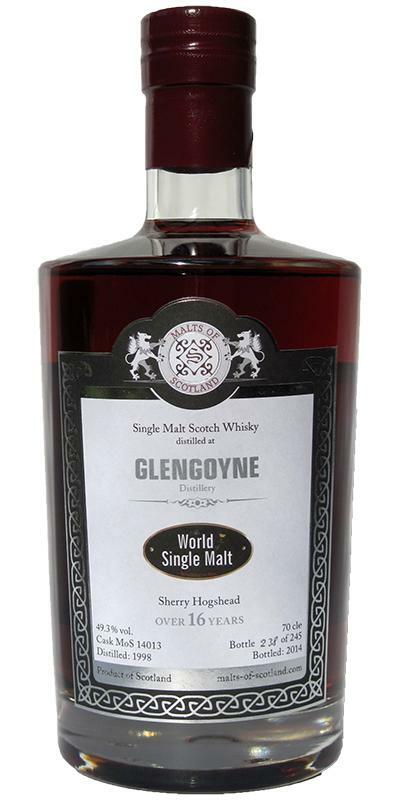 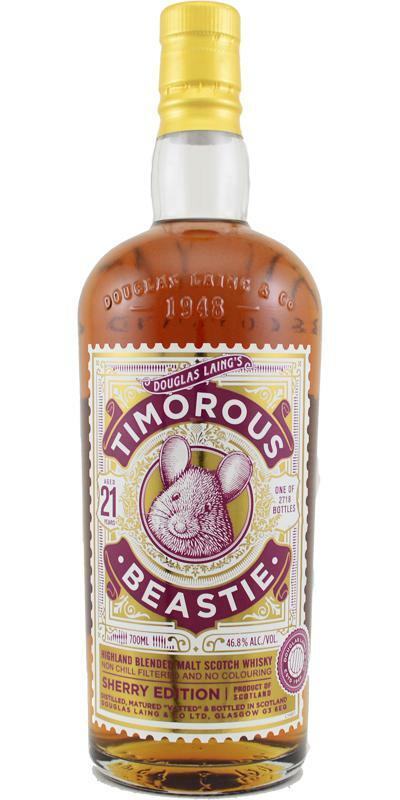 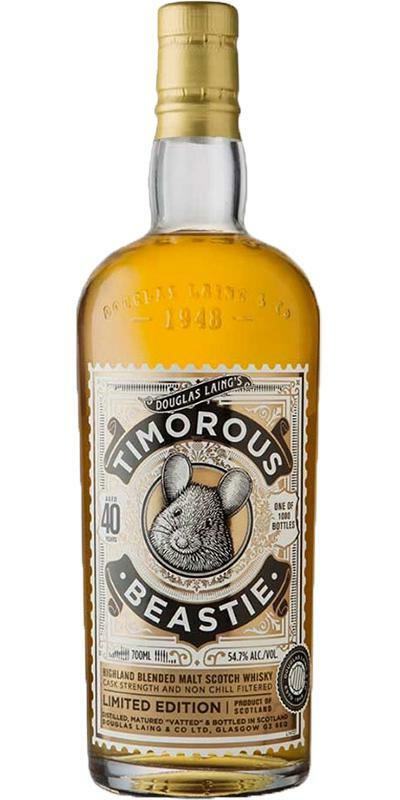 Glengoyne Batch 1 TBWC 17 49.1 % Vol. 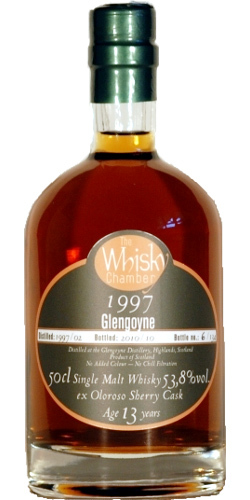 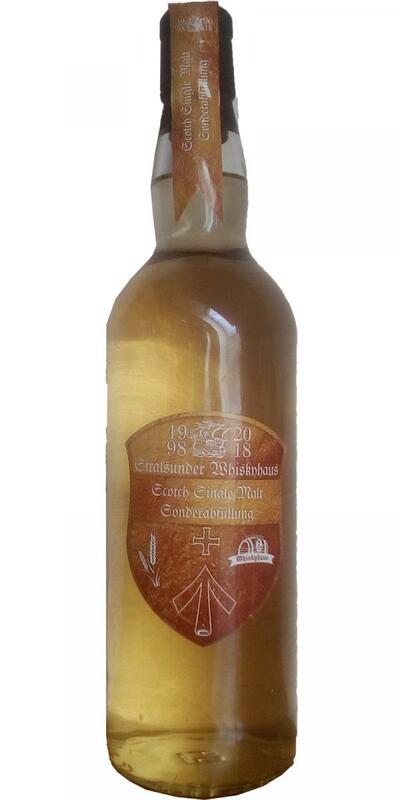 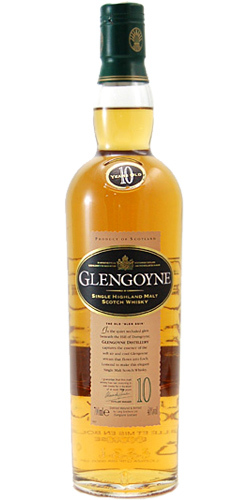 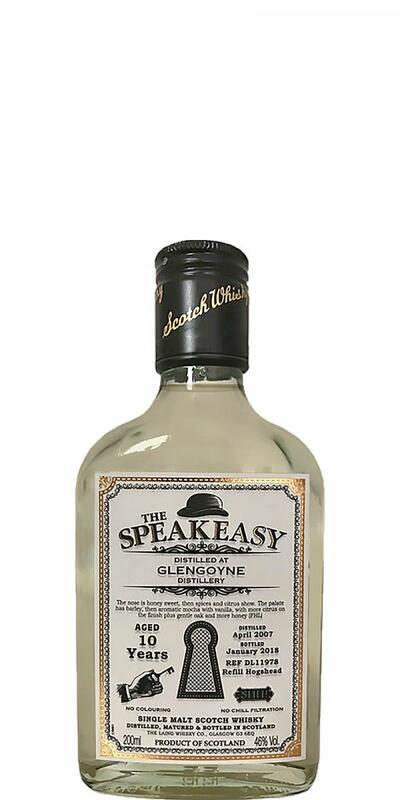 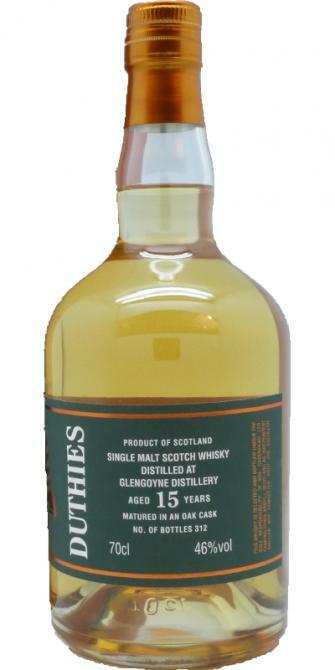 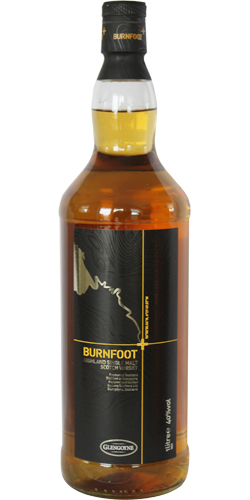 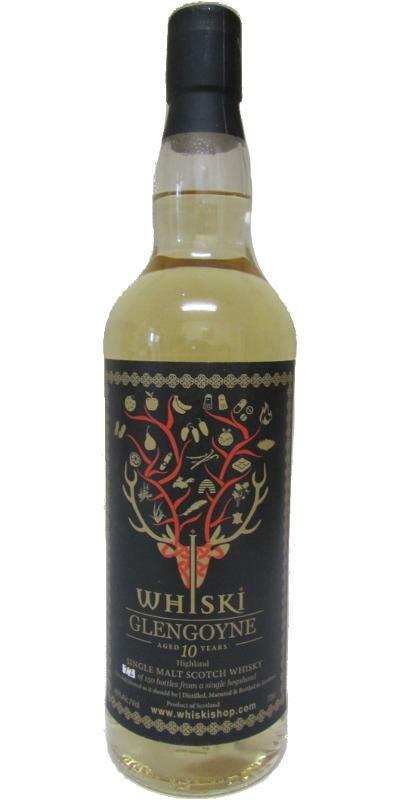 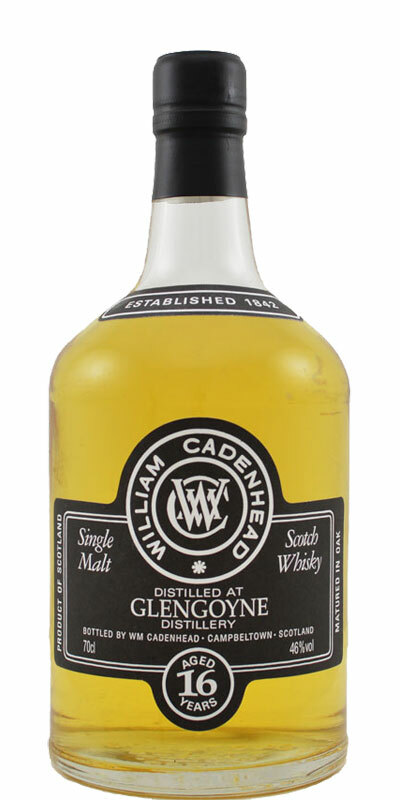 Glengoyne 10-year-old Whi WHISKI (Bar and Restaurant, Edinburgh) 10 46.0 % Vol. 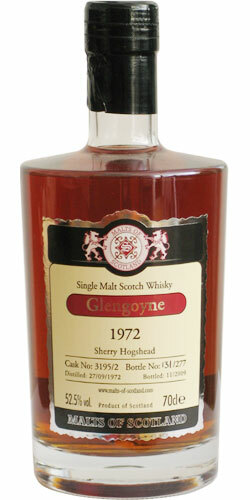 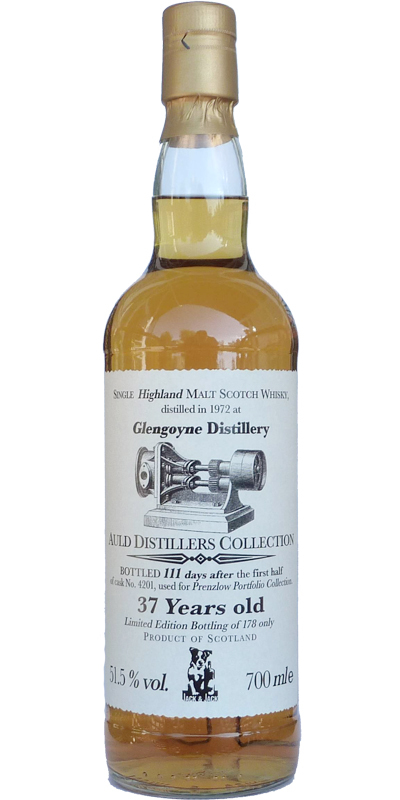 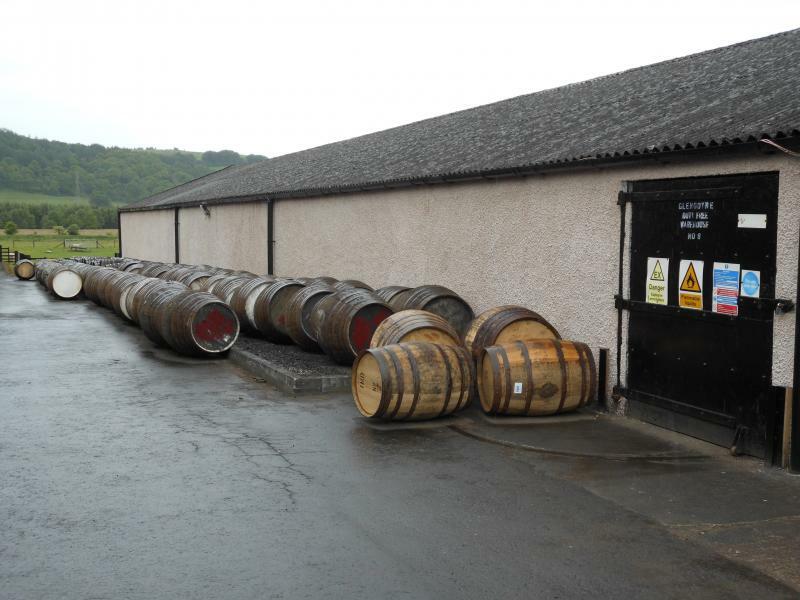 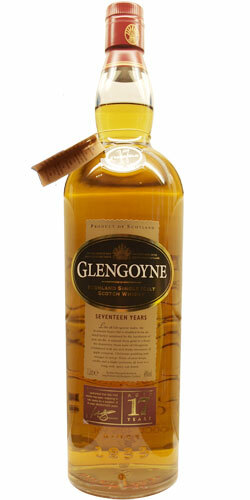 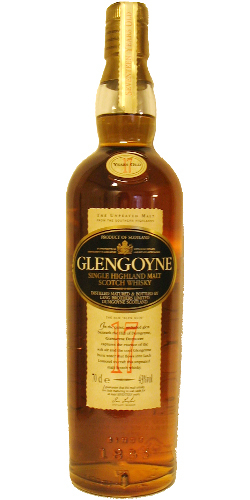 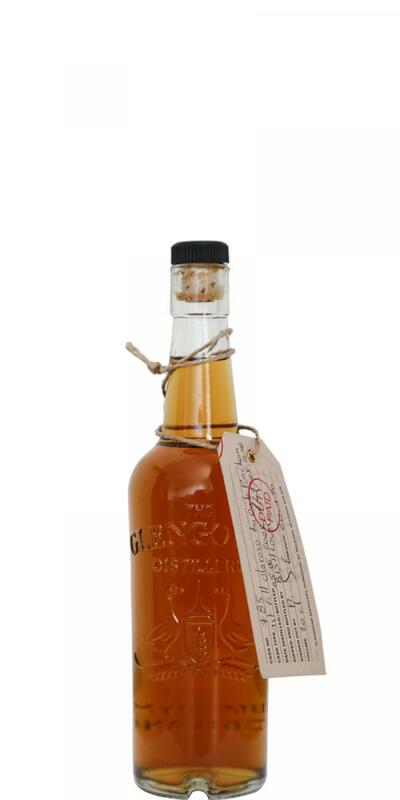 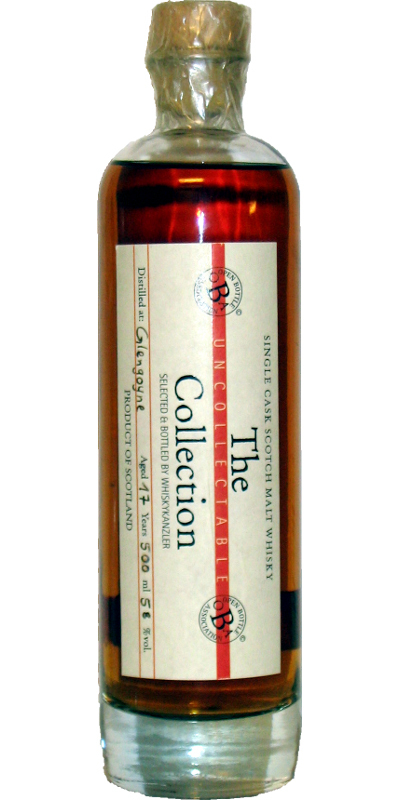 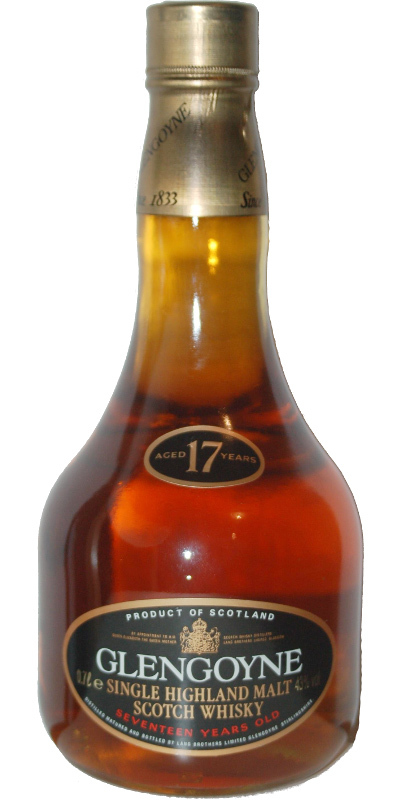 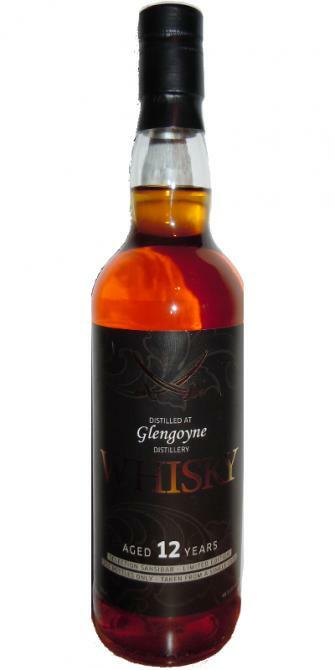 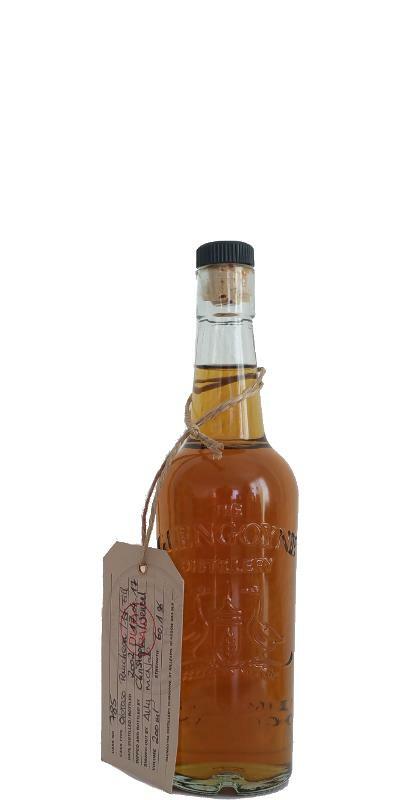 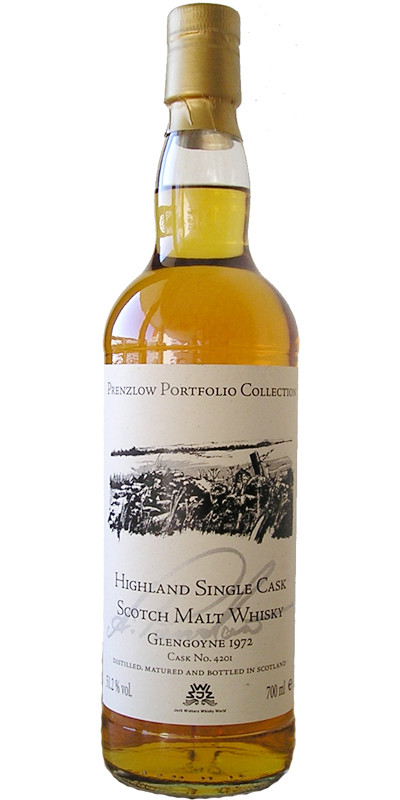 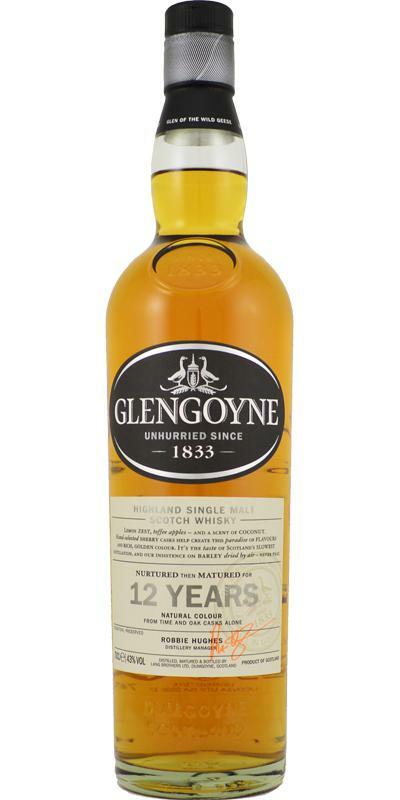 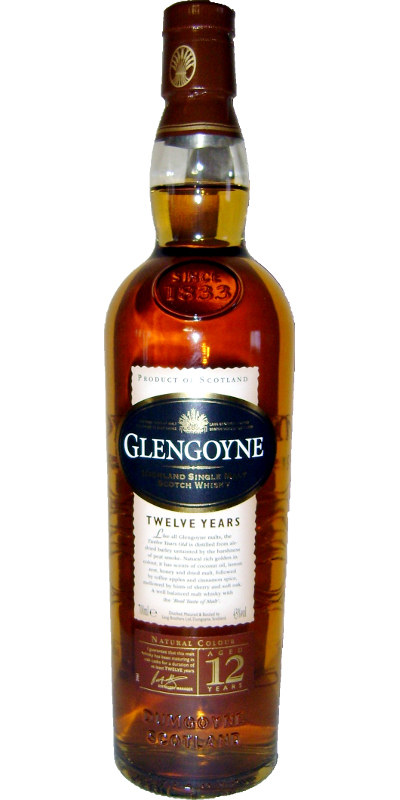 Glengoyne 17-year-old Wk Uncollectable Collection 17 58.0 % Vol.